Similar to stenciling, the Handschiegl process was applied mechanically to manually defined image parts. 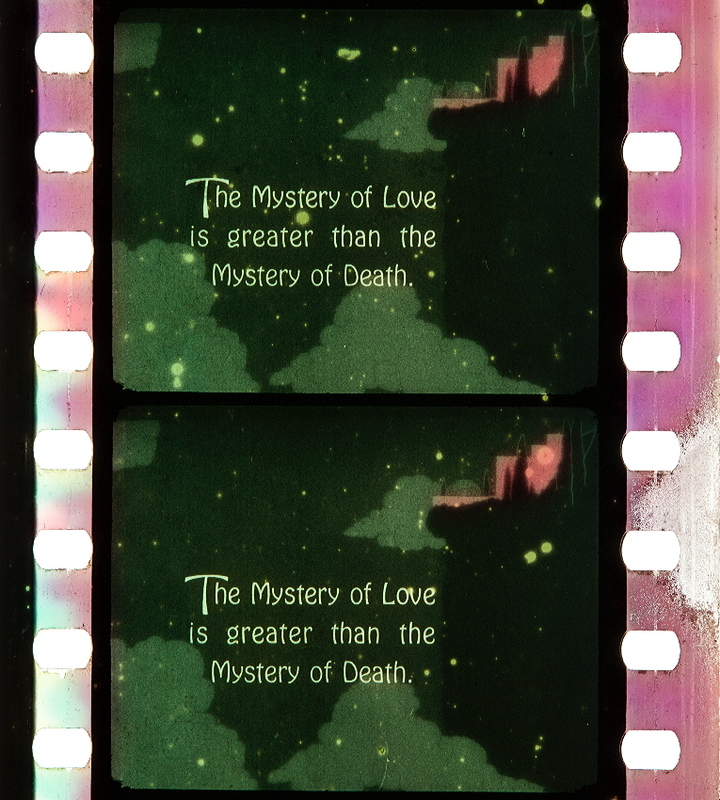 Therefore it is an applied color process. 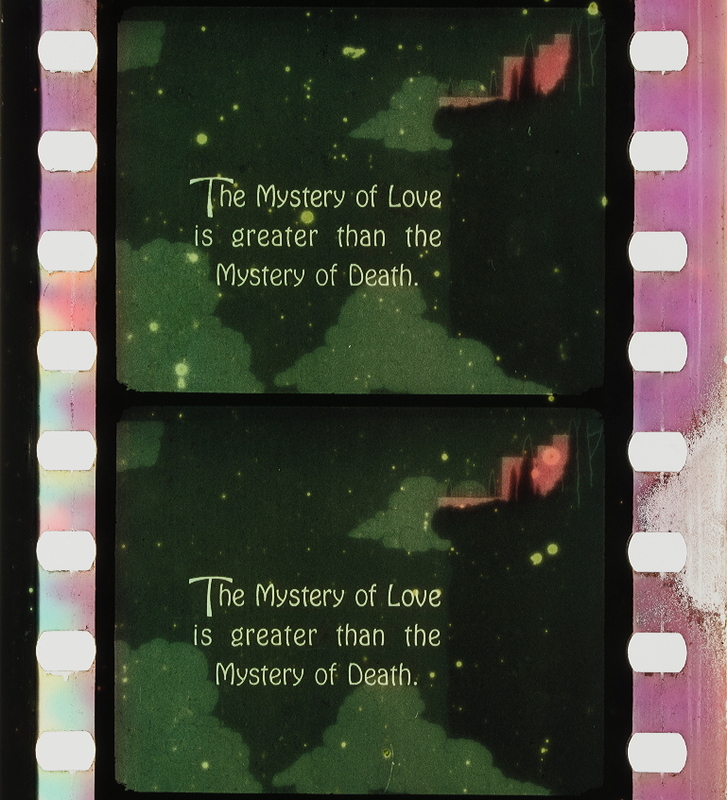 After the film was shot and edited, for each color applied a separate print was made. 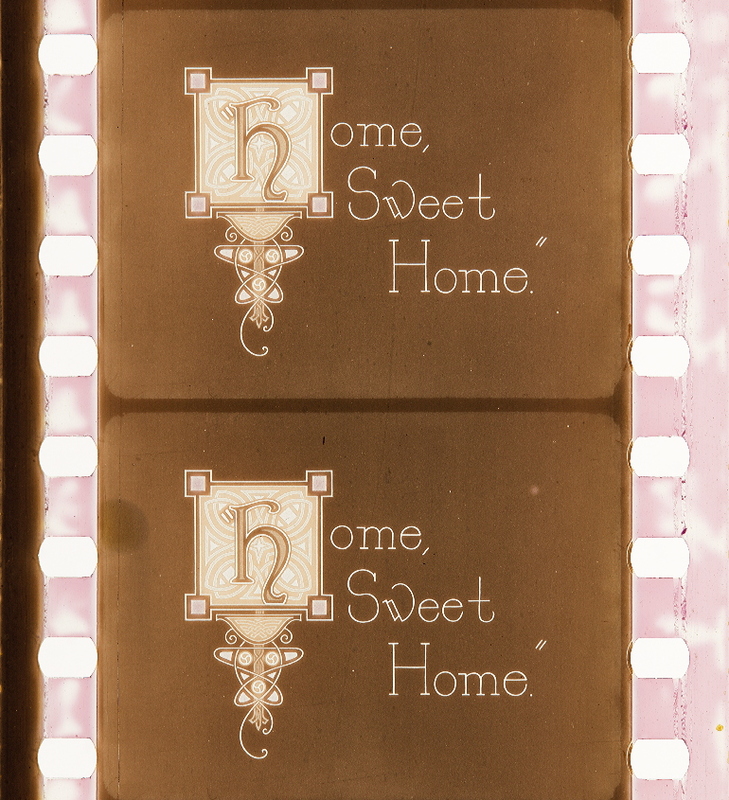 In contrast to stenciling, the image parts which were to be colored were covered with an opaque paint. Subsequently a dupe-negative was made. A tanning developer hardened the gelatin in the exposed areas while leaving the blocked-out areas soft. The softer parts absorbed the acid dyes which were then transferred onto the positive print during an imbibition process. 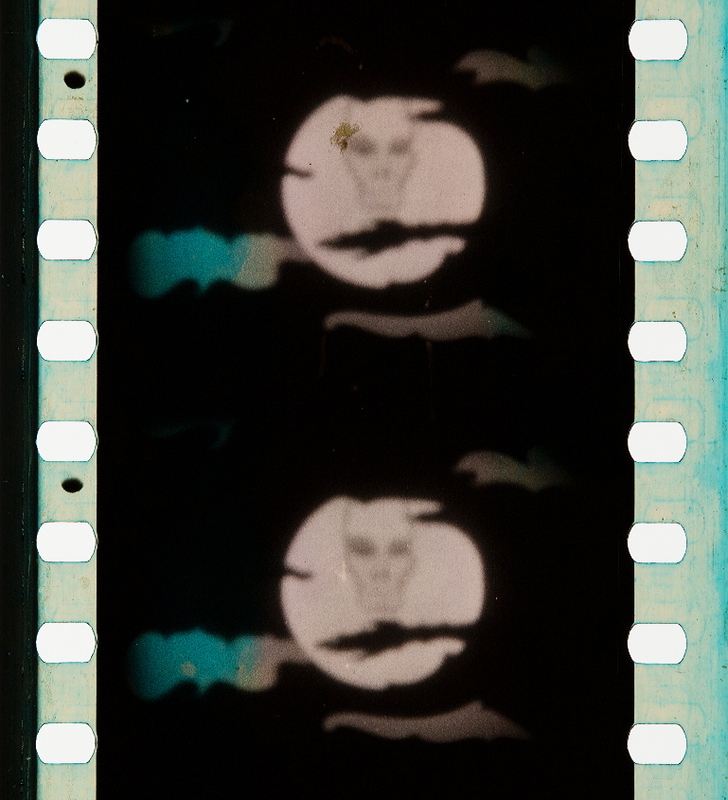 Usually up to three colors were applied to a film. The process allowed for subtle blending of different colors. 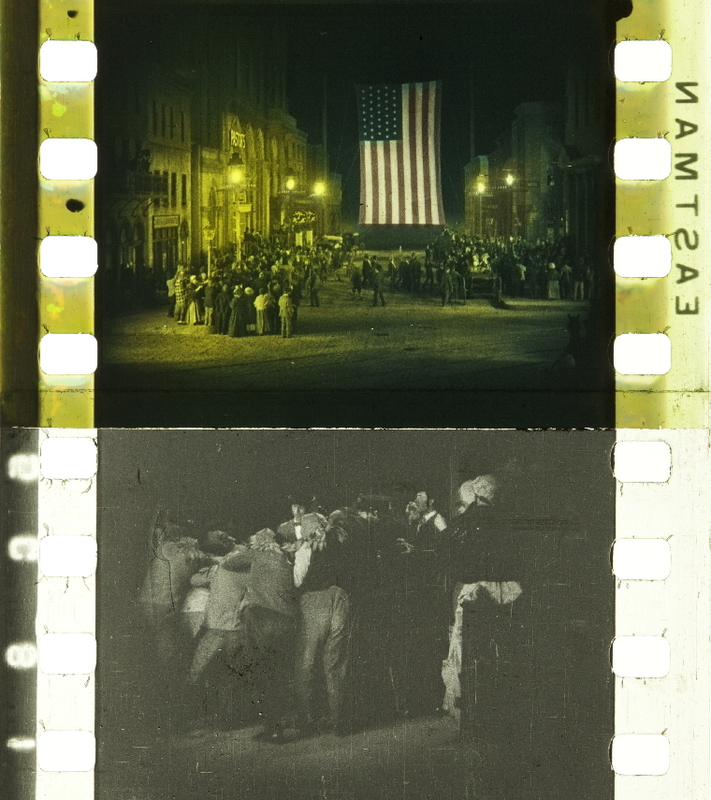 Black-and-white with Handschiegl in Lights of Old Broadway (USA 1925, Monta Bell). 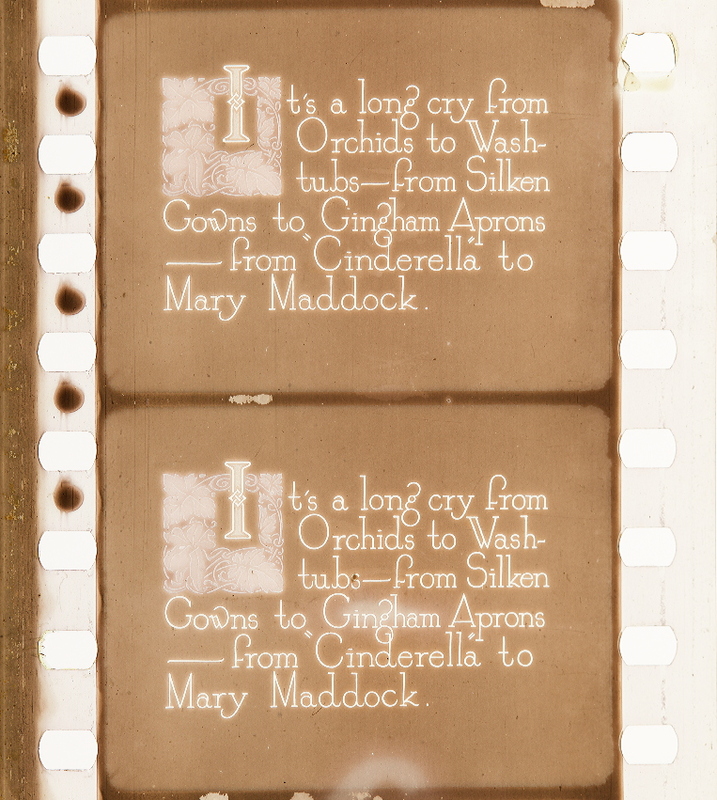 Credit: Library of Congress. 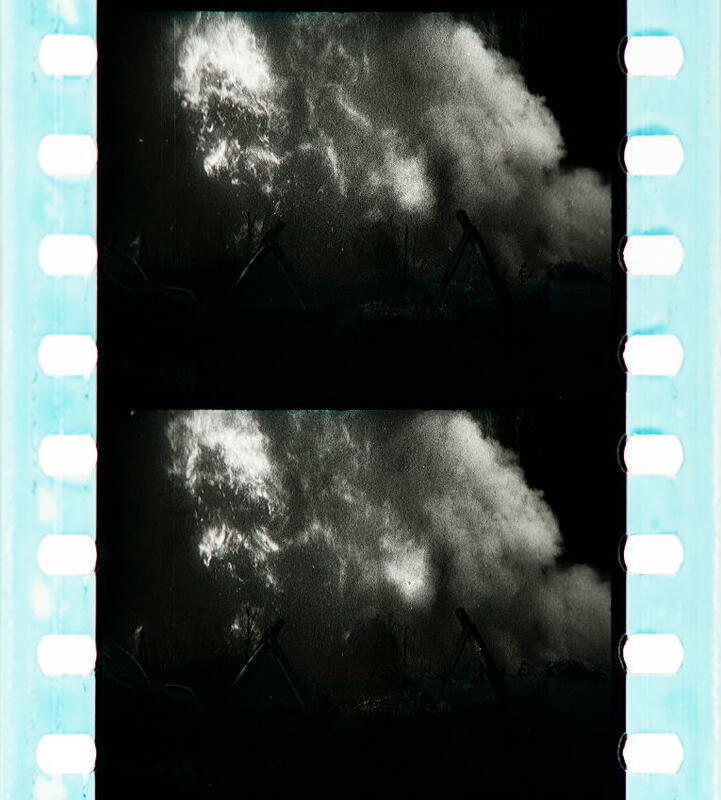 Photograph of the nitrate print by Barbara Flueckiger. Credit: Geo. 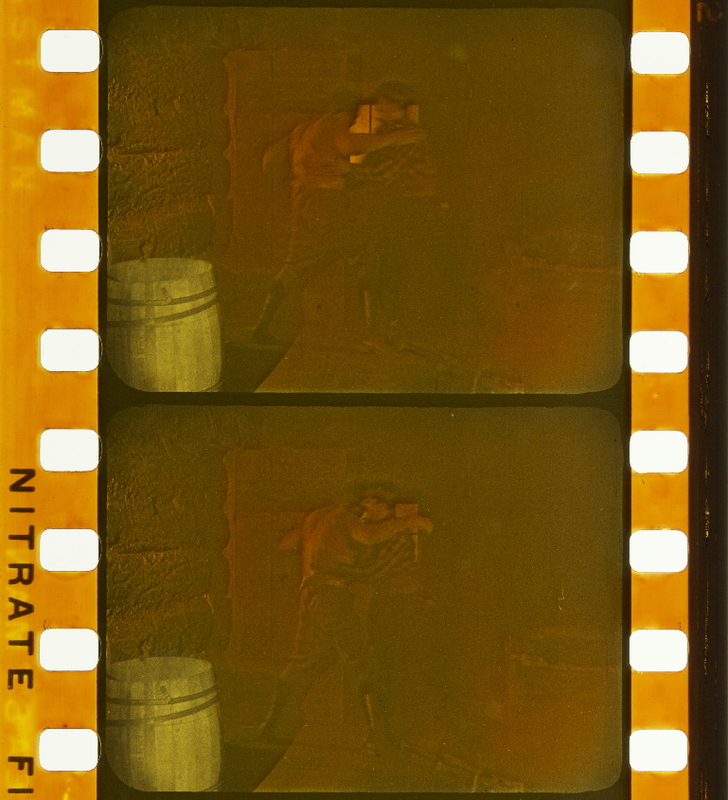 Willeman, Nitrate Film Vault Manager, Library of Congress. 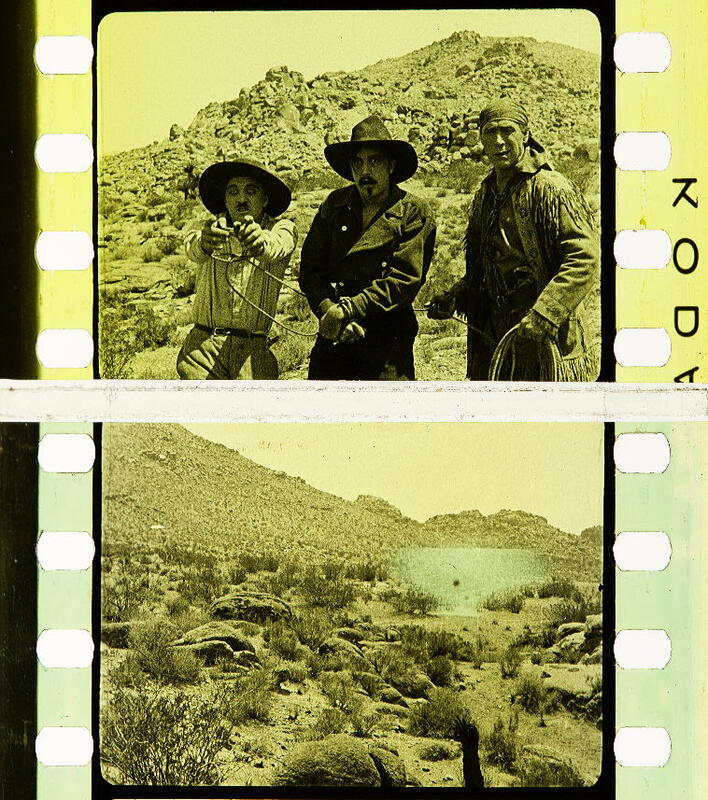 Film: Trail of ’98 (USA 1929, Clarence Brown). Credit: Paolo Cherchi Usai. 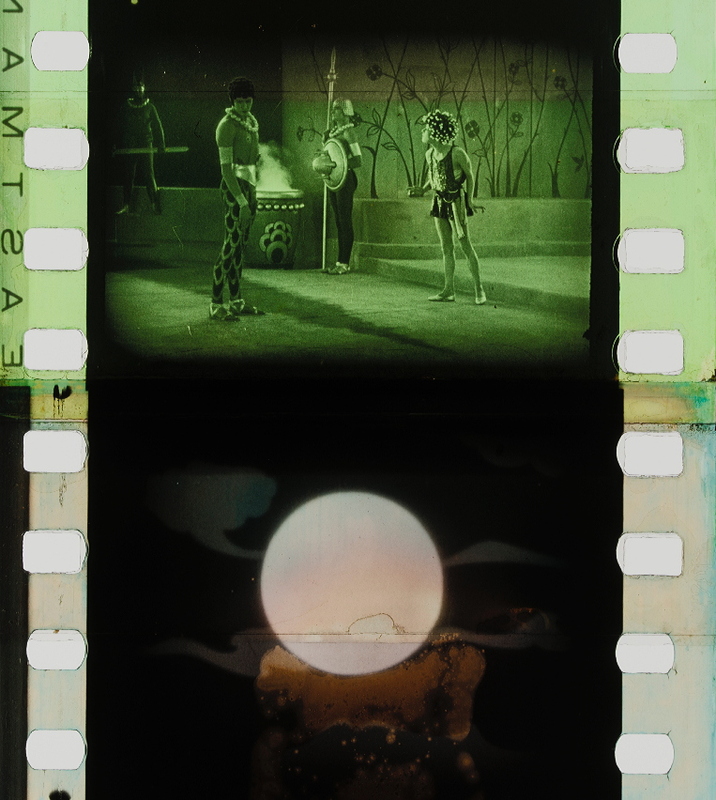 Source: Cherchi Usai, Paolo (2000): Silent Cinema. London: BFI. 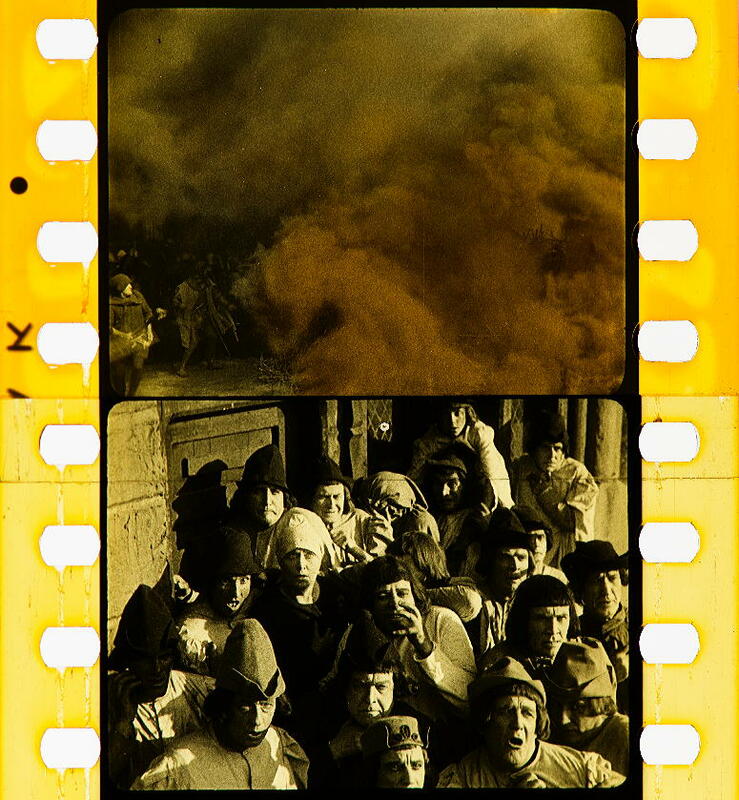 Film: Greed (USA 1925, Erich von Stroheim). Credit: Geo. 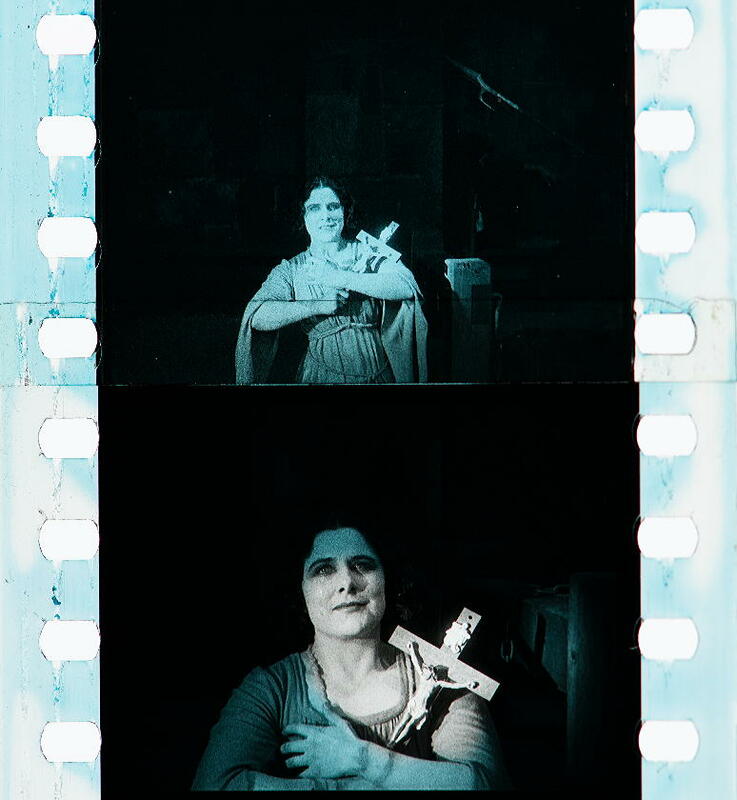 Willeman, Nitrate Film Vault Manager, Library of Congress. 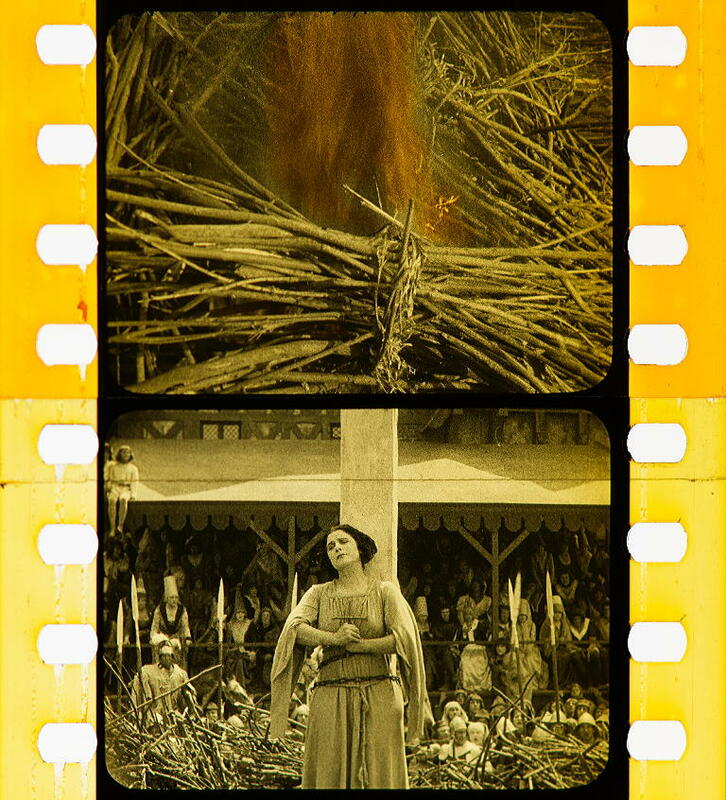 Film: Forbidden Fruit (USA 1921, Cecil B. DeMille). 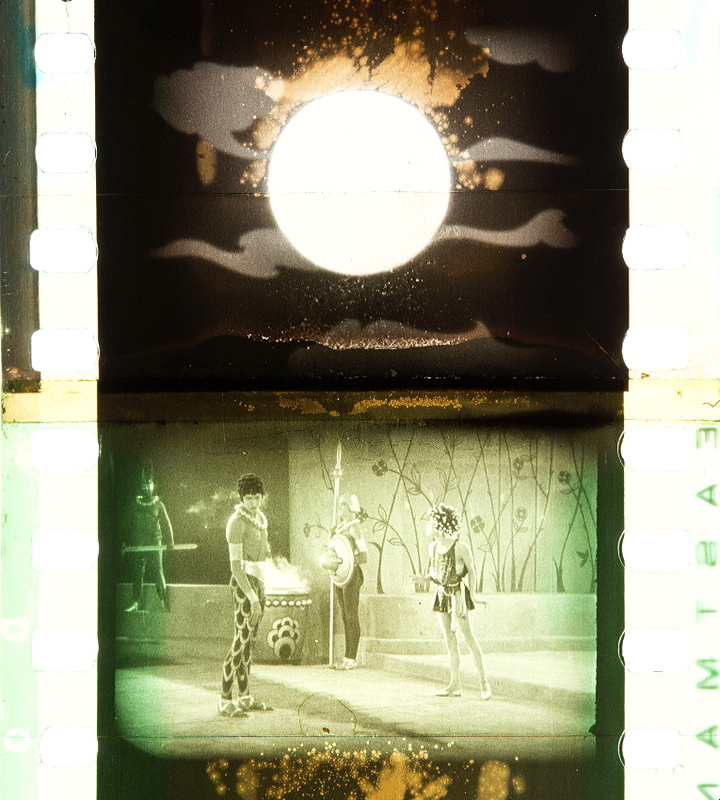 Source: Ryan, Roderick T. (1977): A History of Motion Picture Color Technology. London: Focal Press, p. 24. 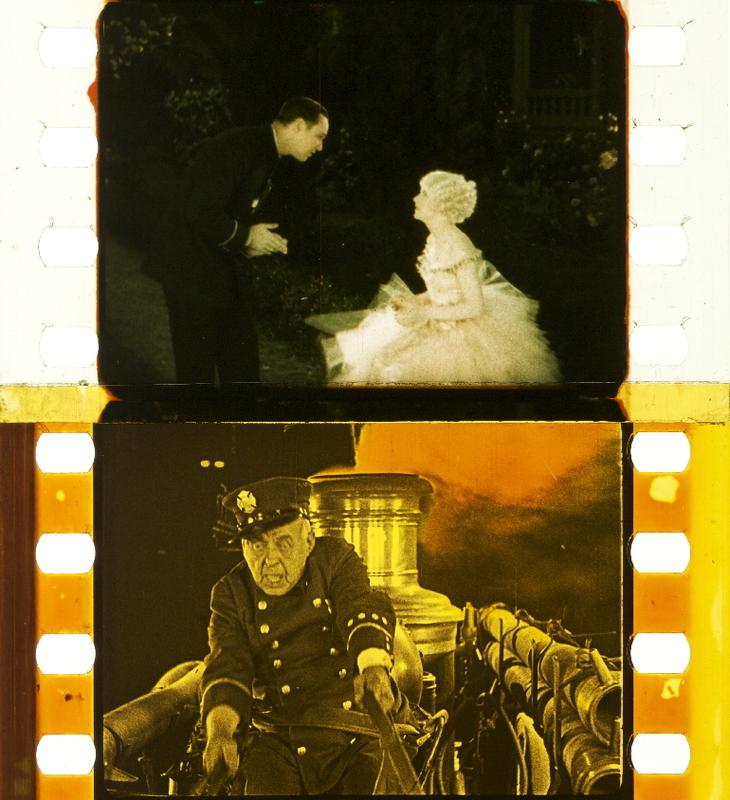 Images courtesy of the 20th Century Fox Collection at the Academy Film Archive. Photography by Barbara Flueckiger. 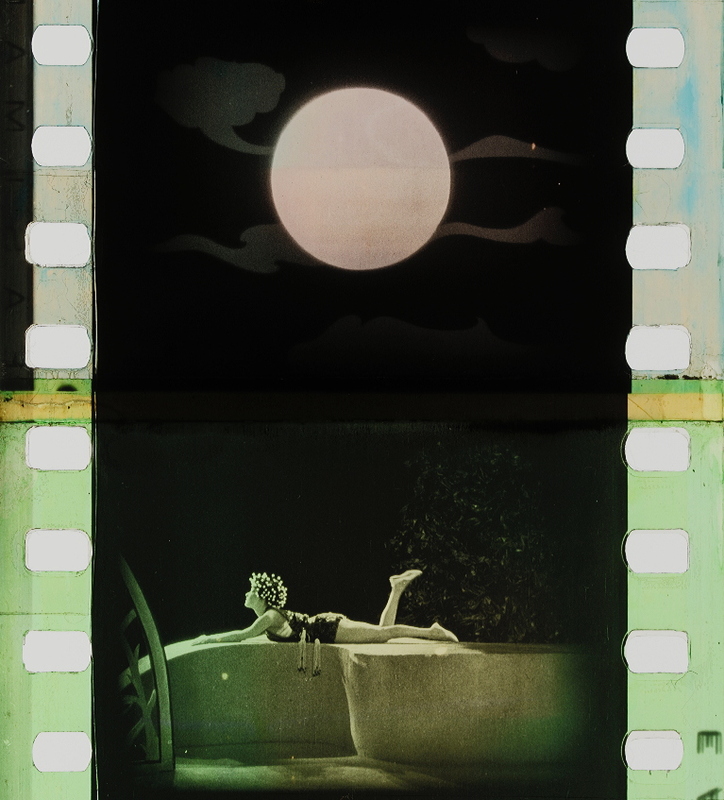 Credit: Image courtesy of the 20th Century Fox Collection at the Academy Film Archive. 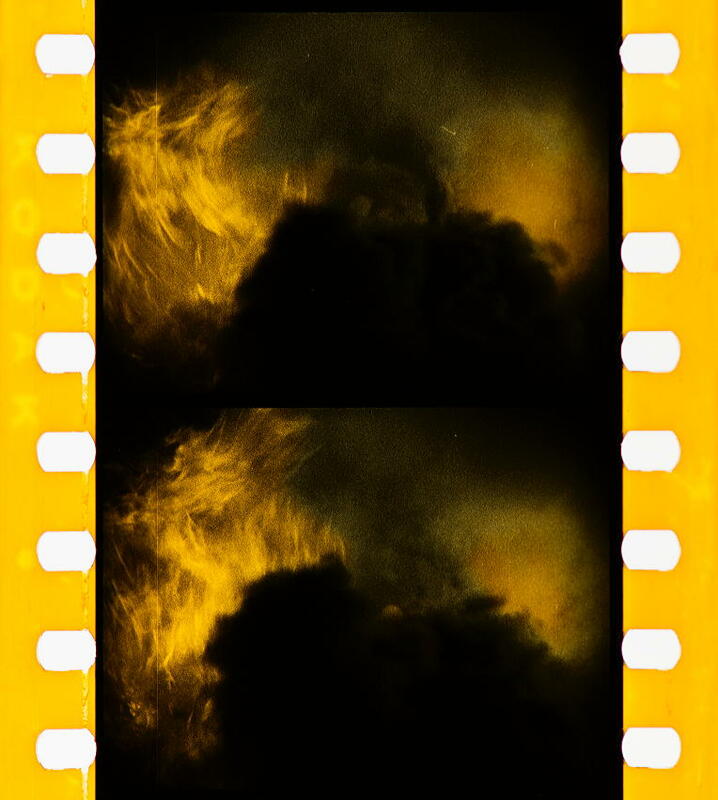 Film: Flames. Photograph by Barbara Flueckiger. Handschiegl segments are combined with Technicolor No. III, see gallery. Credit: Library of Congress. Photographs by Barbara Flueckiger. 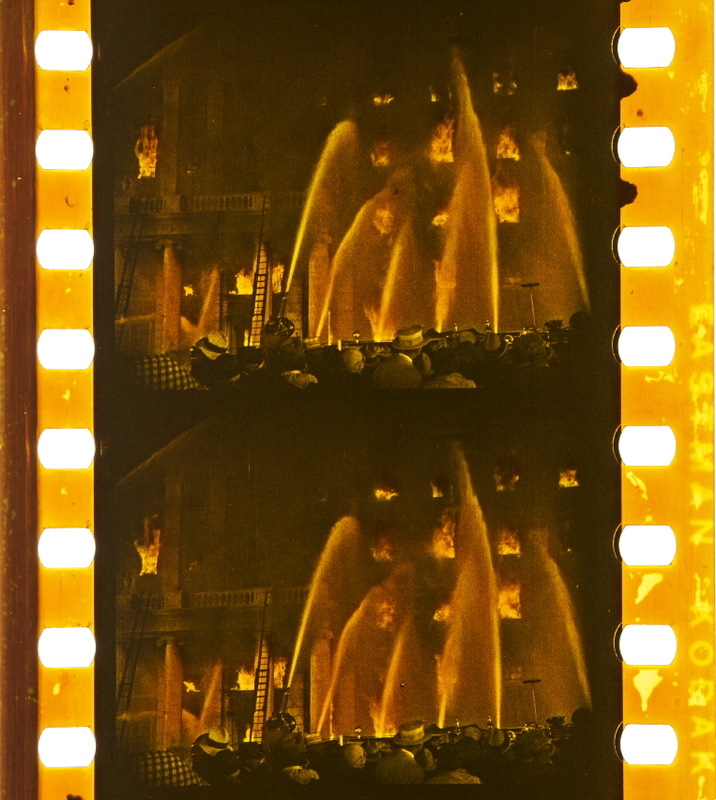 Film: The Fire Brigade (1926?). Credit: Library of Congress. 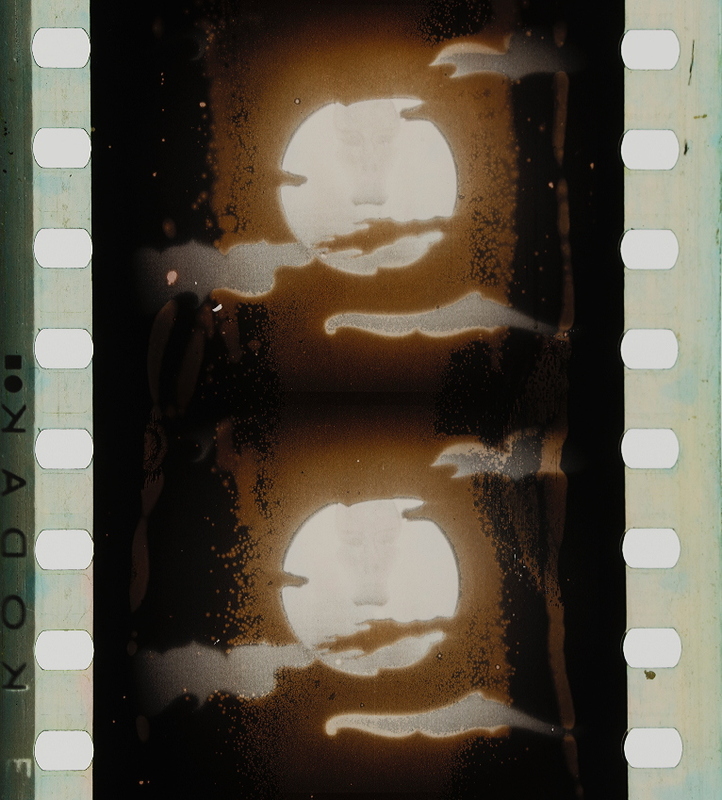 Photograph of the nitrate print by Barbara Flueckiger. Technicolor No. III in combination with Handschiegl (below). 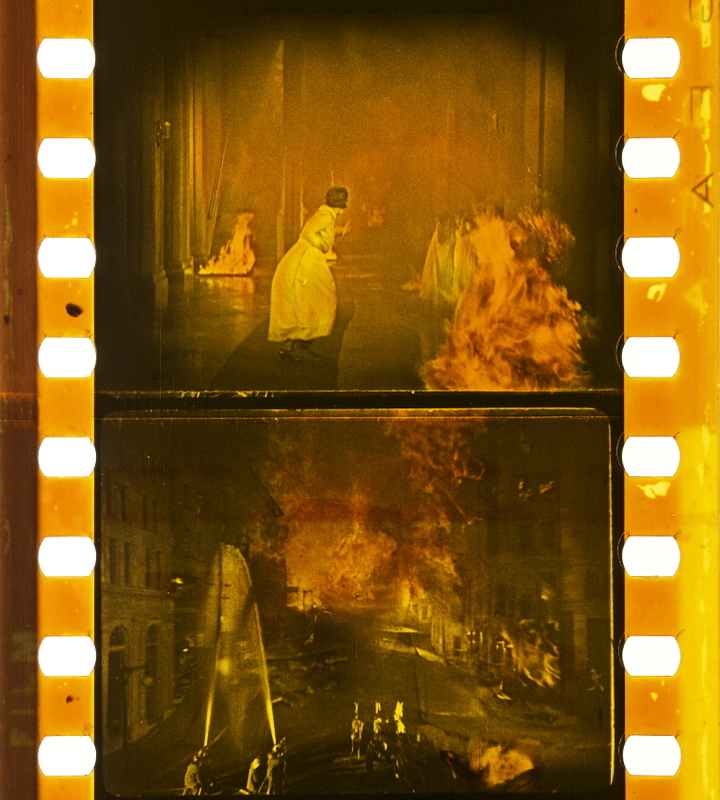 Film: The Fire Brigade (1926?). 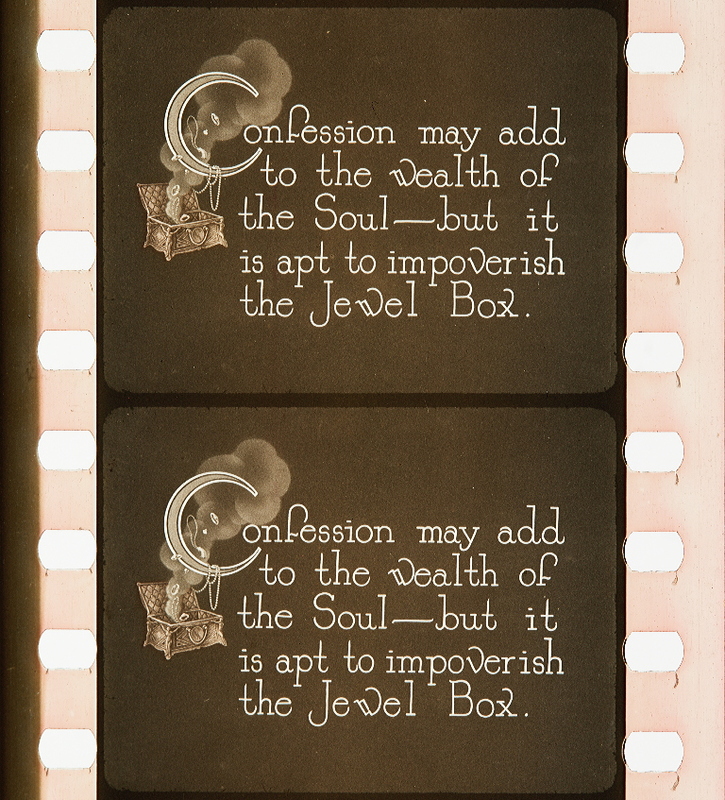 Credit: Library of Congress. 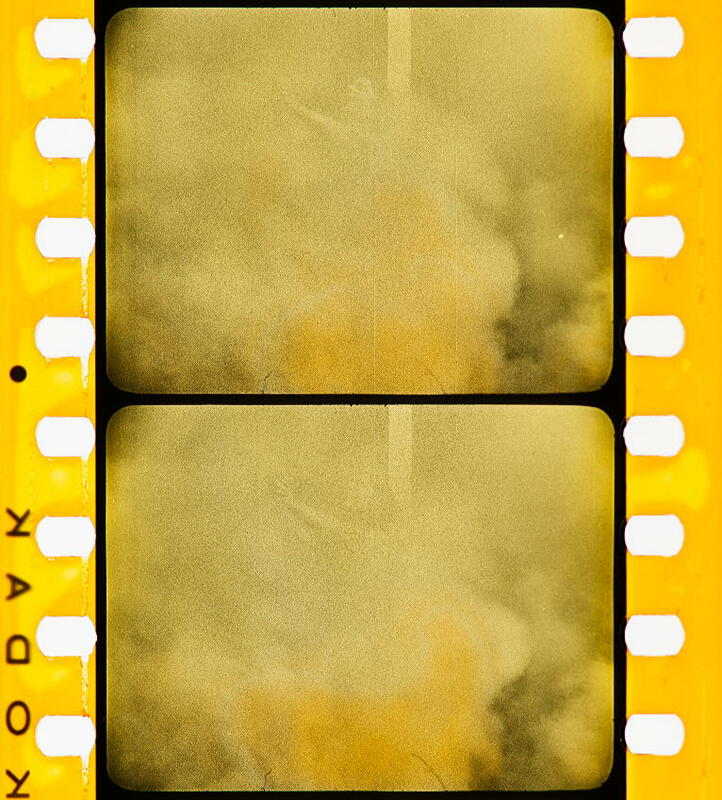 Photograph of the nitrate print by Barbara Flueckiger. Lights of Old Broadway (USA 1925, Monta Bell). 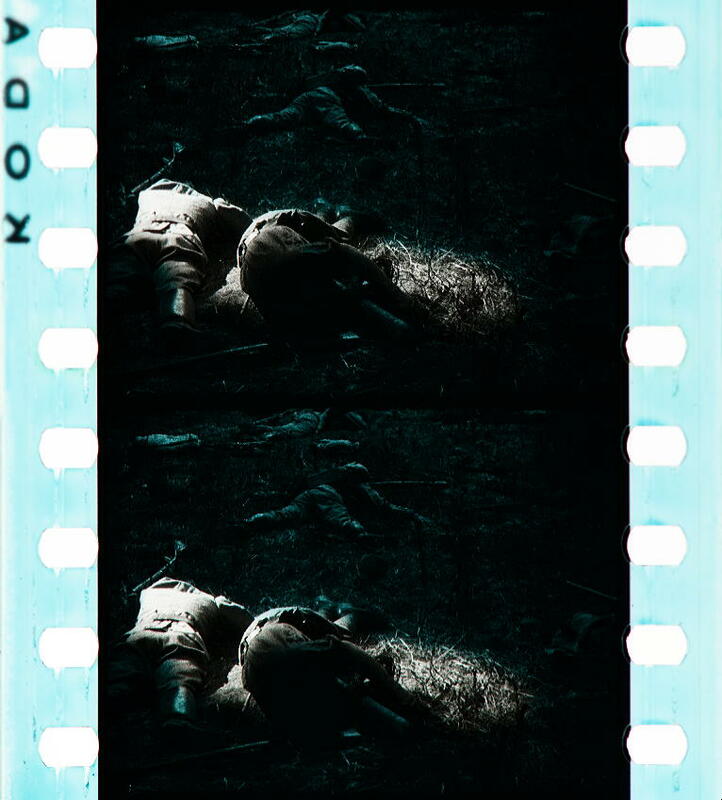 A short segment in Handschiegl is combined with a longer segment in Technicolor No. II, see gallery. Credit: Library of Congress. 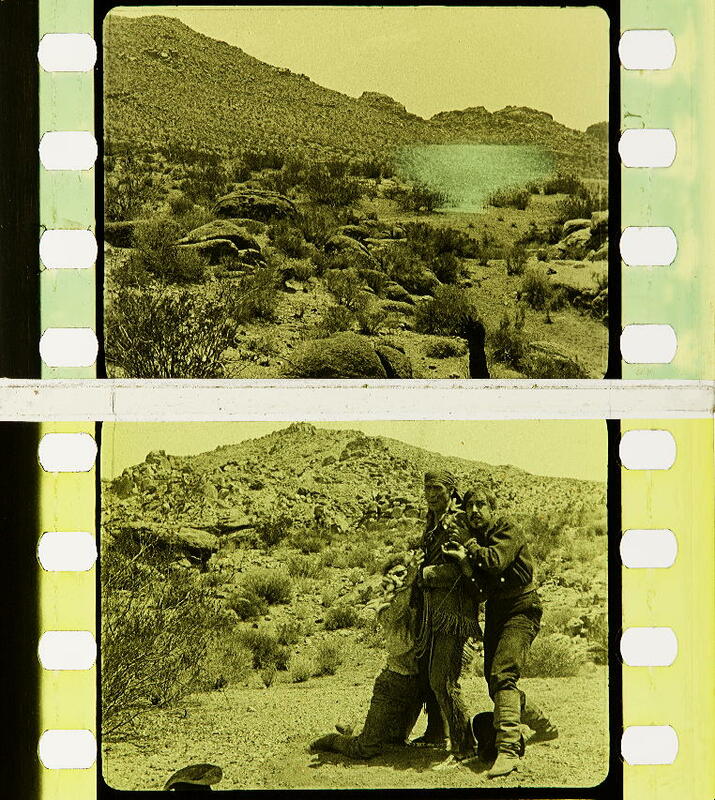 Photographs of the nitrate print by Barbara Flueckiger. 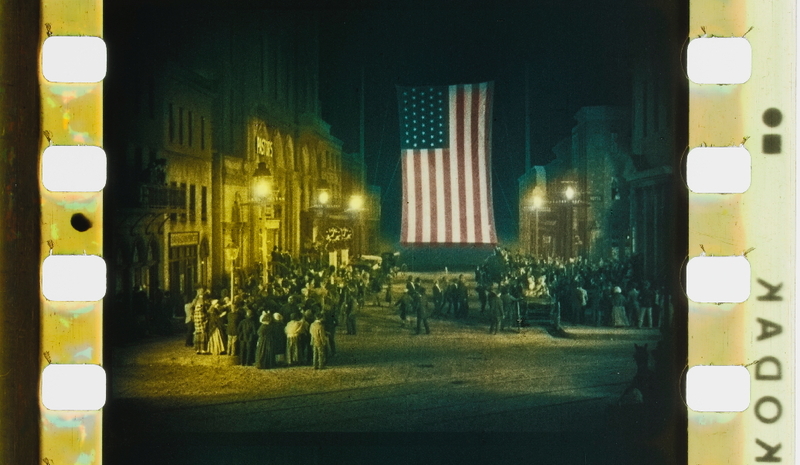 Lights of Old Broadway (USA 1925, Monta Bell). 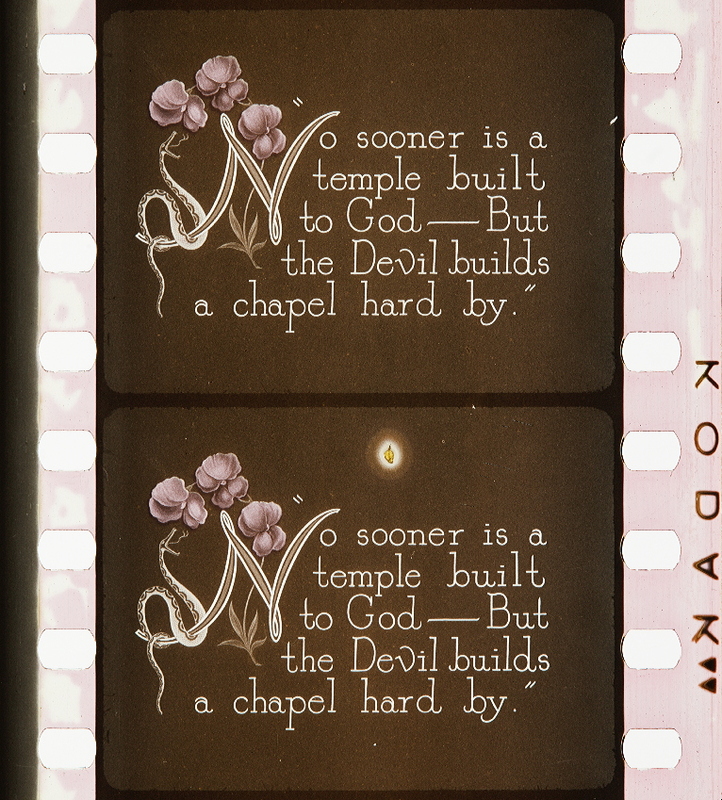 Credit: Library of Congress. 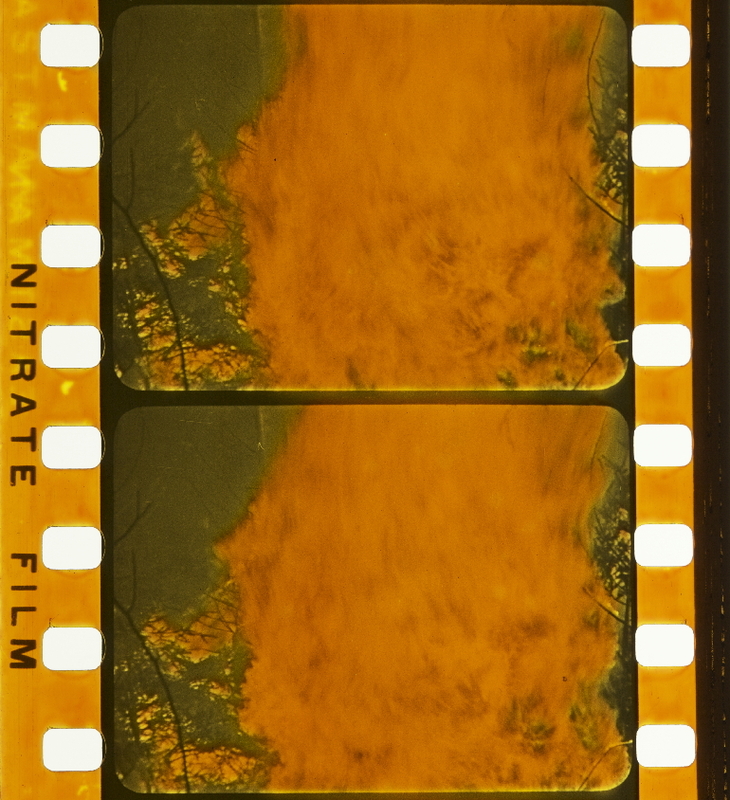 Photograph of the nitrate print by Barbara Flueckiger. Wagon Tracks (USA 1919, Lambert Hillyer). 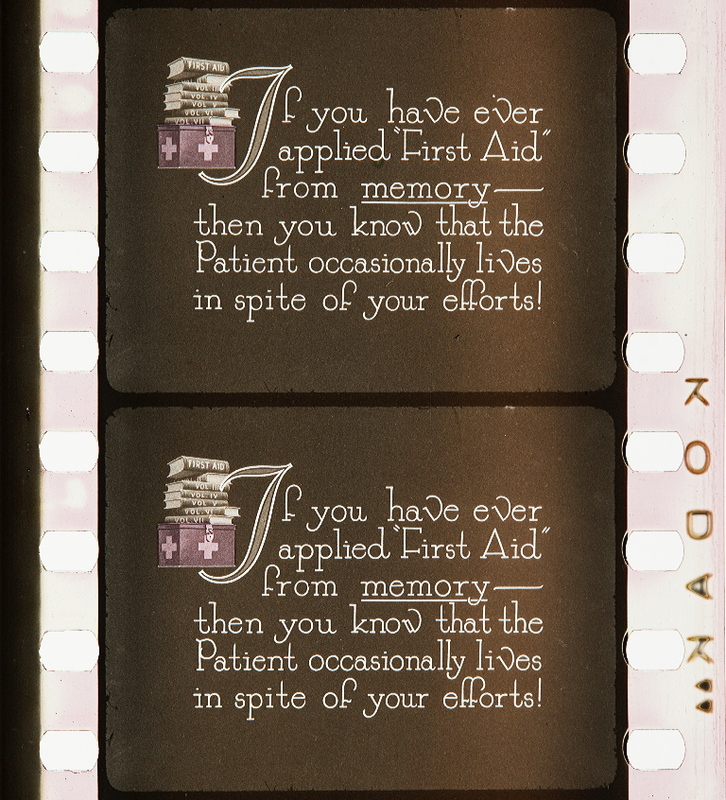 Credit: Library of Congress. 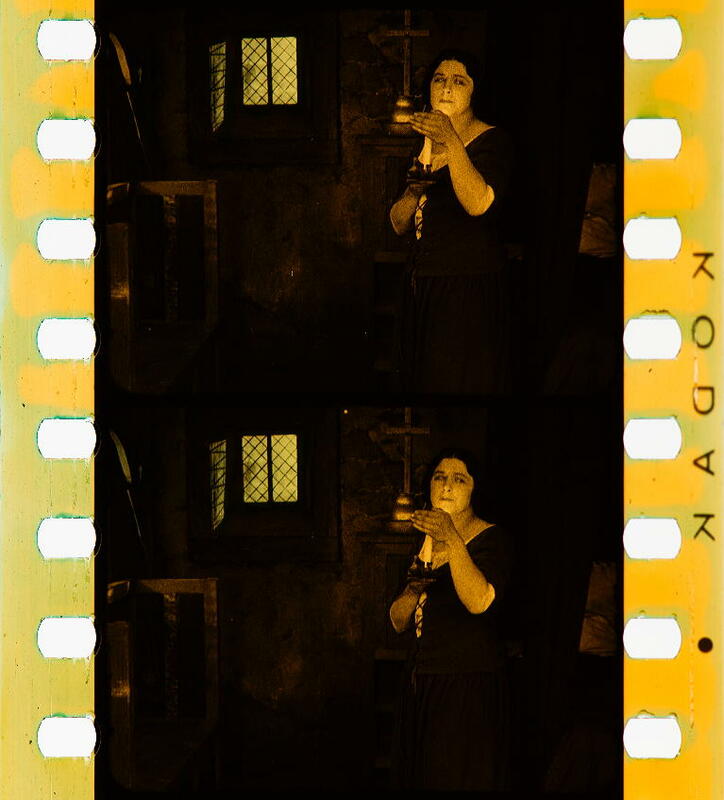 Photographs of the tinted and Handschiegl nitrate print by Olivia Kristina Stutz, ERC Advanced Grant FilmColors. 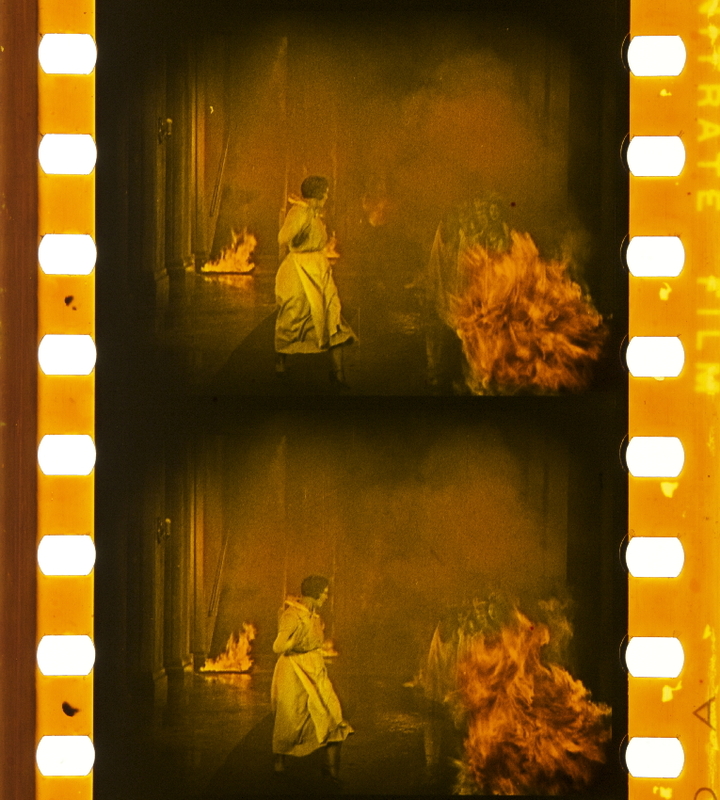 Joan the Woman (USA 1916, Cecil B. DeMille). 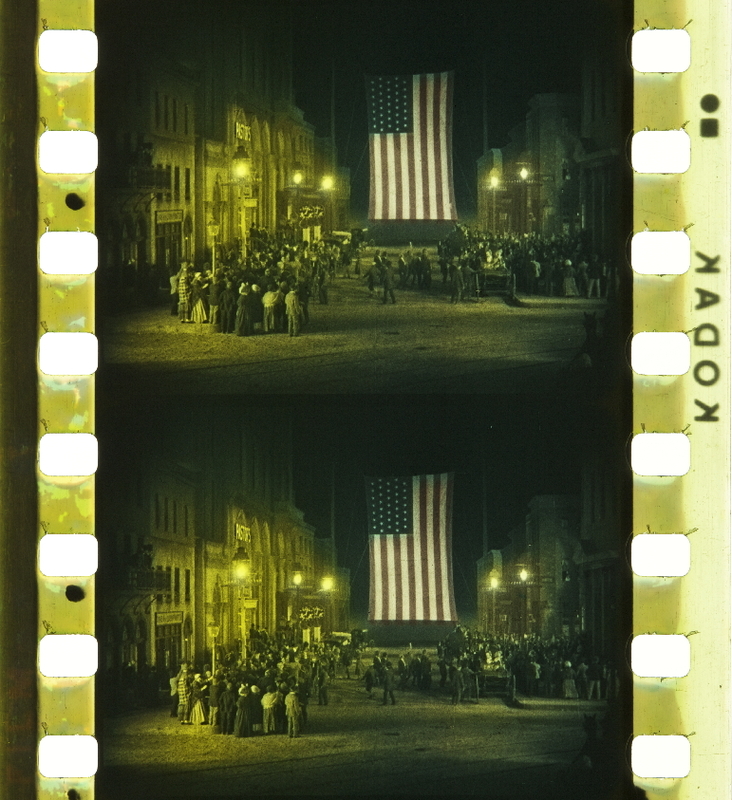 Credit: George Eastman Museum. 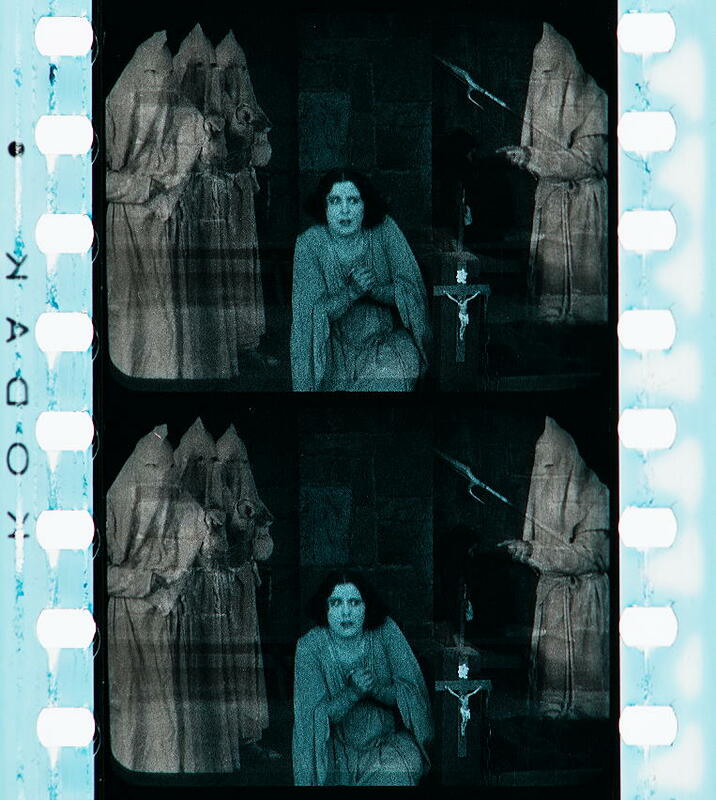 Photographs of the tinted, toned and Handschiegl nitrate print from 1916 and 1920 by Olivia Kristina Stutz, ERC Advanced Grant FilmColors. 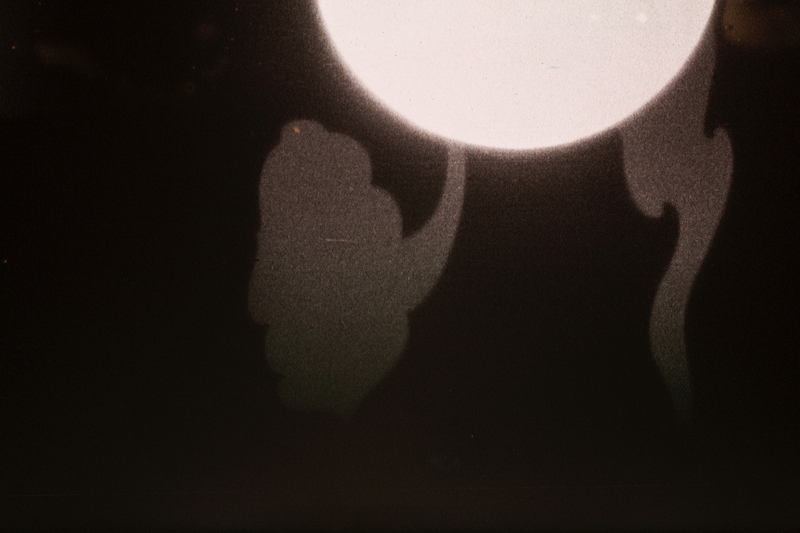 See all tinted images here. 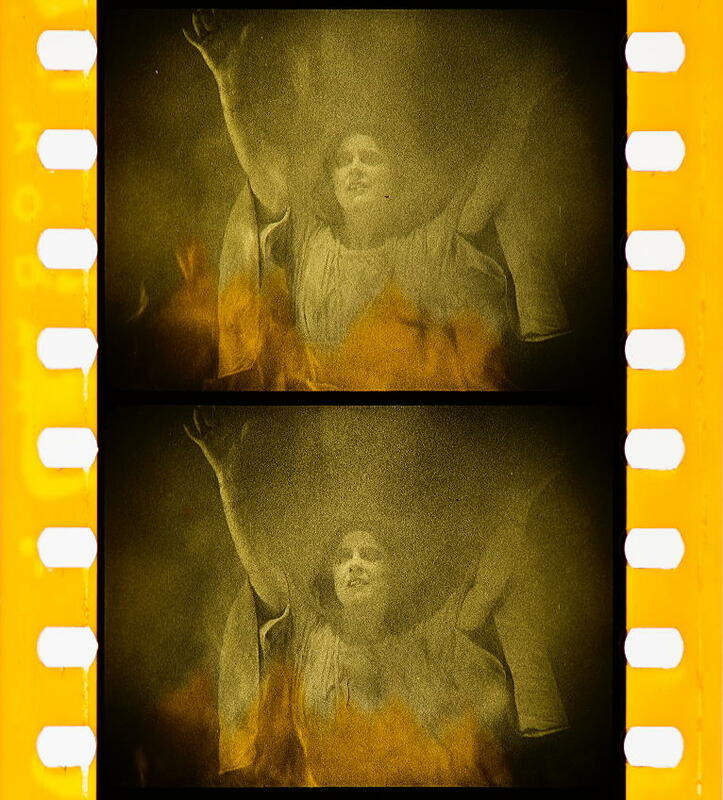 Joan the Woman (USA 1916, Cecil B. DeMille). 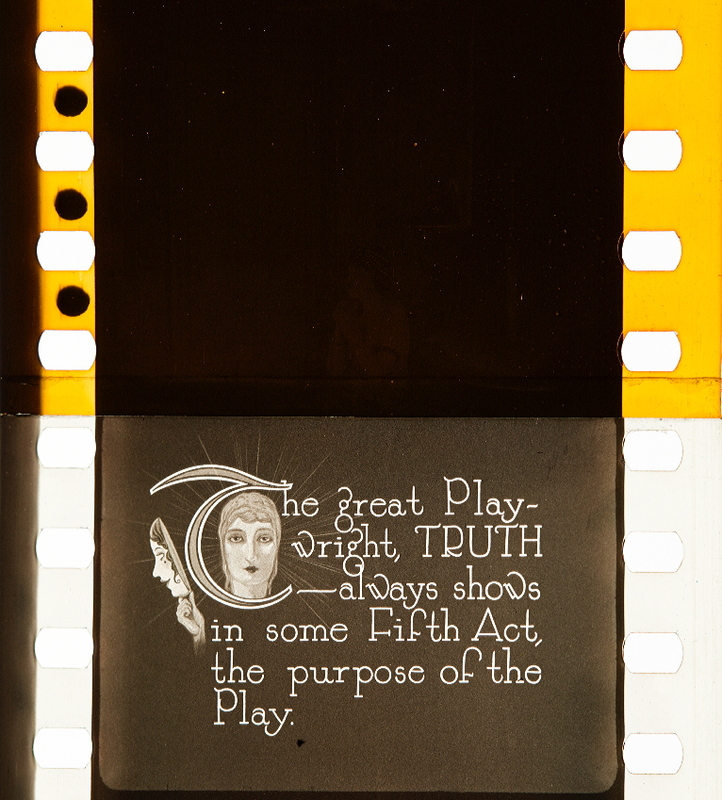 Credit: George Eastman Museum. 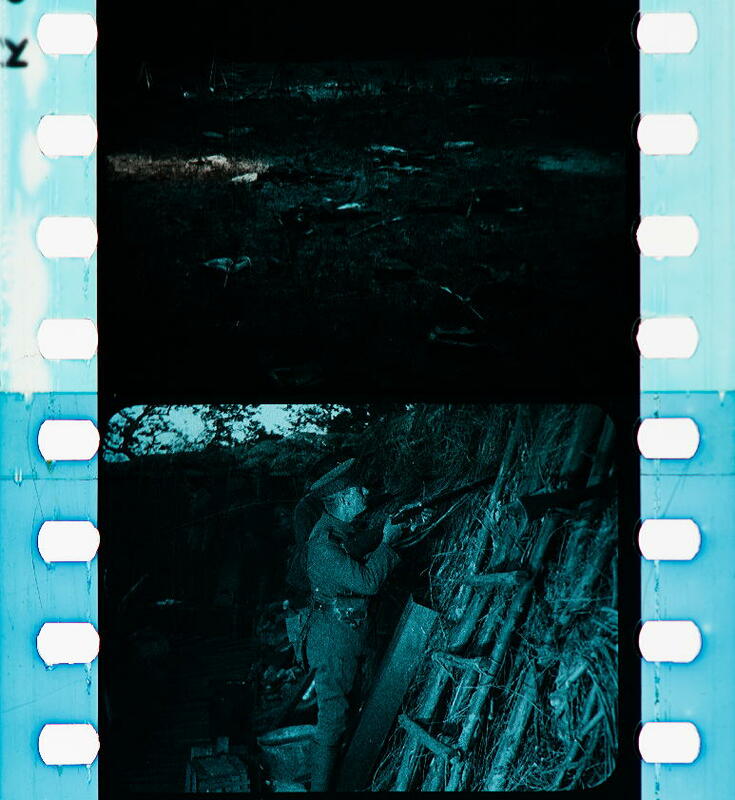 Photographs of the Handschiegl nitrate print from 1916 and 1920 by Olivia Kristina Stutz, ERC Advanced Grant FilmColors. 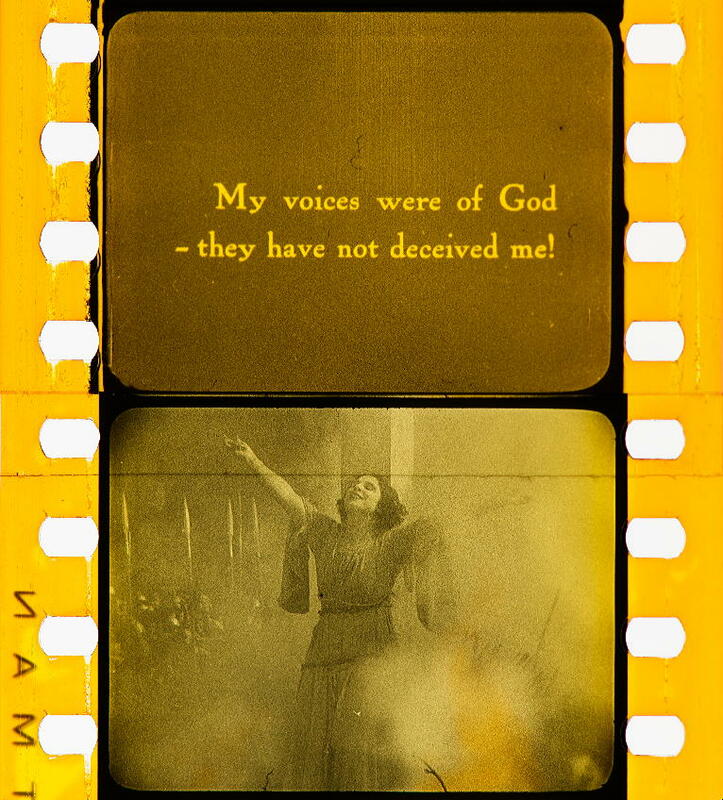 Joan the Woman (USA 1916, Cecil B. DeMille). 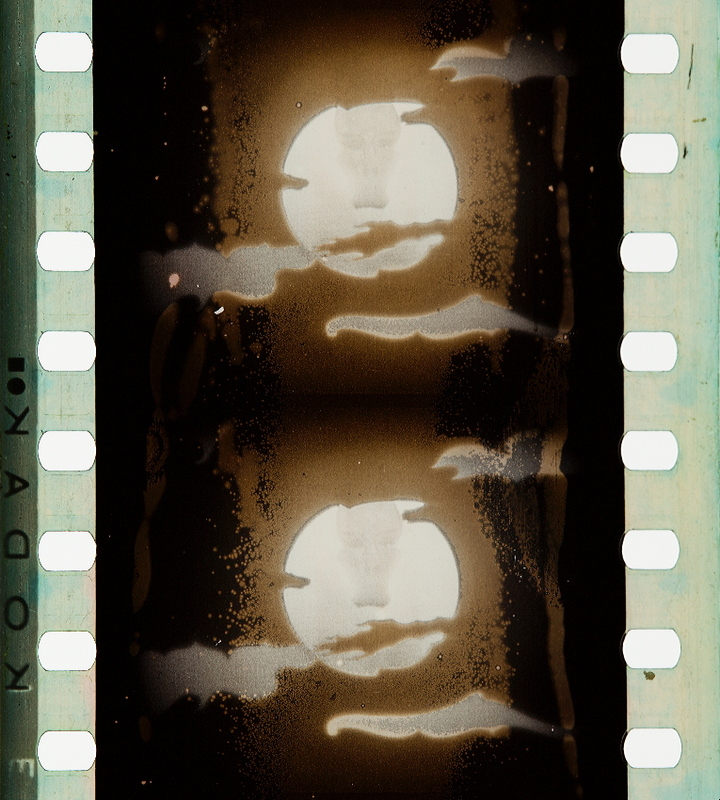 Credit: George Eastman Museum. 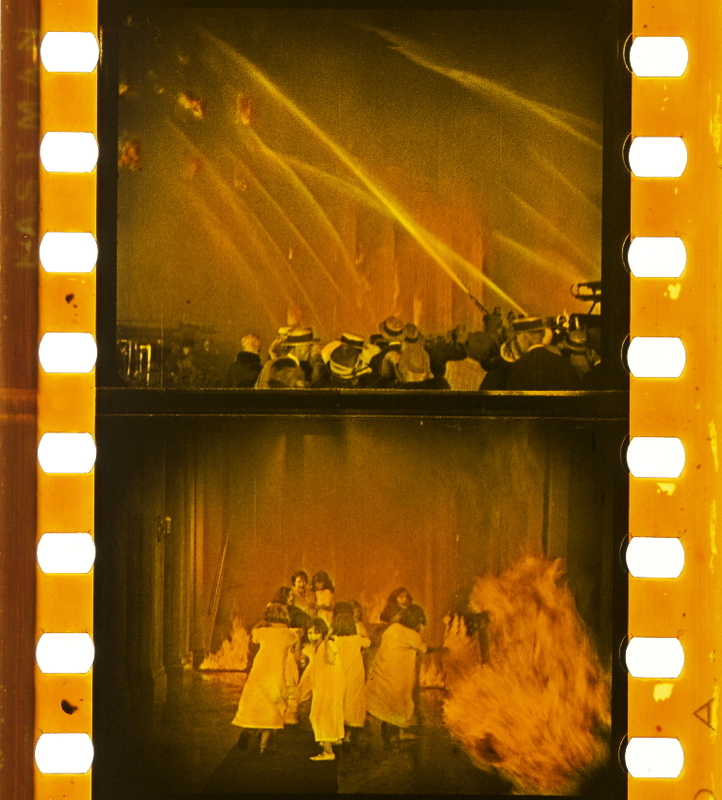 Photographs of the tinted and Handschiegl nitrate print from 1916 and 1920 by Olivia Kristina Stutz, ERC Advanced Grant FilmColors. 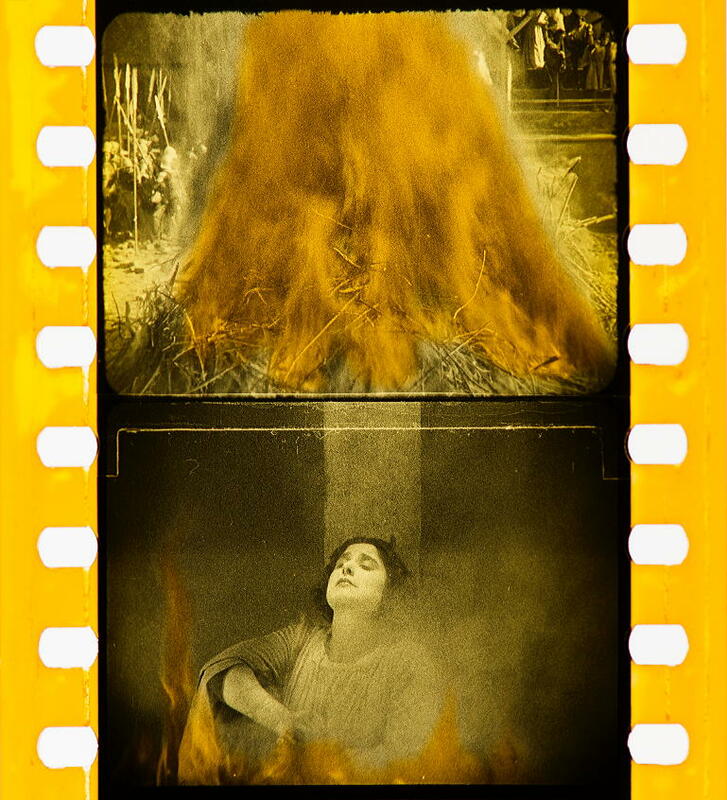 Forbidden Fruit (USA 1921, Cecil B. DeMille). 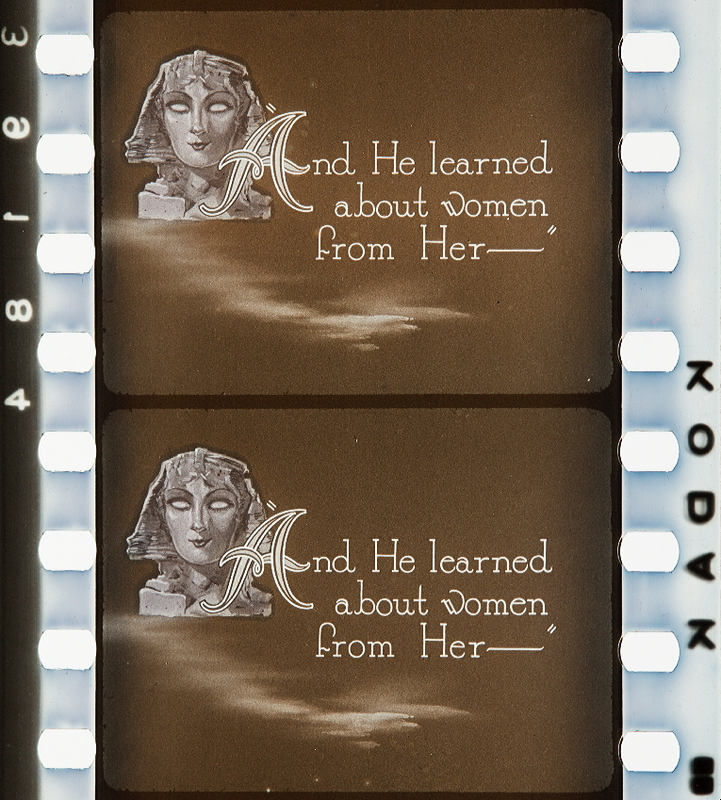 Credit: Library of Congress. 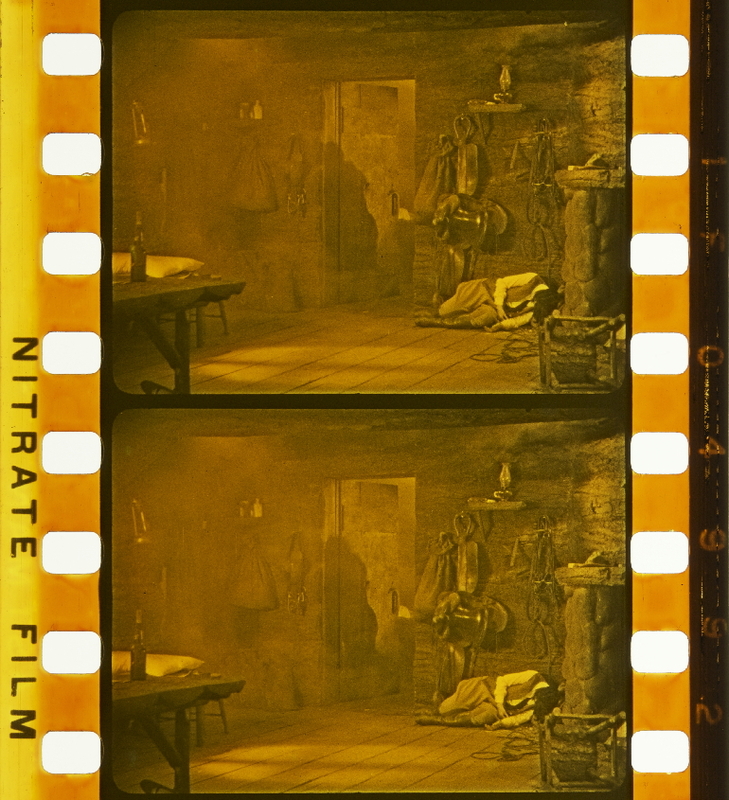 Photographs of the toned and Handschiegl nitrate print from 1920 by Olivia Kristina Stutz, ERC Advanced Grant FilmColors. 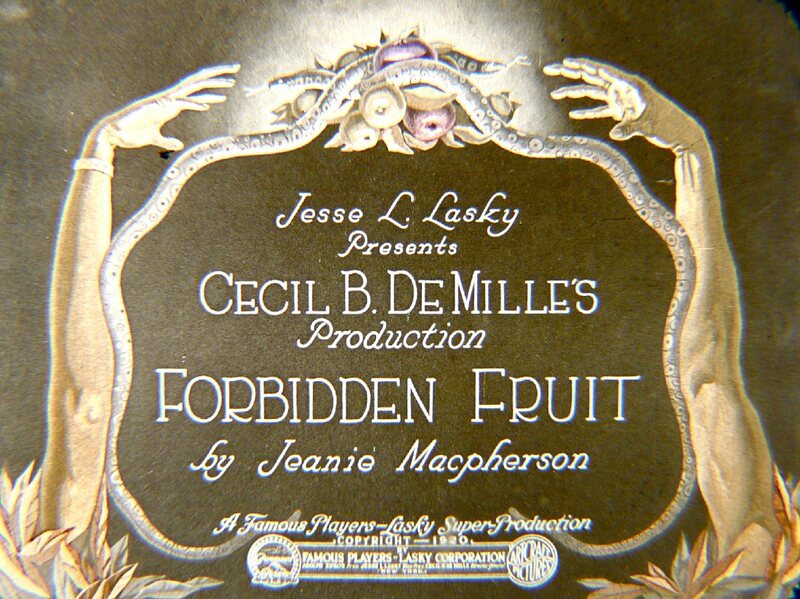 Forbidden Fruit (USA 1921, Cecil B. DeMille). Credit: Library of Congress. 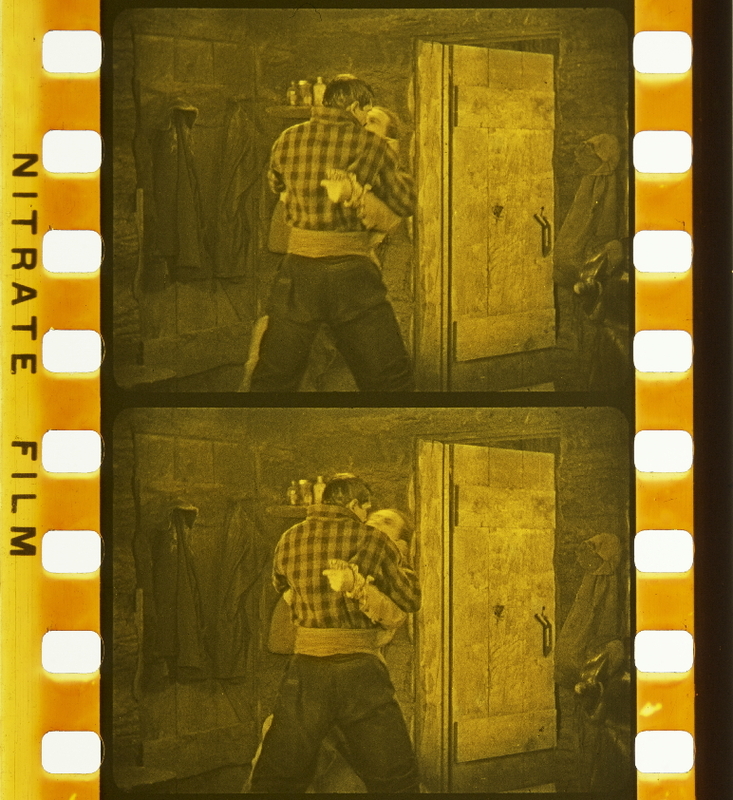 Photographs of the toned and Handschiegl nitrate print from 1920 by Olivia Kristina Stutz, ERC Advanced Grant FilmColors. 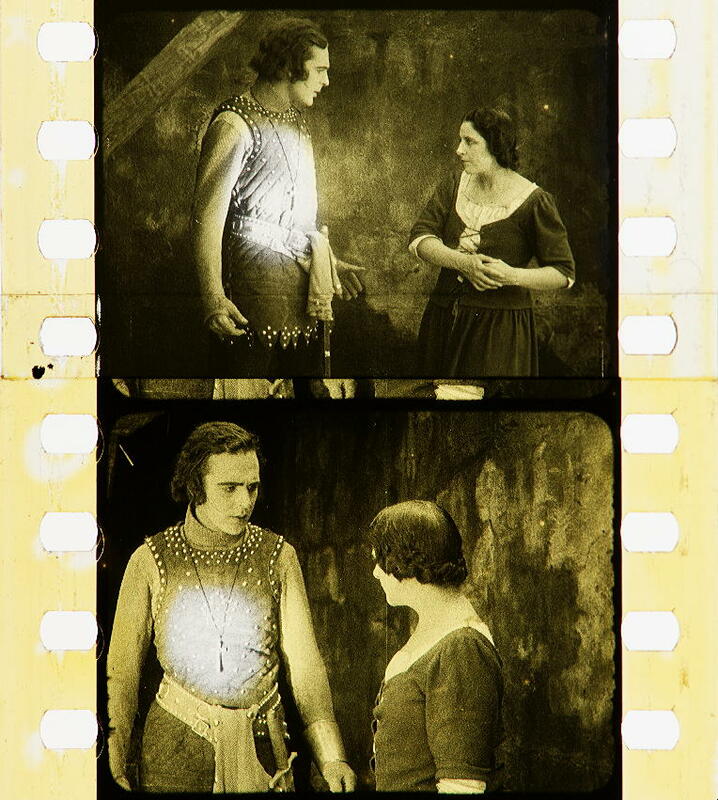 The Affairs of Anatol (USA 1921, Cecil B. DeMille). Photographs of the tinted and toned nitrate print with Handschiegl intertitles by Barbara Flueckiger. See full representation of reels no. 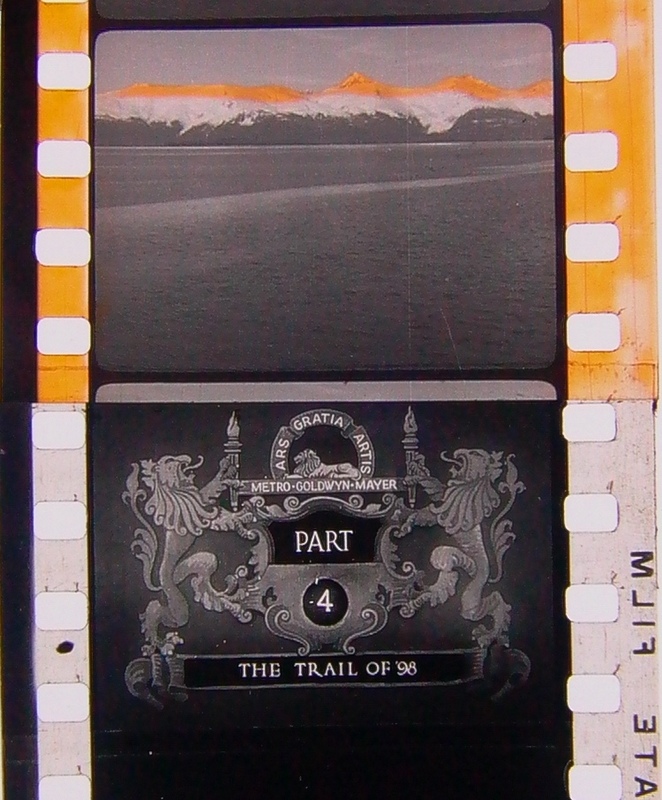 3 to 8 in the corresponding gallery on the tinting page. See toned images only here. 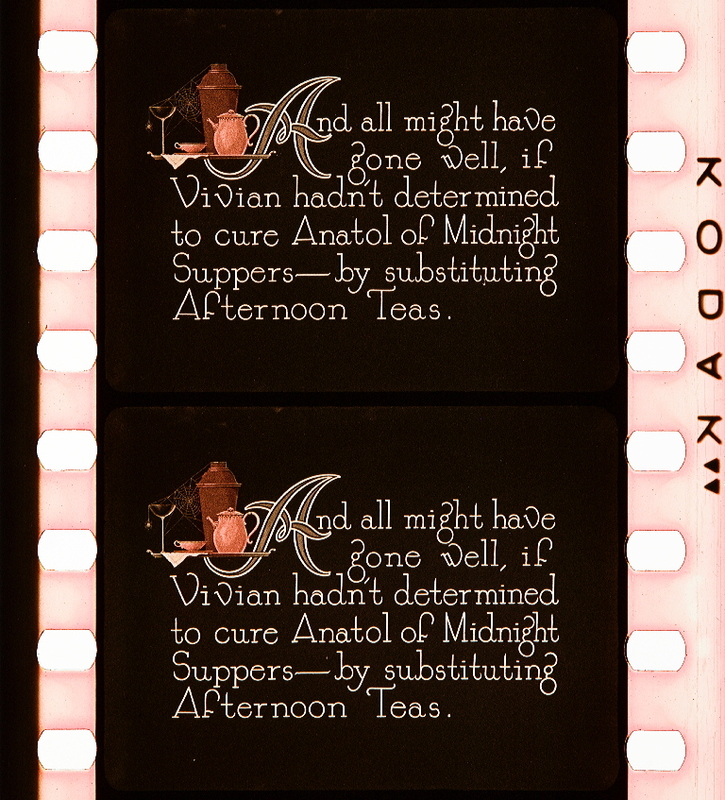 The Affairs of Anatol (USA 1921, Cecil B. DeMille). 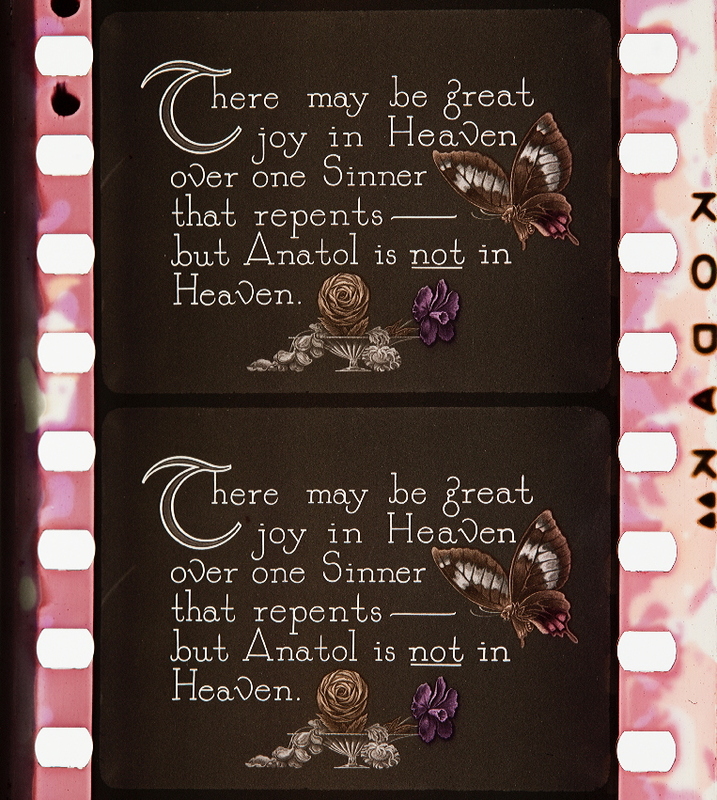 Credit: Library of Congress. 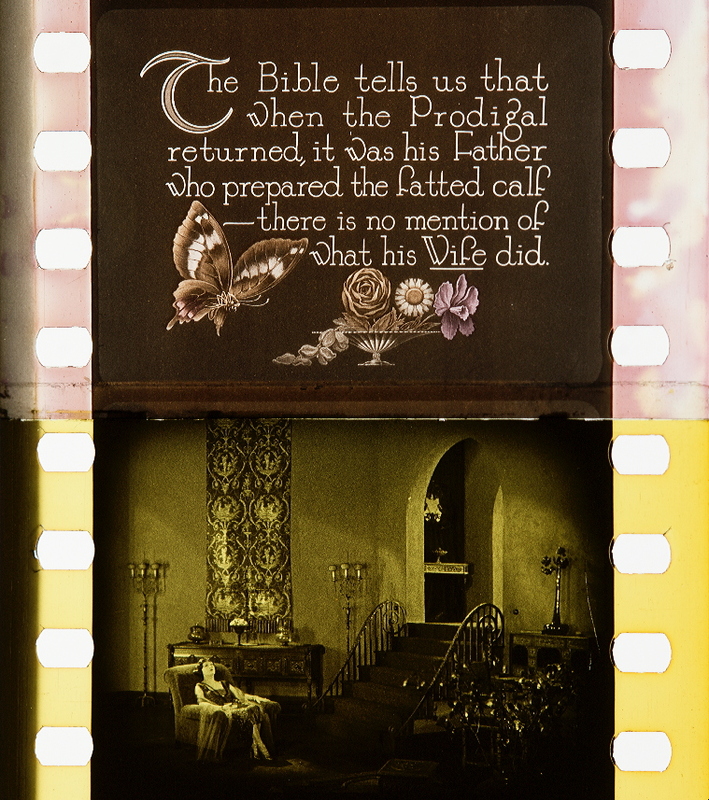 Photographs of the tinted and toned nitrate print with Handschiegl intertitles by Barbara Flueckiger. 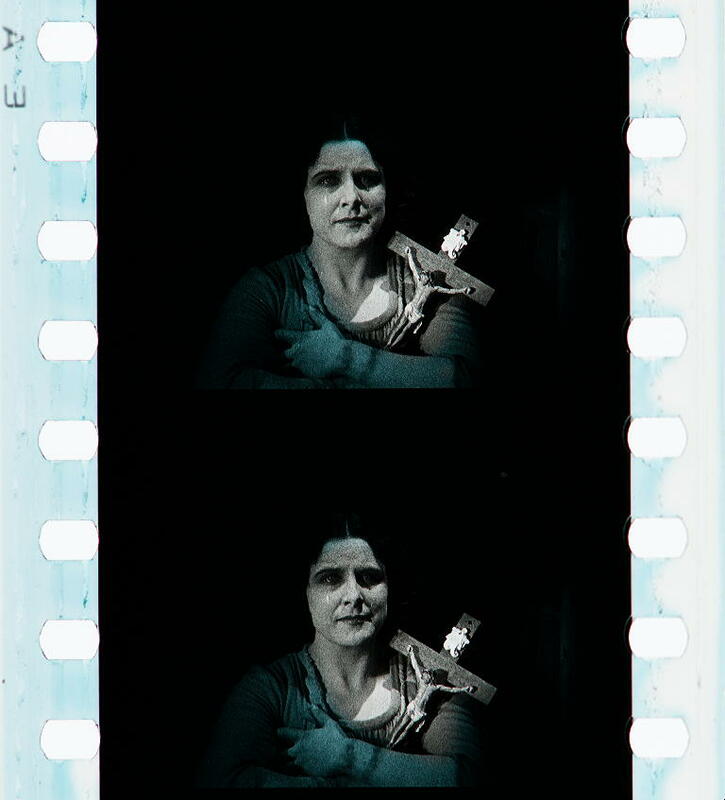 Handschiegl segments of Salomé (USA 1922, Charles Bryant). 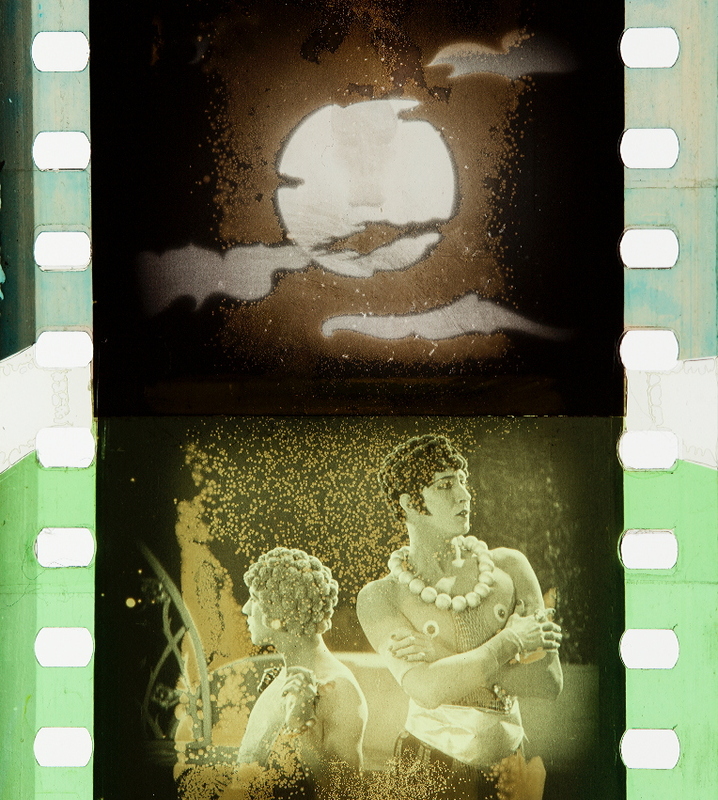 Photographs of the tinted, toned and Handschiegl nitrate print by Barbara Flueckiger. See corresponding gallery on the tinting page. 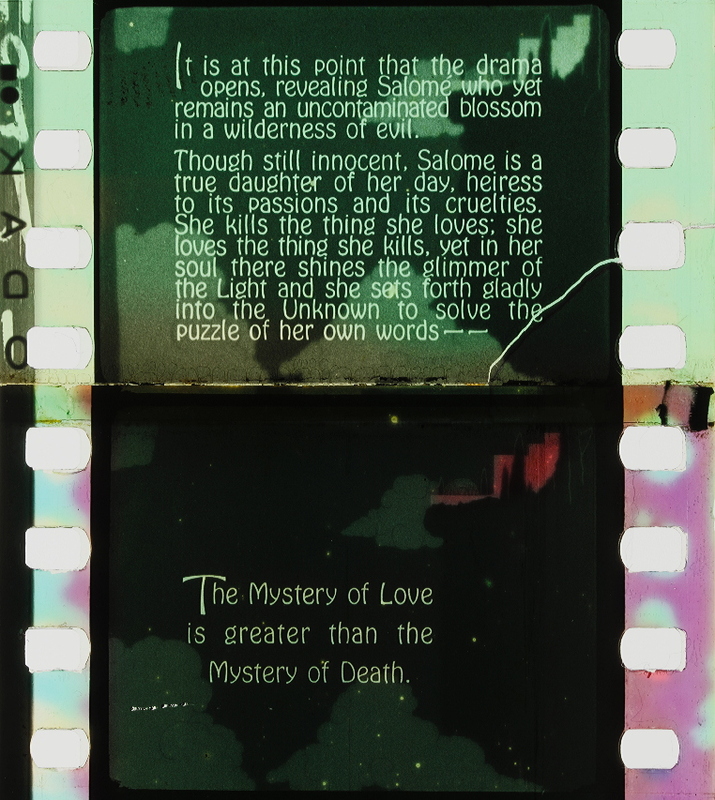 Salomé (USA 1922, Charles Bryant). 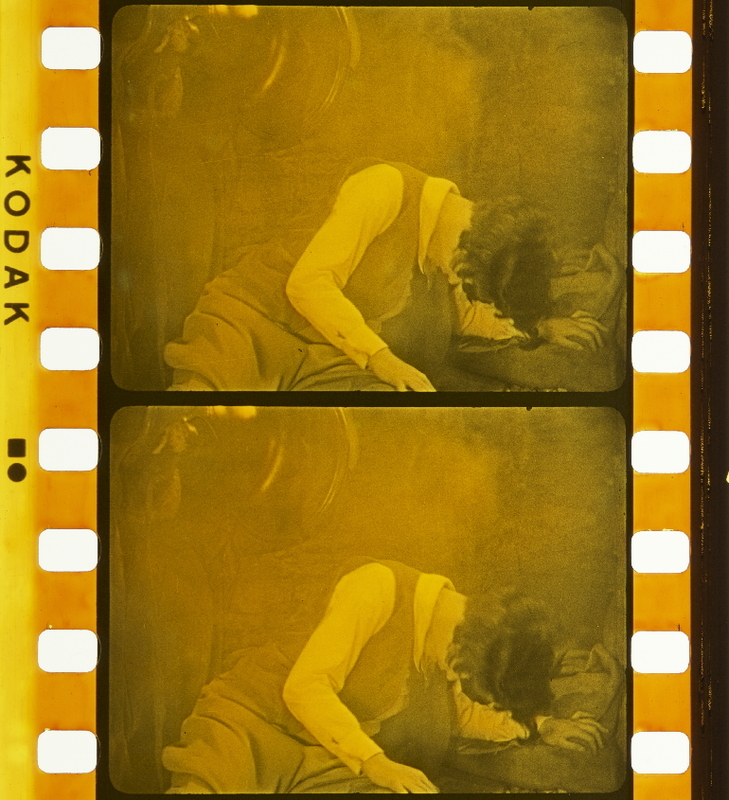 Credit: George Eastman Museum. 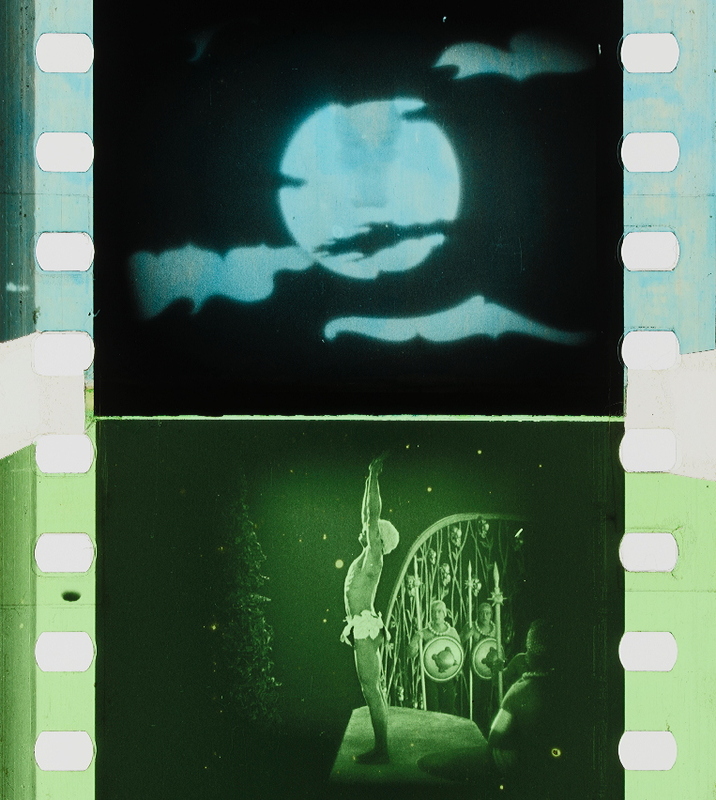 Photographs of the tinted, toned and Handschiegl nitrate print by Barbara Flueckiger. 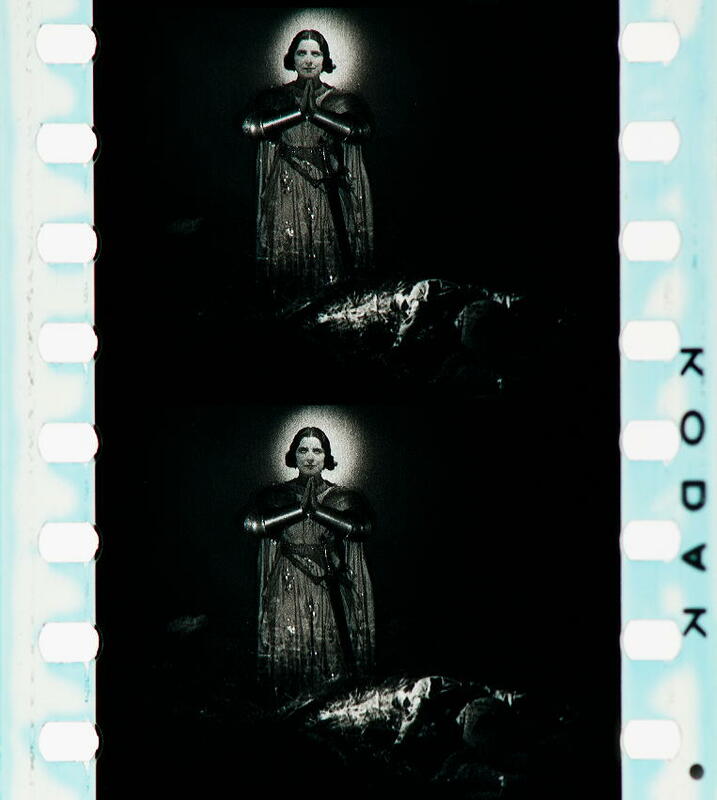 Salomé (USA 1922, Charles Bryant), long exposure. 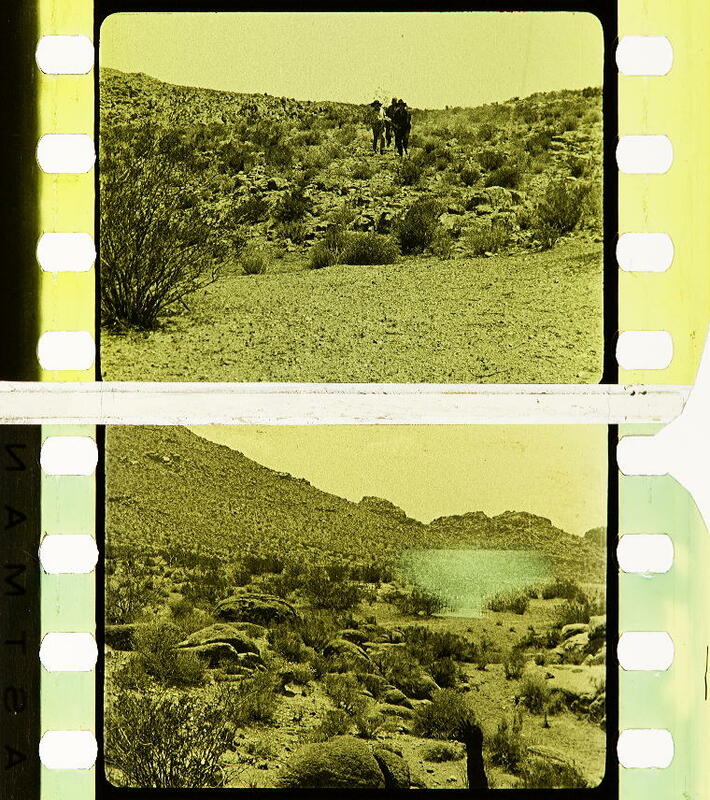 Credit: George Eastman Museum. 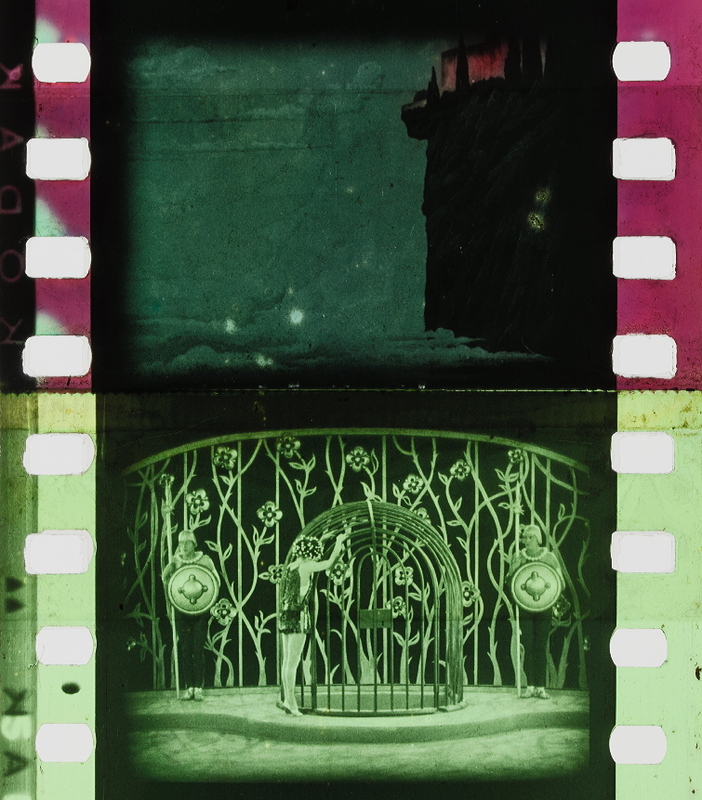 Photographs of the tinted, toned and Handschiegl nitrate print by Barbara Flueckiger. Alvin Wyckoff and Max Handschiegl, U.S.P No. 1,303,836. May 13, 1919 and U.S.P No. 1,303,837. May 13, 1919. 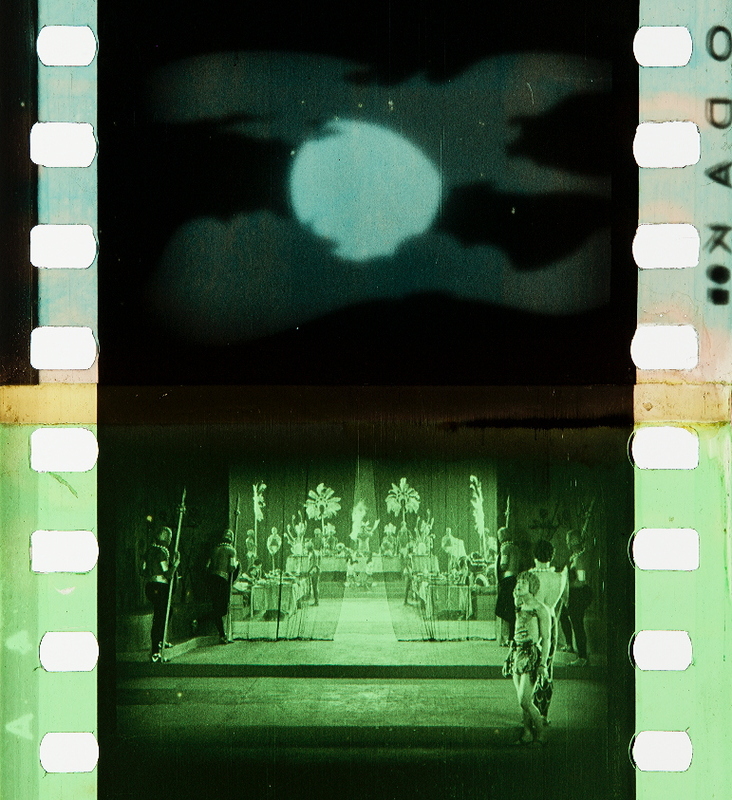 Hanssen, Eirik Frisvold (2006): Early Discourses on Colour and Cinema. Origins, Functions, Meanings. = Diss. 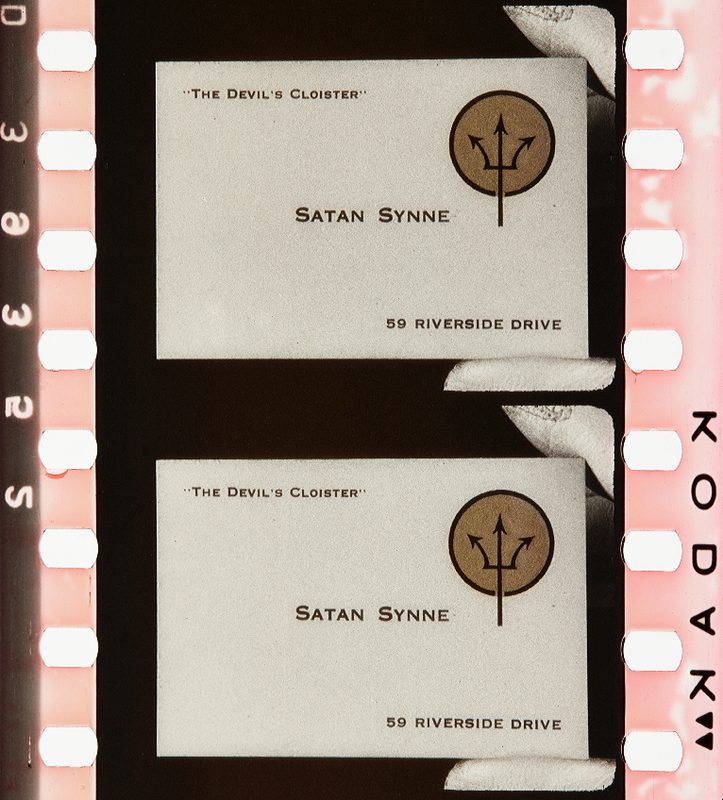 University of Stockholm (Stockholm Cinema Studies, No. 2, p. 80. 4 Layton, James; Pierce, David (2015): The Dawn of Technicolor. Rochester: George Eastman House, on pp. 99–102. 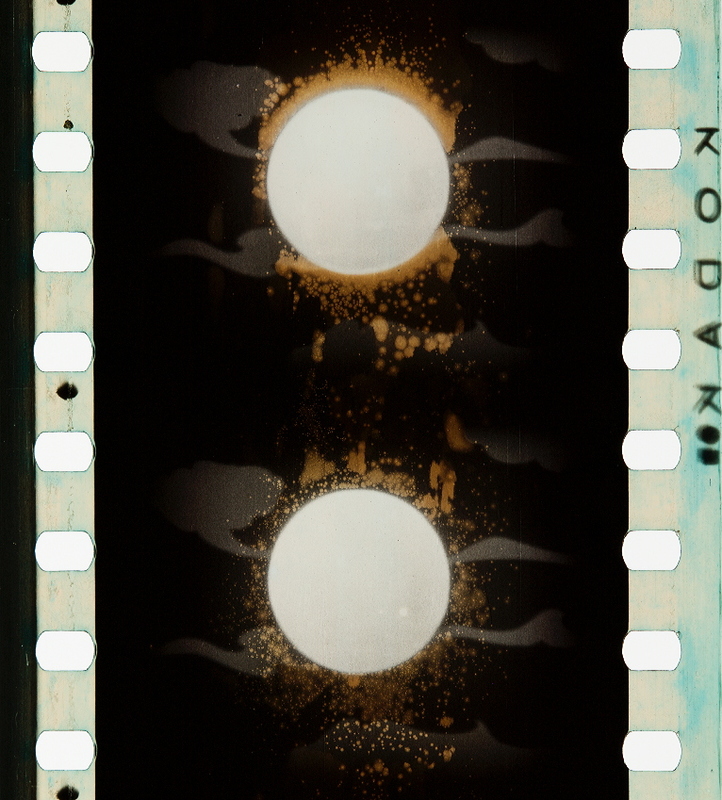 5 Layton, James; Pierce, David (2015): The Dawn of Technicolor. Rochester: George Eastman House, on pp. 125–126. 7 Behlmer, Rudy (1964): Technicolor. 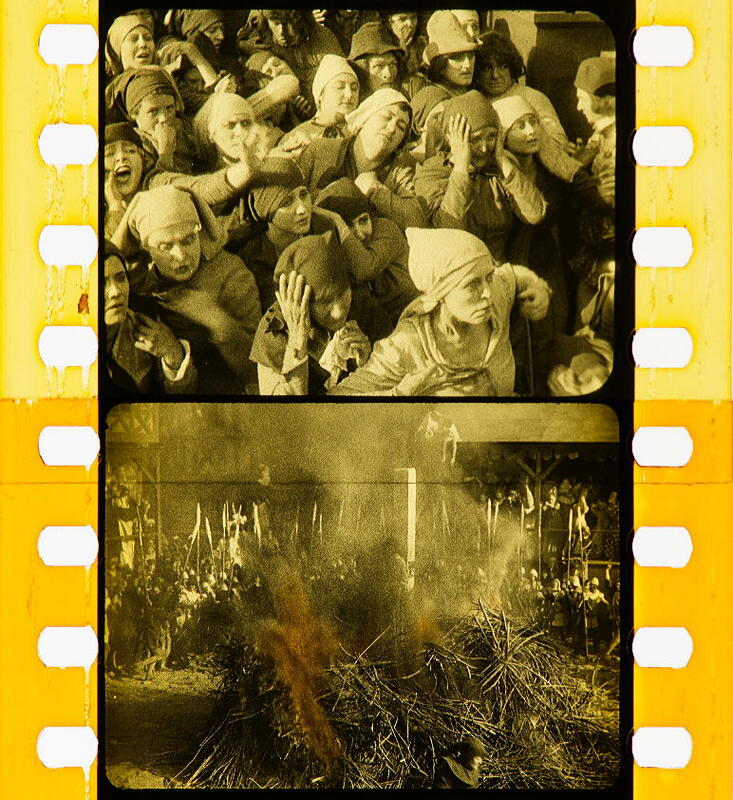 In: Films in Review, 15,6, pp. 333–351, on pp. 337–342. 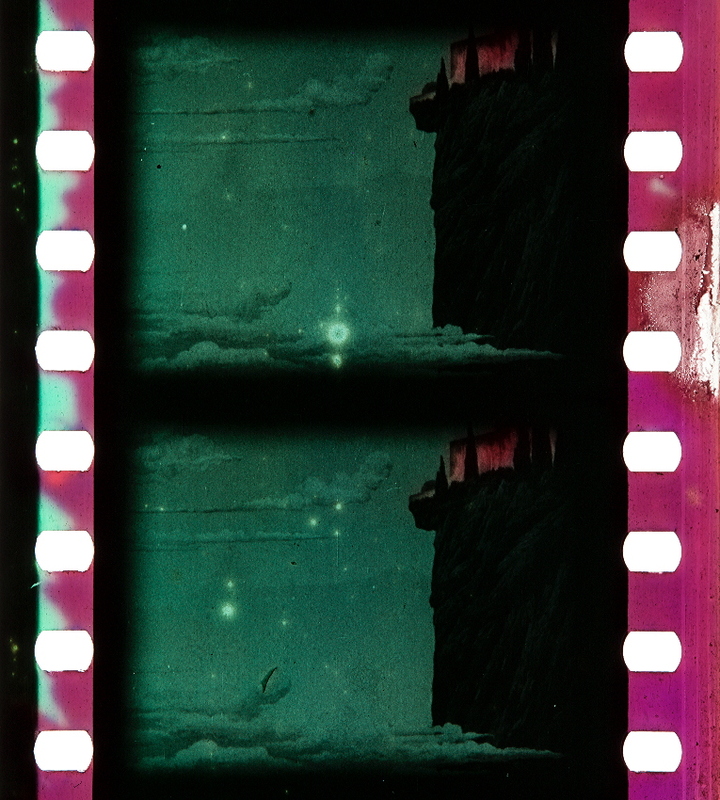 10 Gunning, Tom (2013): Where Do Colors Go at Night? In: Simon Brown, Sarah Street and Liz Watkins (eds. 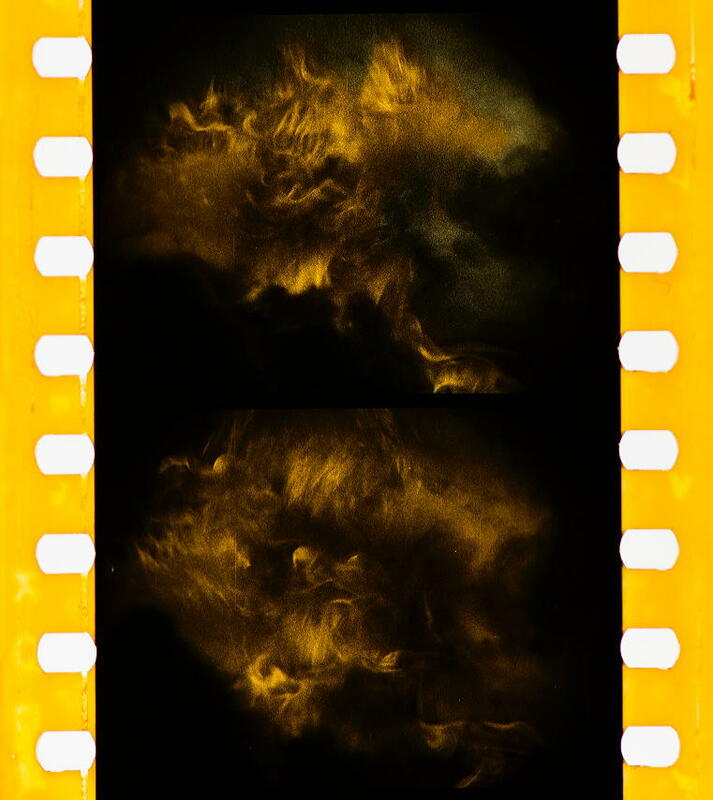 ): Color and the Moving Image. History, Theory, Aesthetics, Archive. New York, London: Routledge, pp. 81–92, on pp. 82–86. 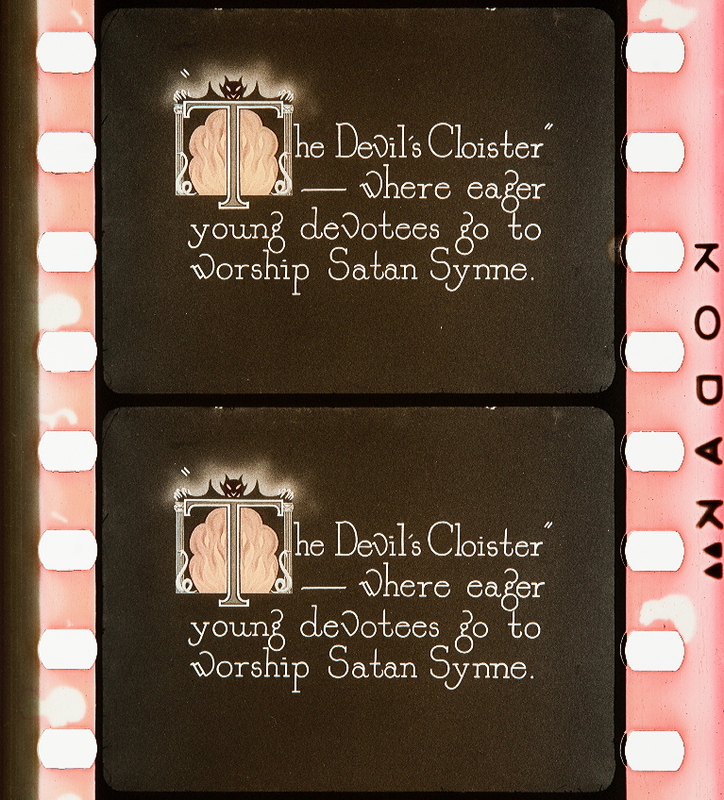 Kelley, William Van Doren (1927): Imbibition Coloring of Motion Picture Films. 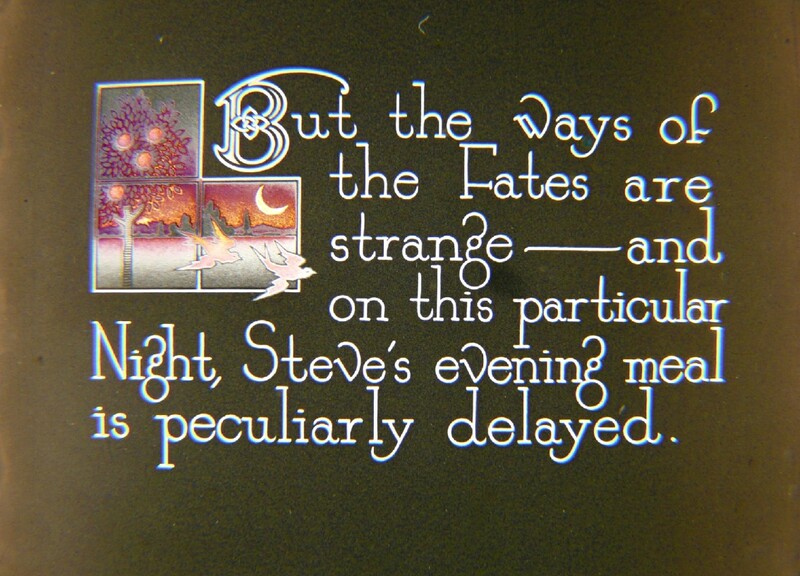 In: Transactions of the Society of Motion Picture Engineers 10,28, 1927, pp. 238-241. 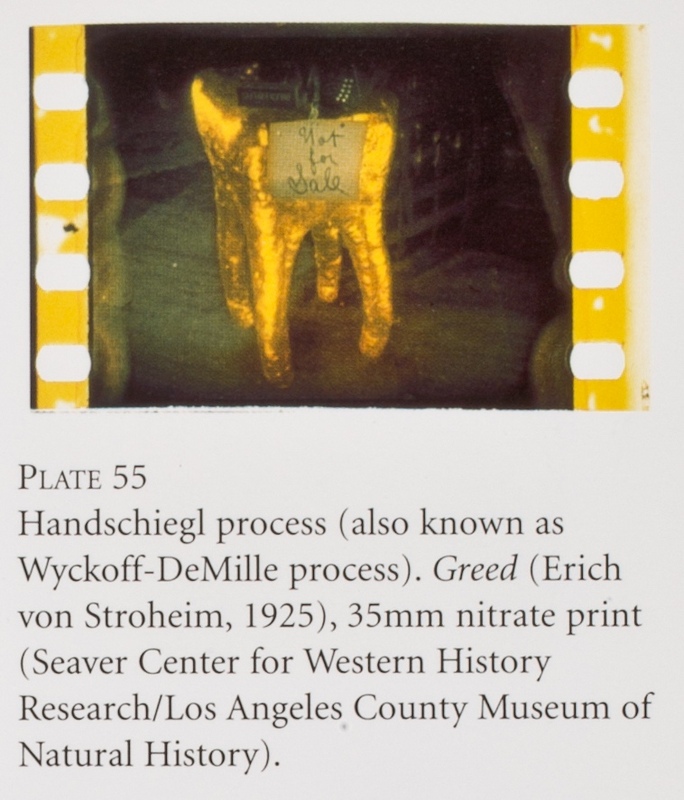 Kelley, William Van Doren (1931): The Handschiegl and Pathéchrome Color Process. 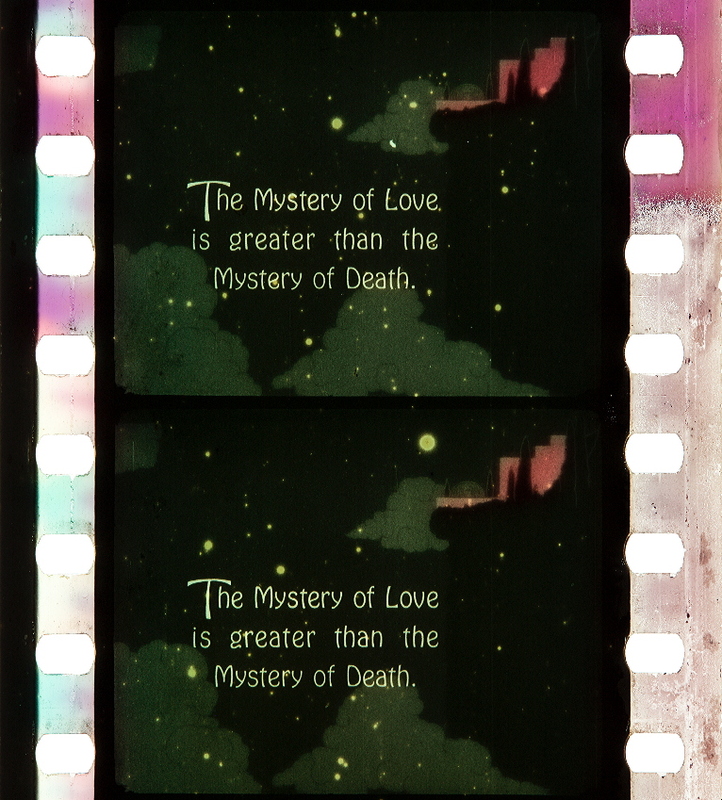 In: Journal of the Society of Motion Picture Engineers, 18,2, 1931, pp. 230-234. Alvin Wyckoff and Max Handschiegl U.S.P. No. 1,303,837. May 13, 1919. Read, Paul (2009): ‘Unnatural Colours’. 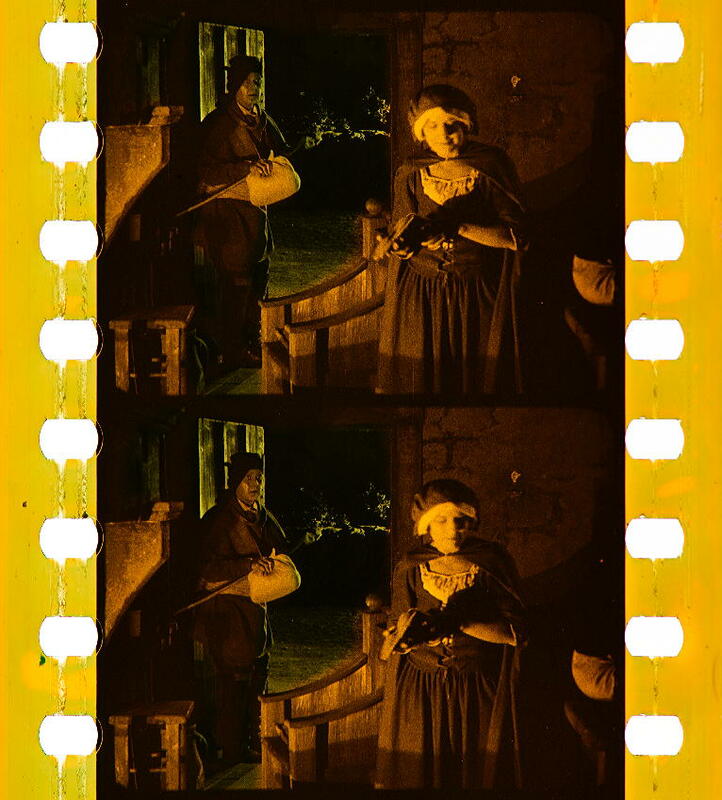 An Introduction to Colouring Techniques in Silent Era Movies. In: Film History, 21.1, pp. 9-46. 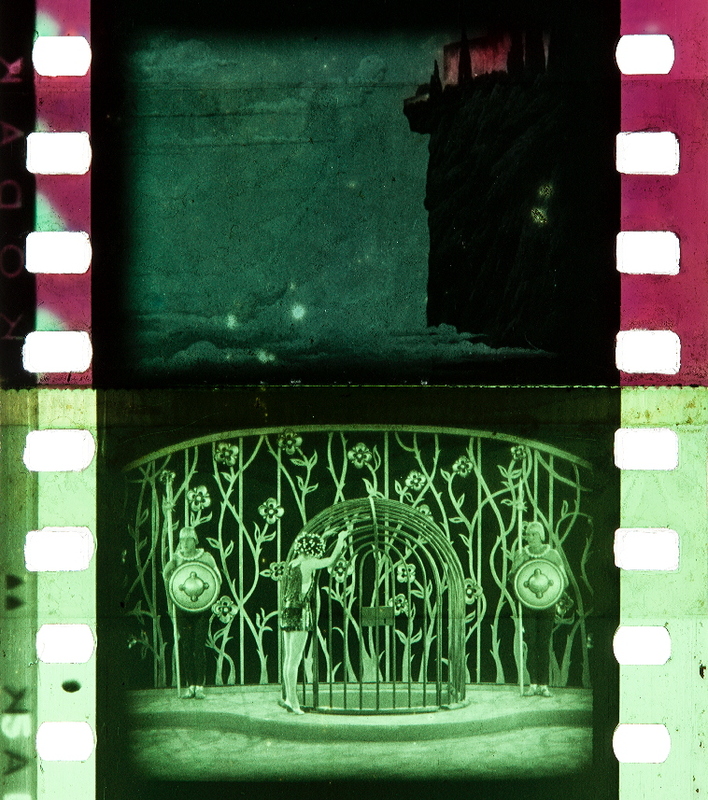 “ABOUT eight years ago Mr. Max Handschiegl began the coloring of motion picture films by a system generally known by the term ‘imbibition.’ Mr. Handschiegl’s previous experience had been in the engraving business in St. Louis and other places and he sought to apply the knowledge gained in that field to the coloring of films. In a broad sense he has utilized the printing press method of inking from a matrix or similar surface. Imbibition merely means the transfer of a dye from one surface or body to another. 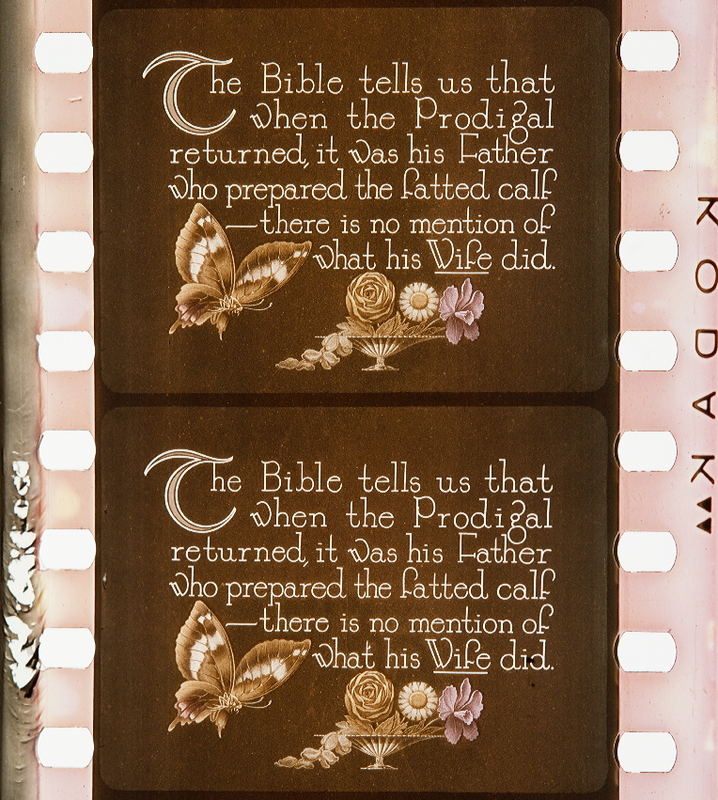 He uses a color plate, corresponding to the engravers’ cut or block, which is in gelatine on a celluloid base and which may be a smooth surface with dye selective areas or a matrix with raised portions. Probably the best known of his early work was in the De Mille picture Joan, the Woman. The procedure in such an example is for the producer to supply a positive print. From this original print, by various means, which involve printing, etching, or hand blocking, a photographic registering print is made that contains only the sections of the picture that are to be colored. If more than one color is to be transferred, then a separate plate is made for each of the colors. 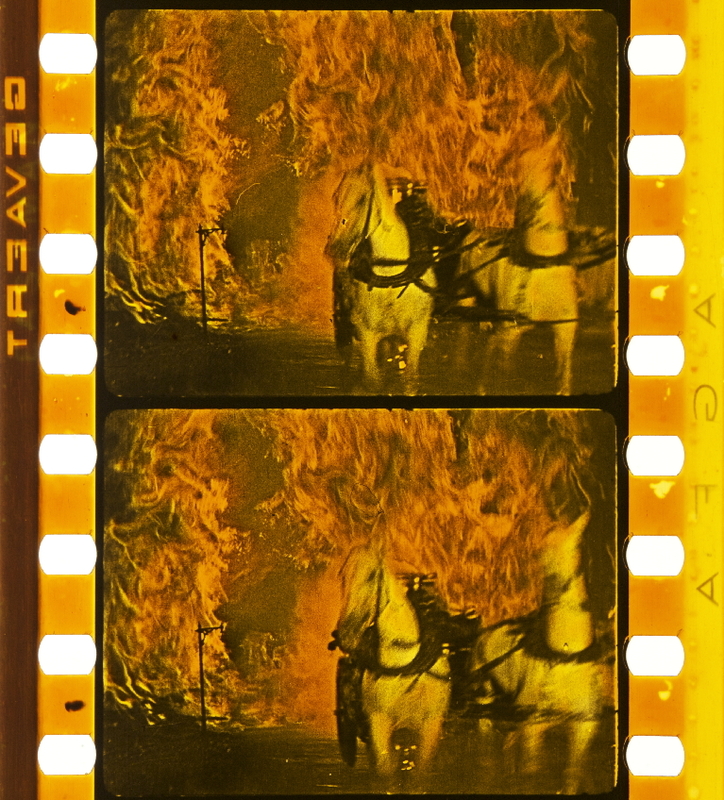 Fire scenes are made as a rule with a single color but the majority of the films colored by this process are done with three colors. A knowledge of the blending of three colors and the engravers’ experience with the three-color printing inks is of great value. This system of coloring is used exclusively for productions already completed. 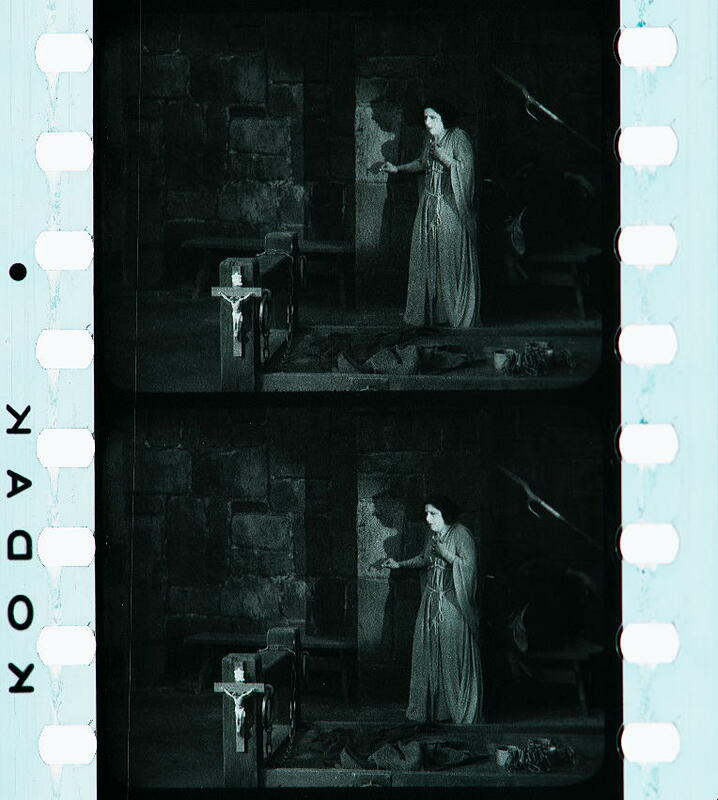 After a production has been cut and edited, the scenes that are to be colored should be joined into one reel, a positive print made with the same perforations as the negative, which also should be printed on a registering printer, and from this print the “color plate” is generated. Once the color plate is made in this manner, the prints for distribution may be made with different perforations, as the coloring machines can register independently of the perforations. The preparation of the ‘color plate’ is the result of hand operations. 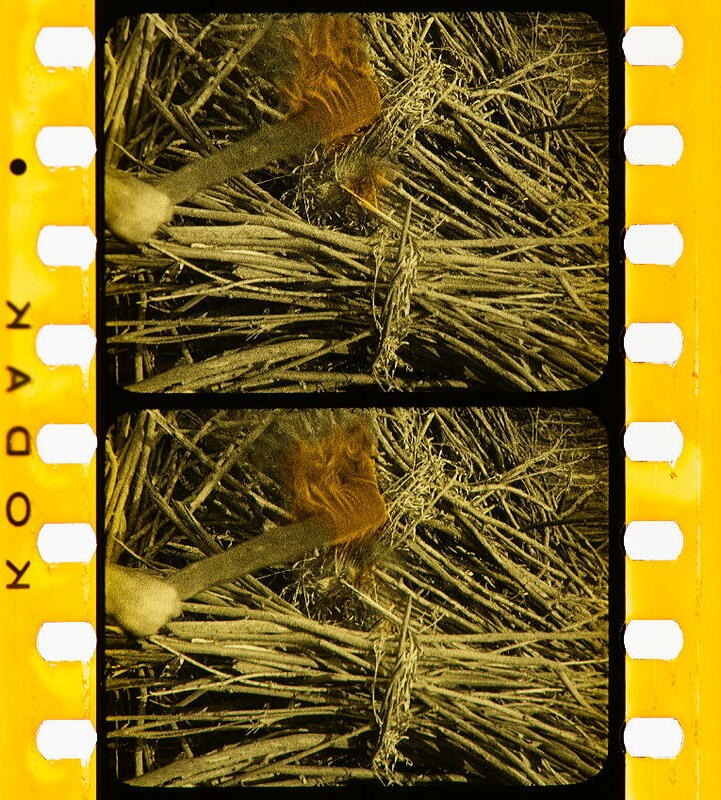 This takes time and careful work as each frame in the reel must be gone over by hand. There is no room for careless work. The final result can be only as accurate as the hand blocking-out. These blocked-out prints are known as ‘key plates’ and once made will continue in service till the subject is worn out. As an example, some prints were made during September this year for which the ‘key plates’ and ‘color plates’ were made 5 years ago. The ‘color plates’ can be used until worn out or ruined by some accident. There does not seem to be any limit to the number of prints that can be pulled. 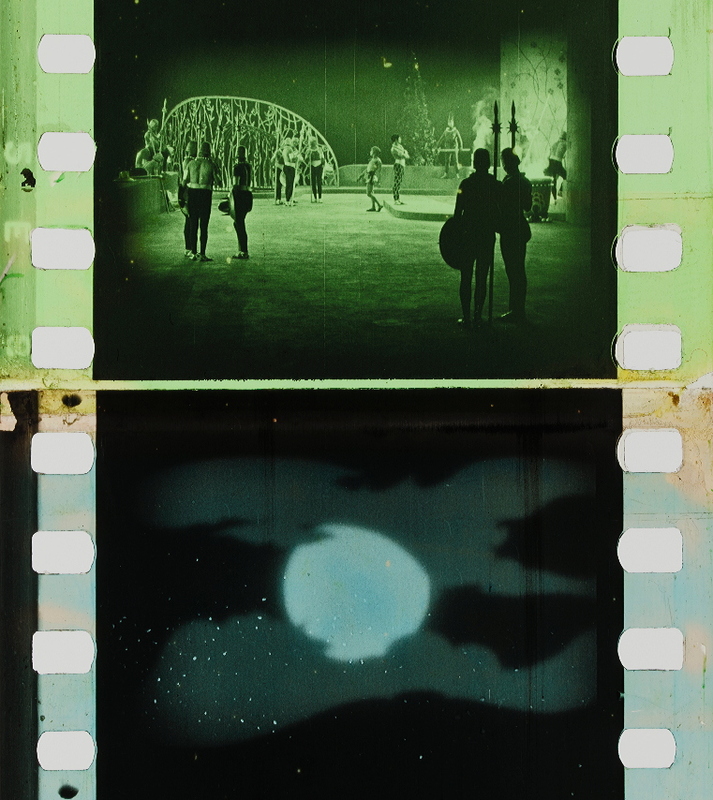 “As worked by Handschiegl, his process is not what we usually term a natural color process. The most successful use for his system is in applying tints of color to the customers’ own make of black-and- white prints. 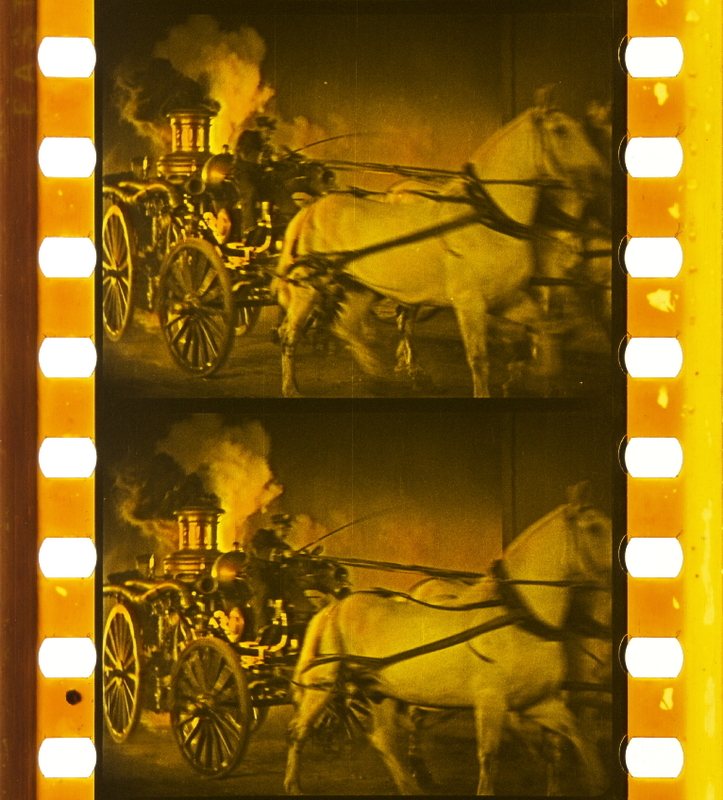 Good scenic prints and excellent work on titles are produced, but the method is most frequently used for giving “spotting” effects, such as in showing a red cross on the side of an ambulance, Will Rogers blushing in The Connecticut Yankee, or in fire scenes, which are also well adapted for coloring by this system. In nearly every instance the customer furnishes the prints in the customary black-and-white stage. The color is applied mechanically, differing in this respect from hand coloring methods. The color tints, when blended, produce very beautiful effects. Handschiegl started in the photoengraving and lithographic business and was very skilful at blending colors and producing satisfactory matrices. As this skill was largely individual, it died with him. 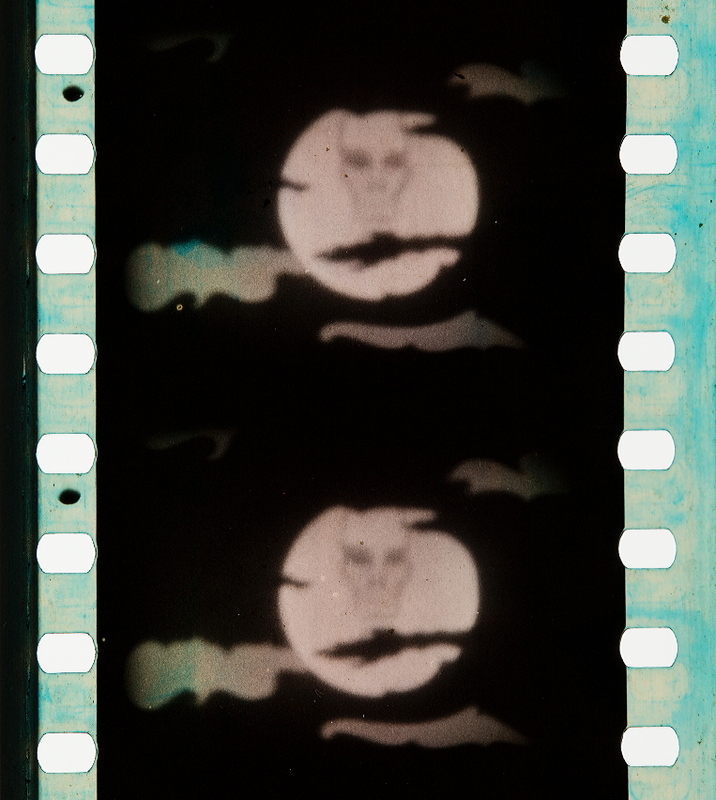 The making of the master positive, from which the matrices were made, received Handschiegl’s personal attention. 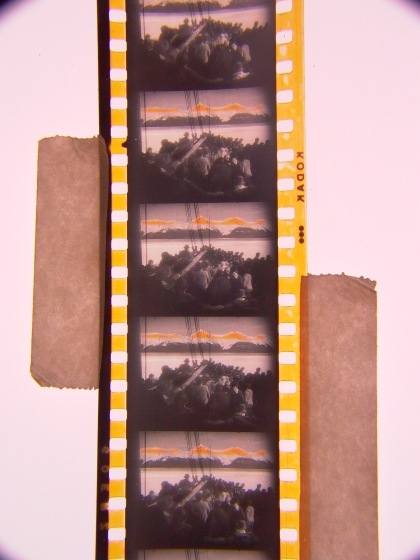 They are obtained by printing back and forth until the parts to be colored stand out from the balance of the picture. The next step is the “blocking out” process, done by hand. This consists in painting out the parts not wanted or in shading those that are needed. From this master, the prints or matrices are made. The matrix print is developed in the usual way, then bleached in a bath that hardens the gelatin surrounding the silver particles, leaving the clear portions soft as is possible. The bleached print is then immersed in a saturated solution of the dye in water, say, about two pounds of dry dye to five gallons of water, is next passed through blowers or wipers for removing surplus dyes and finally to a drying set of rollers. From such a matrix about two impressions of the same density are made and the matrix is again dyed. The life of the matrix is 40 runs. The dyes used are acid dyes and not especially of Pinatype nature. The machines for “imbibing” the dyes have three impression drums of about 12 inches in diameter with sprocket teeth that are not full fitting. Each machine has three drums, enough to use three colors in one passage through the machine. 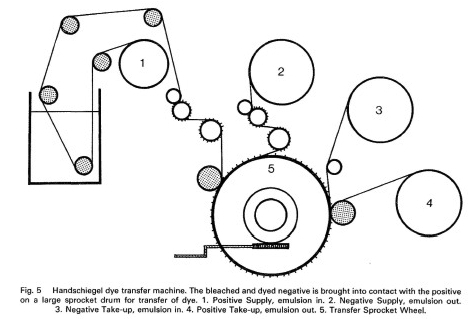 At each of the three drums provision is made for drying the matrix while the positive continues over two or three of the impression wheels, according to the number of color tints required. 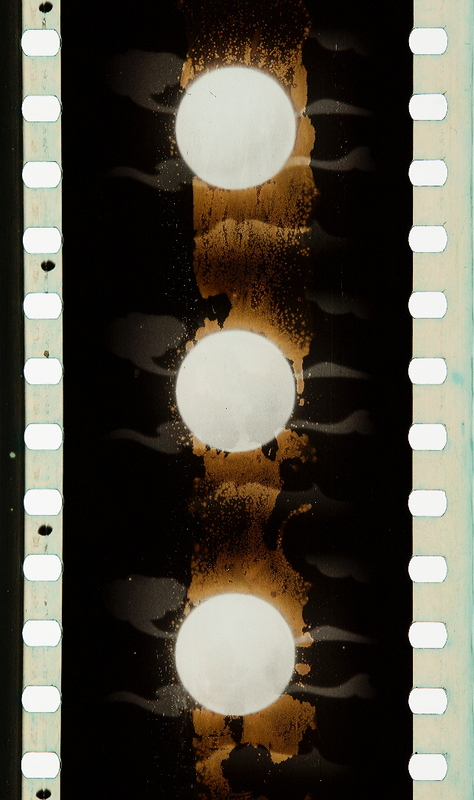 The positive receiving the impressions passes from one color to the next, all three colors being applied one over the other and the blank is not dried until finished. At the start of operations the positive which is to receive the colors is fed through damping means consisting of water and oxgall, receiving considerable wetting. 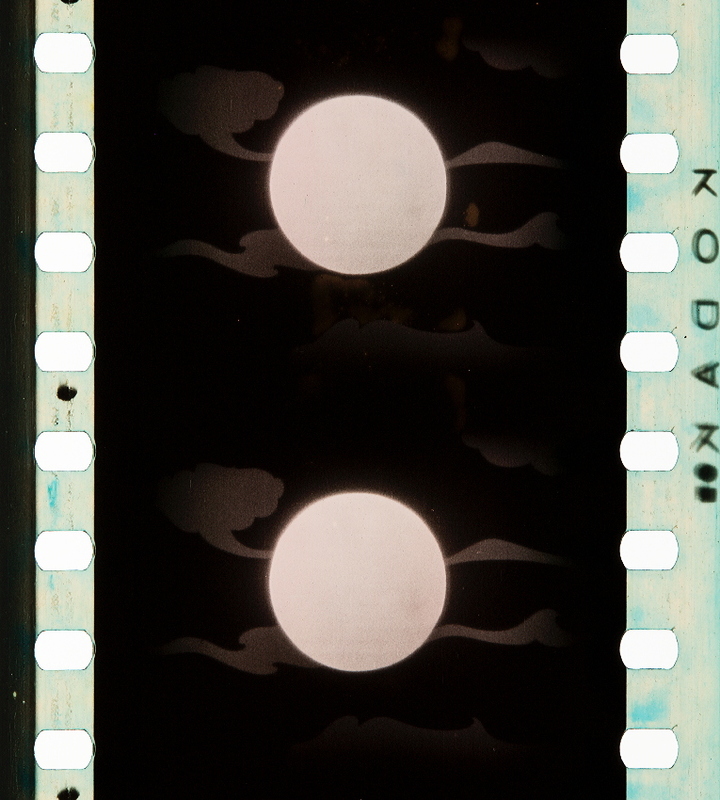 Just before the two films are fed to the impression drum, emulsion to emulsion, each film is fed over a train of sprocket wheels designed to give tension for longitudinal registration, while lateral registration is attained from the adjustable lateral positions given the sprocket wheels. Discrepancies that might occur in registration are negligible, due to the color tints being imbibed on black silver prints which tends to hide the faulty registration. 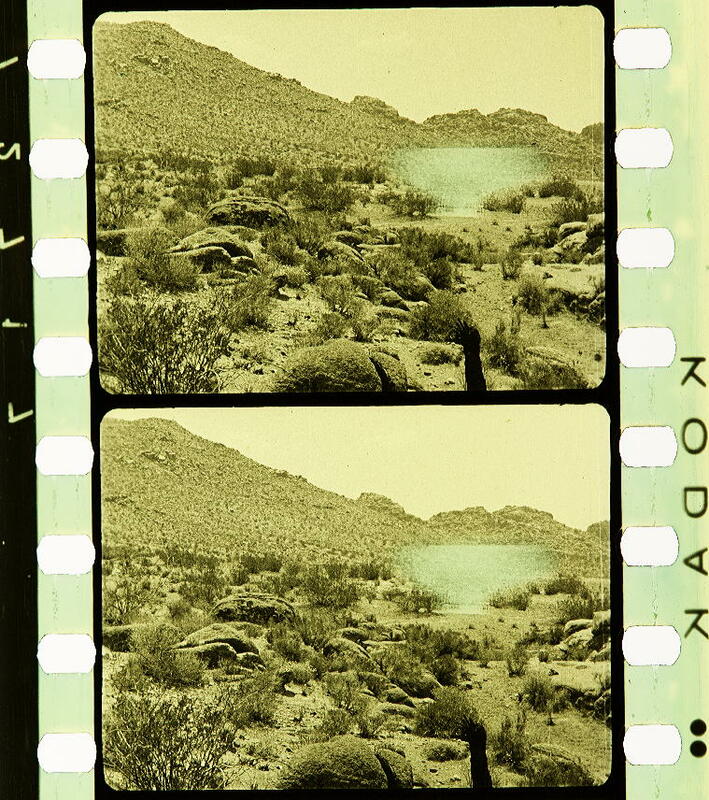 Attempts were made to apply color from color-selective negatives using this system. 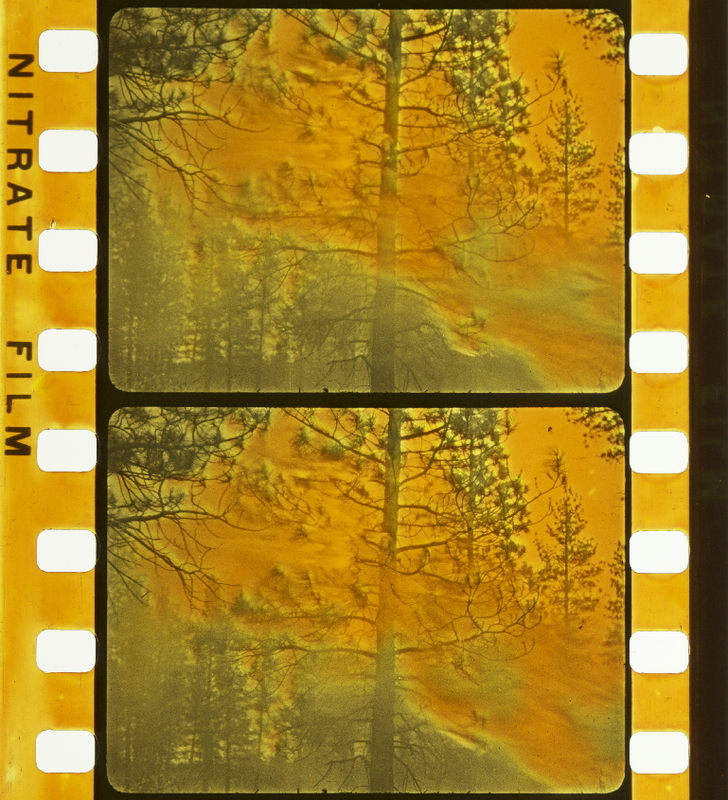 A black-and-white print was made from the negatives taken with a red filter. 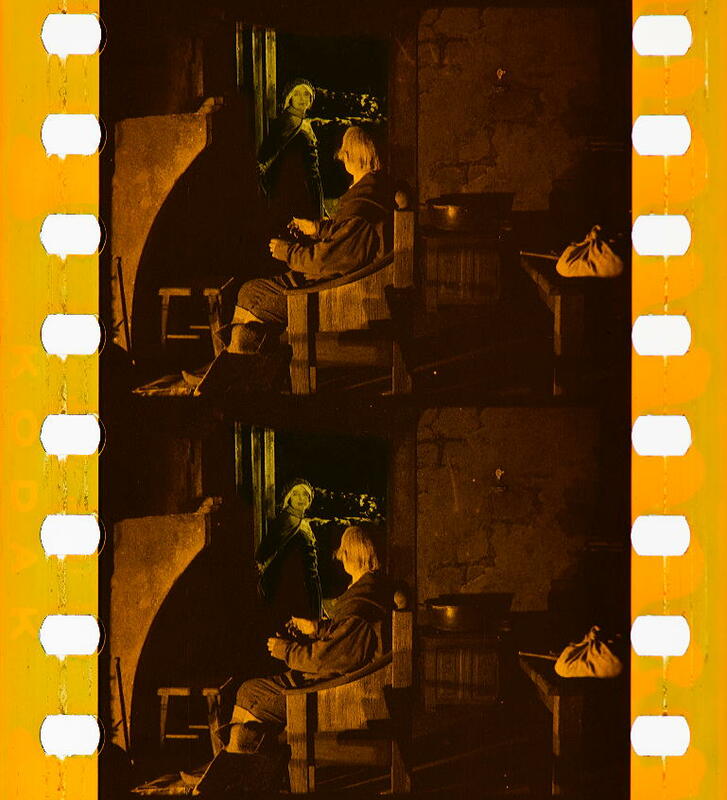 To this print were applied two complementary colors by means of matrices made from positives of each of the original two-color negatives. This produced some very excellent results, the main difficulty being that anything “black” in the subject received the greatest quantity of dye from the matrix which, when imbibed to the positive print, inclined to splash over where it would show the most. At the speed of 360 feet an hour these matrices did not produce sufficient color on a blank for the transfers to make strong enough blacks to be used as prints without the keys, but for tinting, gave plenty of color. The system is what is generally known as Pinatype. Blacks can be produced and the system is capable of making imbibed prints on a blank, but Handschiegl did not set up to do this type of work. Attempts were made to colortone positive prints one color and then apply a complementary color by imbibition. 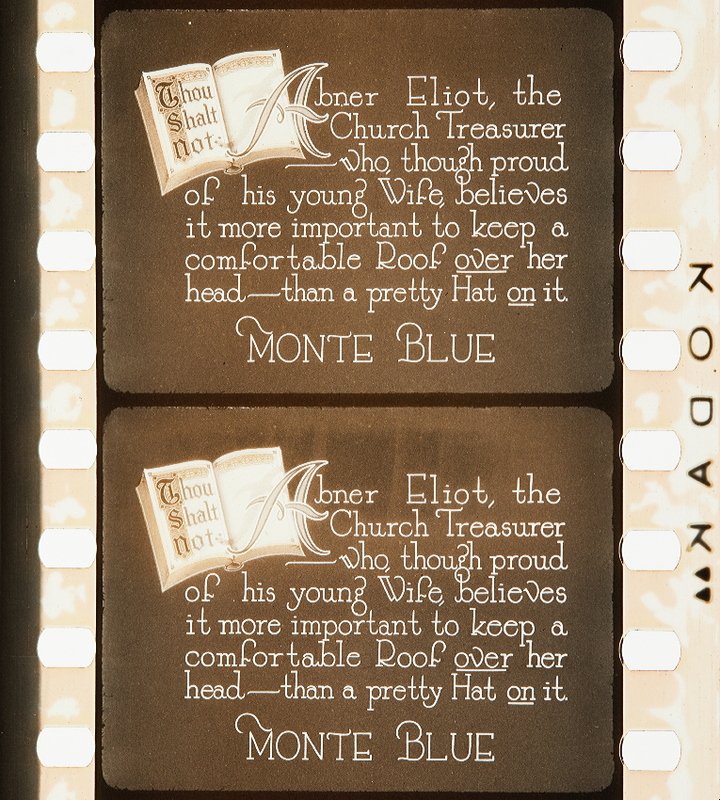 To tone such a print it was not found possible to use any known color toning system without producing some relief or differential hardness on the surface of the print, even when printed to the back. For that reason it was not found practicable to make color prints in this way. The use of basic dyes for the imbibition work is not wholly successful, the principal fault being lack of smoothness, and acid dyes were relied upon. The matrices produce some relief in the surface but not as great as in the wash-out method. 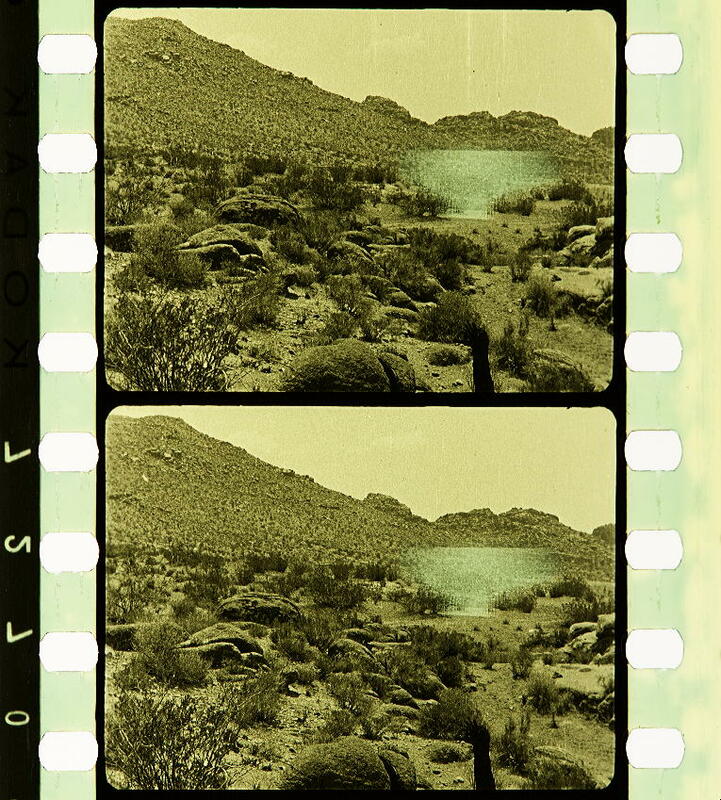 Positive prints of a quality suitable for making dupe negatives are the best. These were bleached in a bath composed of a copper salt, and bichromate, the latter controlling the hardness. 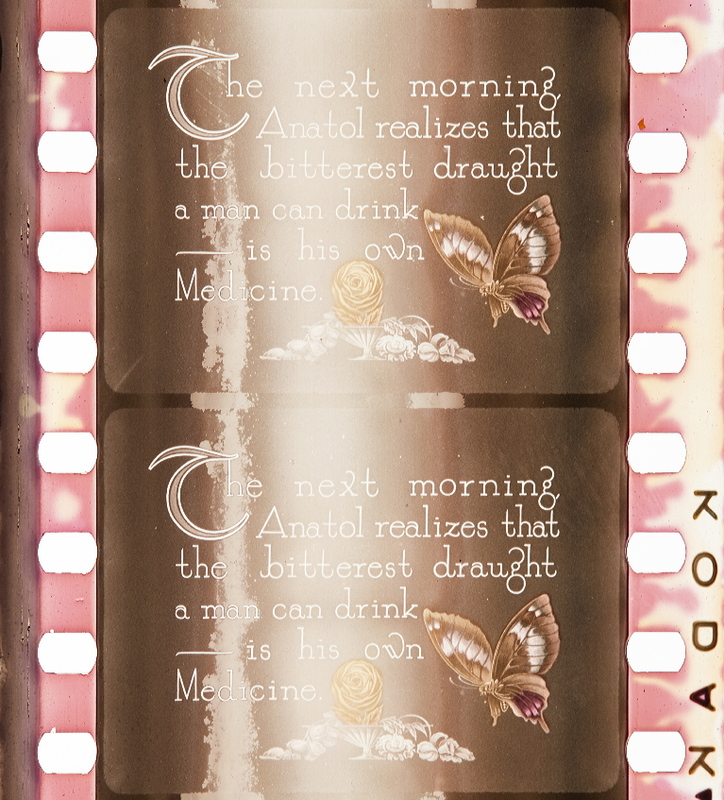 “A process for the mechanical application of colour to a film strip was devised by Max Handschiegl in 1916, who, with Alvin Wyckoff, brought it to commercial application in America in the-early 1920s. The Handschiegl Process was invented in 1916 by Max Handschiegl and Alvin Wyckoff of the Famous Players-Lasky Corp. Studio Laboratory. In principle this process was the application of multicolor lithographing techniques to motion pictures. 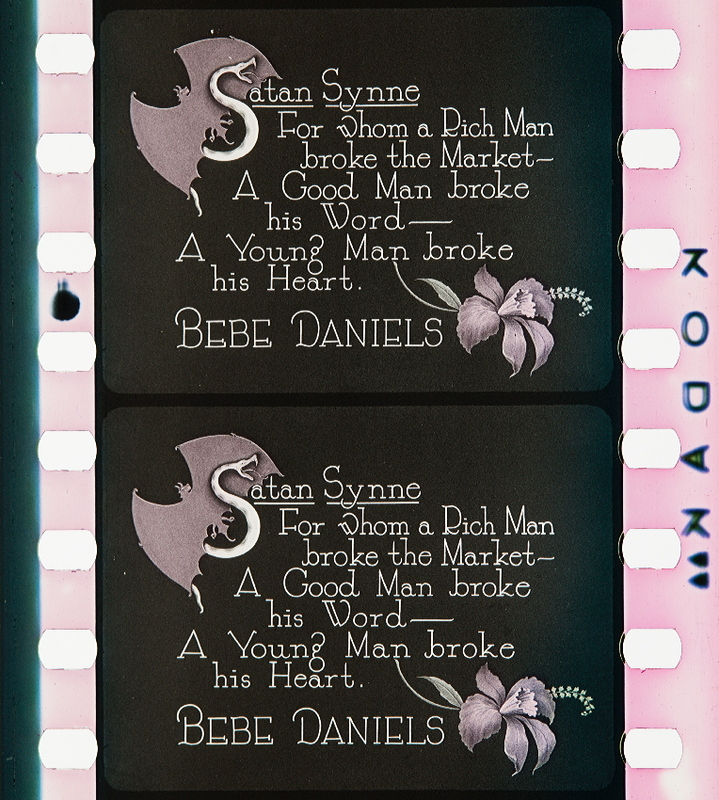 Dye was transferred from a matrix or color plate to selected areas of a black and white print. 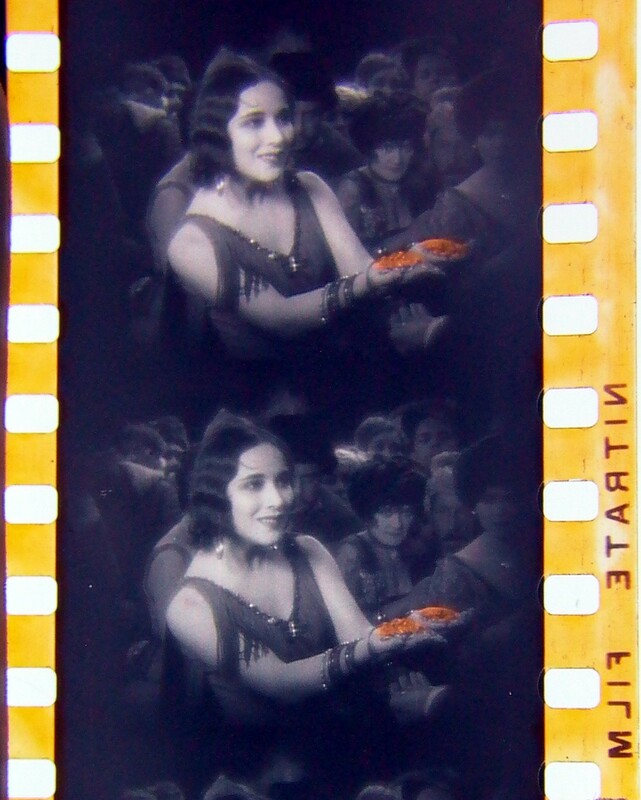 This process was first developed for the De Mille picture Joan the Woman; it was advertised first as the Wyckoff Process then the De Mille-Wyckoff Process. Later it became popular as the Handschiegl Process.11 Some of the other productions that used this process12 were The Red Light, Greed, Irene, The Volcano, The Flaming Forest, Phantom of the Opera, The Merry Widow, The Big Parade, Sally, Seven Keys to Baldpate, The Viennese Medley, The Splendid Road, Mike, and Lights of Broadway. 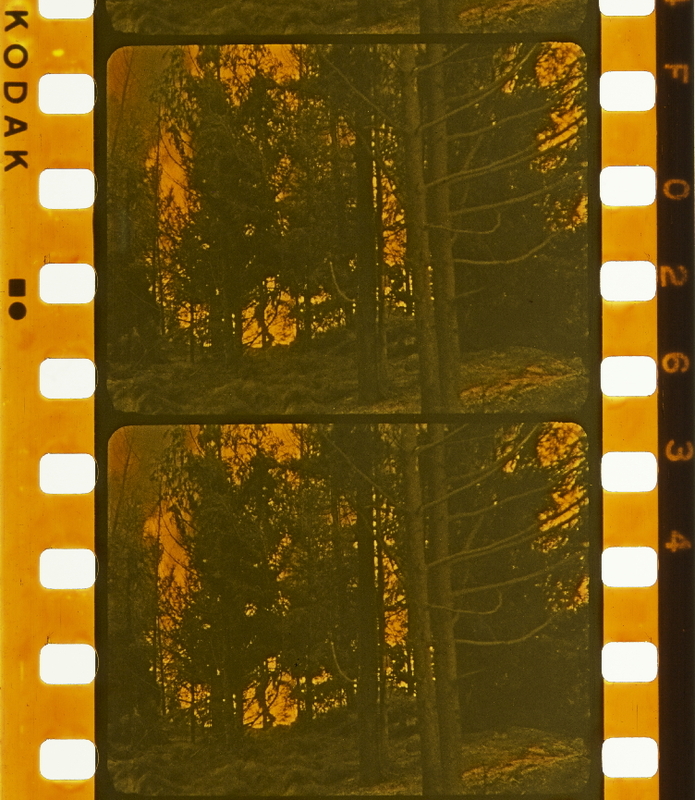 As used by Handschiegl the process was not an attempt to produce natural color photography. 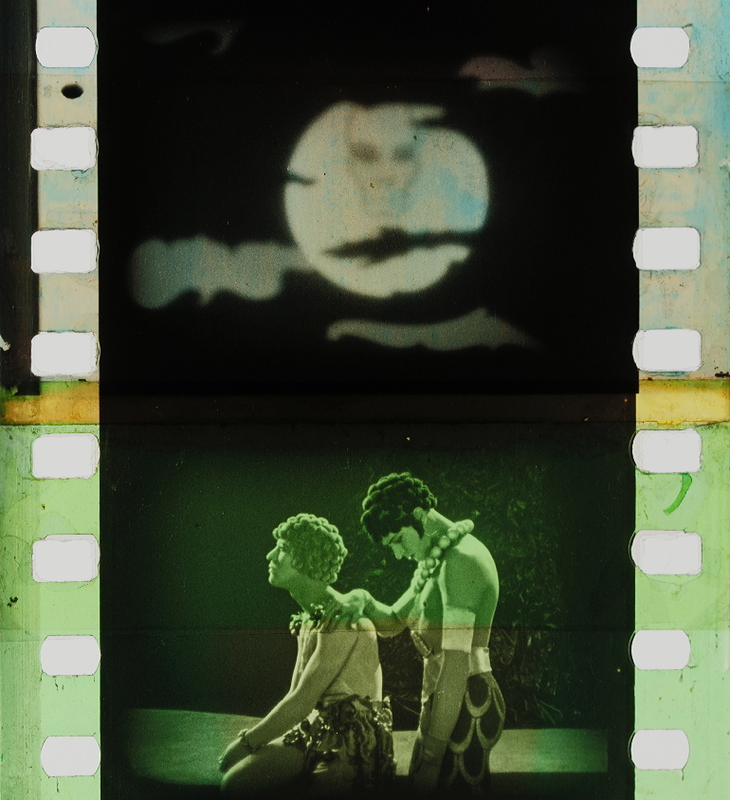 In its early form it was used principally to apply color to selected areas within a scene. The customer furnished normal black and white prints which were colored by dye transfer with one, two or three dyes. If more than one color was to be transferred, then a separate plate was made for each of the colors. 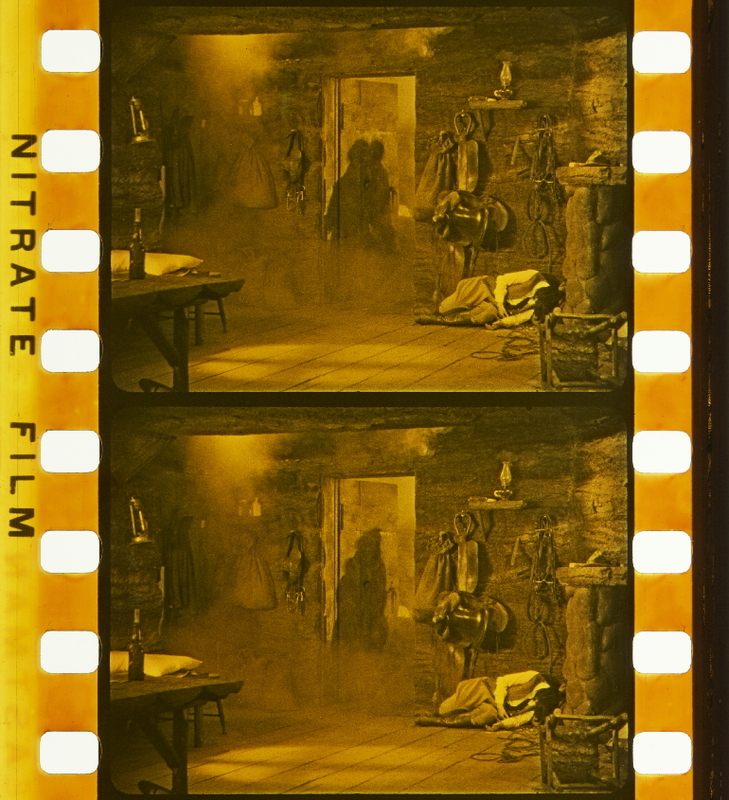 After a production had been edited a print was made of the scenes that were to be colored on a registration step printer. 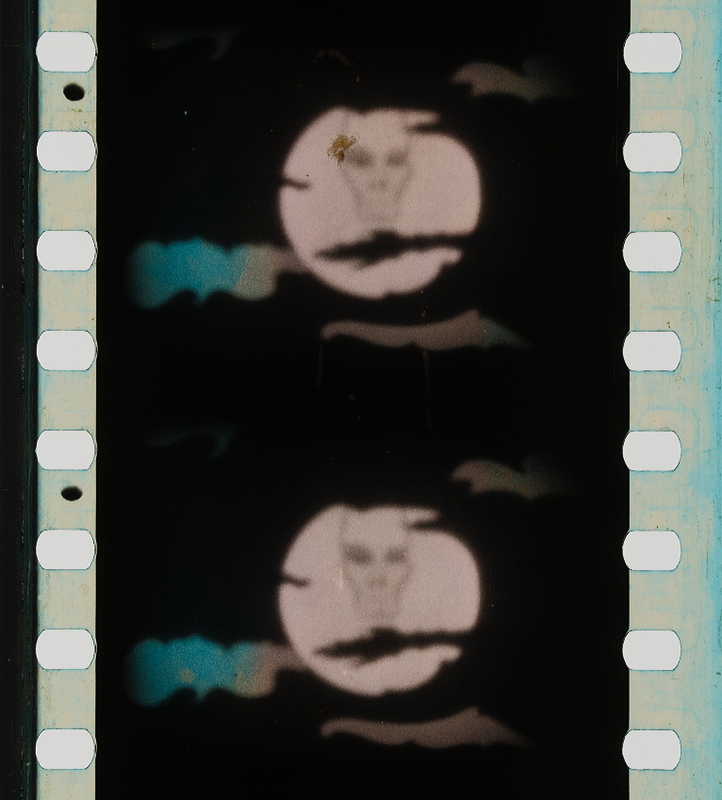 This print was blacked out with opaque material in the area which was to be colored; 13 this could be done by hand with a brush or other suitable instrument. 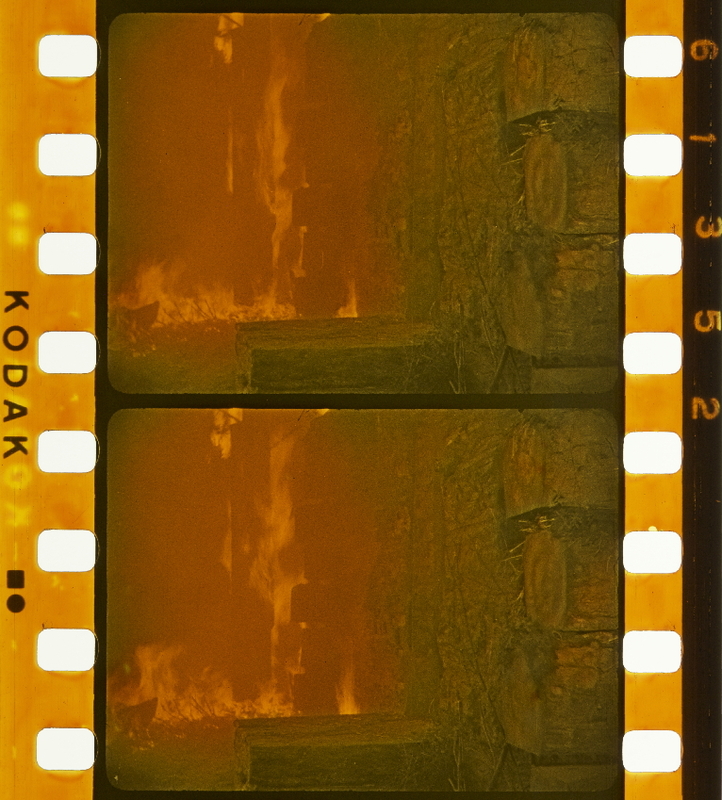 From this print a duplicate negative was made. After development the duplicate negative was clear in the areas which were to be colored. The remaining areas contain a negative silver image. 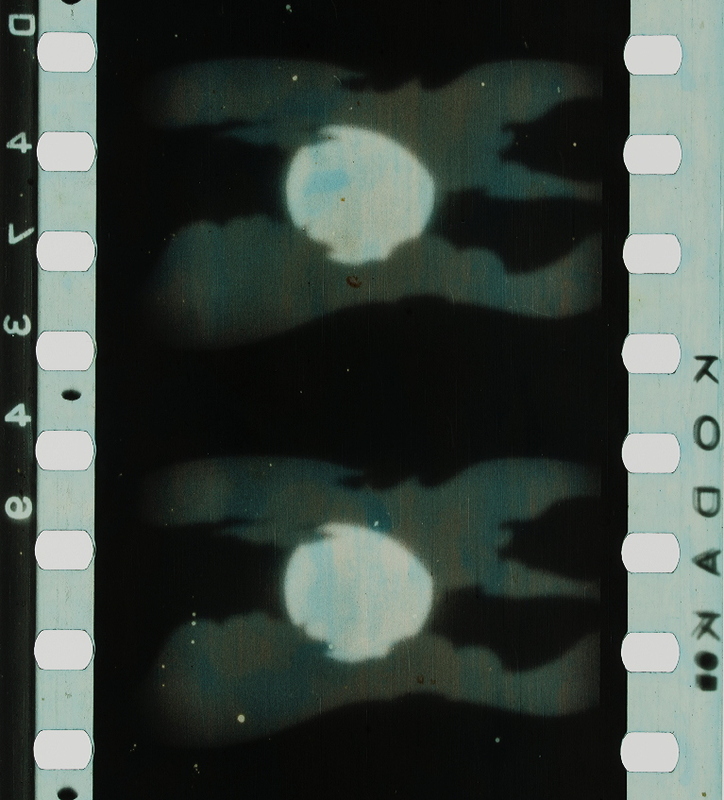 At this point the process makes use of the effect that a gelatin emulsion becomes more insoluble or harder in those areas acted upon by light than in those areas where no exposure takes place. 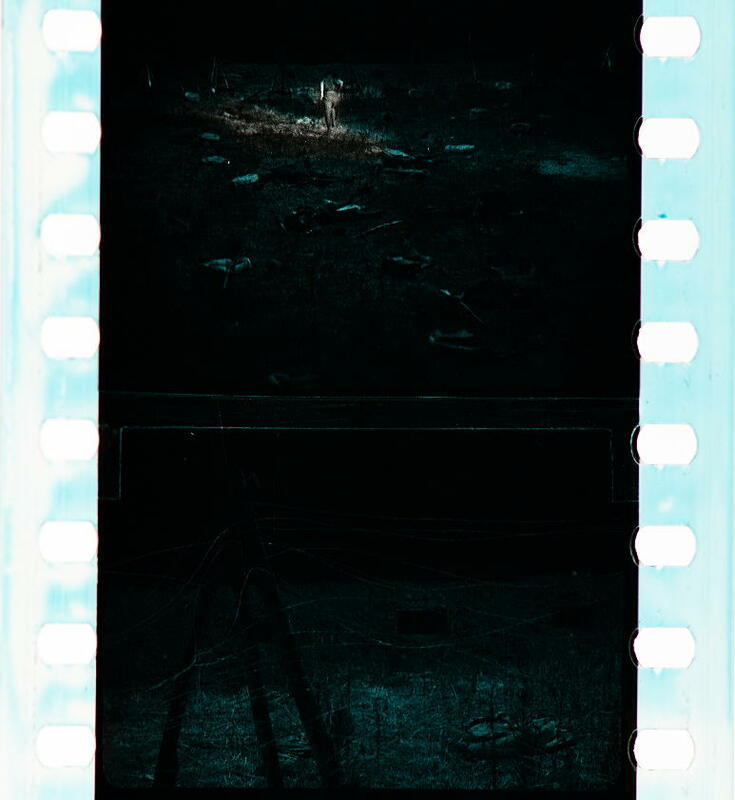 The duplicate negative was immersed in a tanning bleach which fixed and solidified the exposed and developed portions of the scene, hardening them so that they would not absorb dye, but not affecting the viscous consistency of the unexposed or clear portions of the scene. 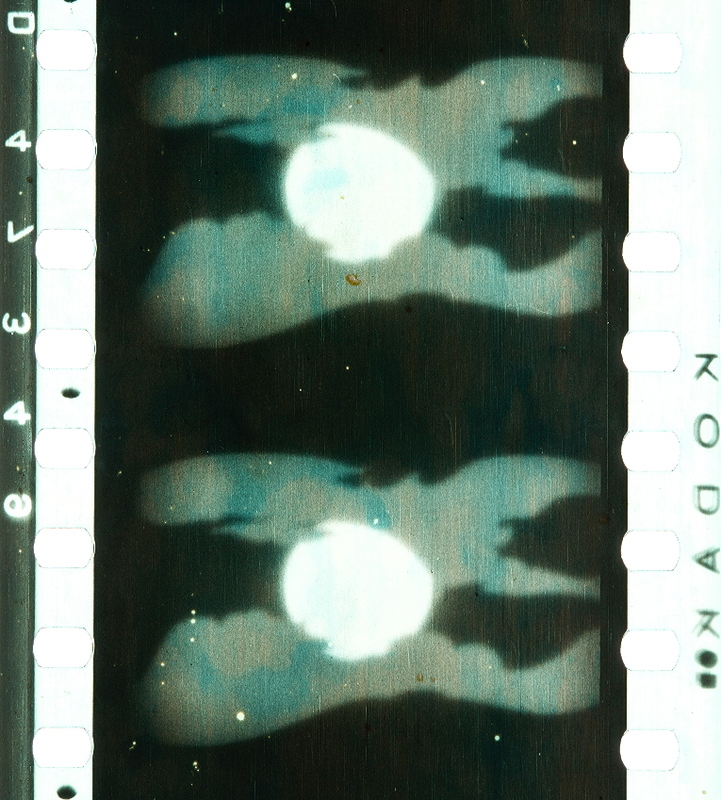 When bleaching was completed the negative was fixed, washed and dried. 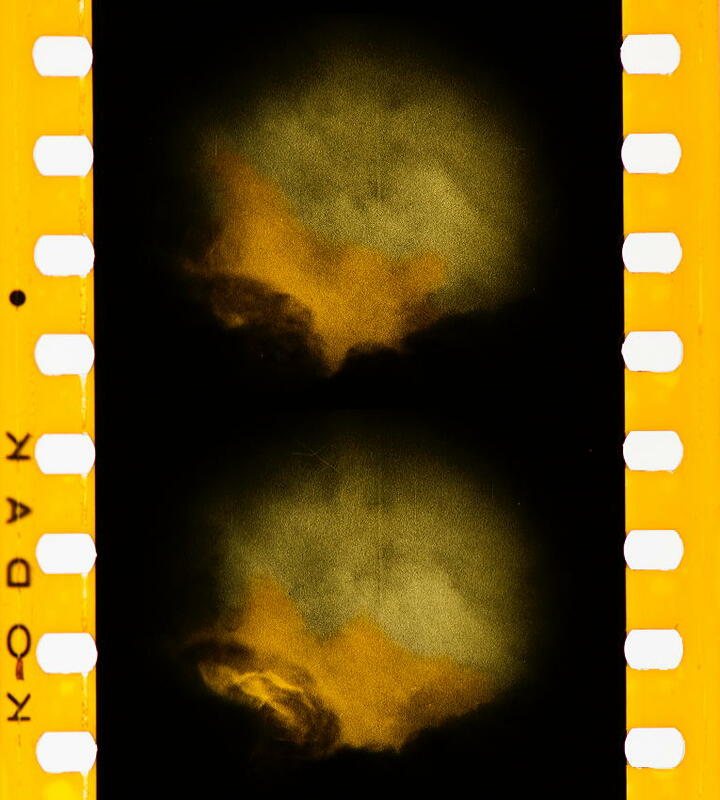 The bleached negative was then immersed in a saturated solution of dye in water, approximately two pounds of dry dye to five gallons of water. 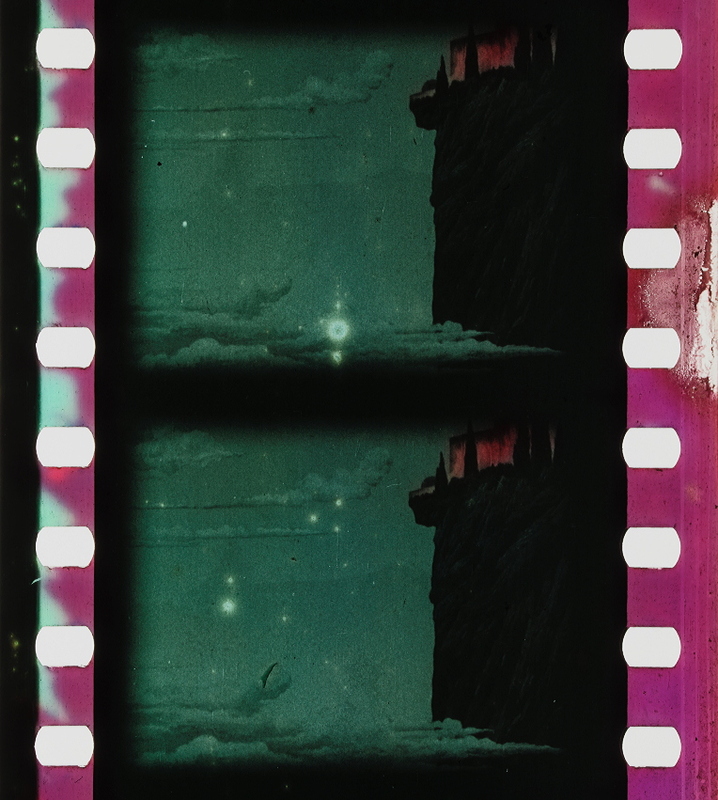 The surplus dye was removed by squeegeeing and the negative dried once more. It was then ready for transfer, by pressure and contact, to the positive prints. 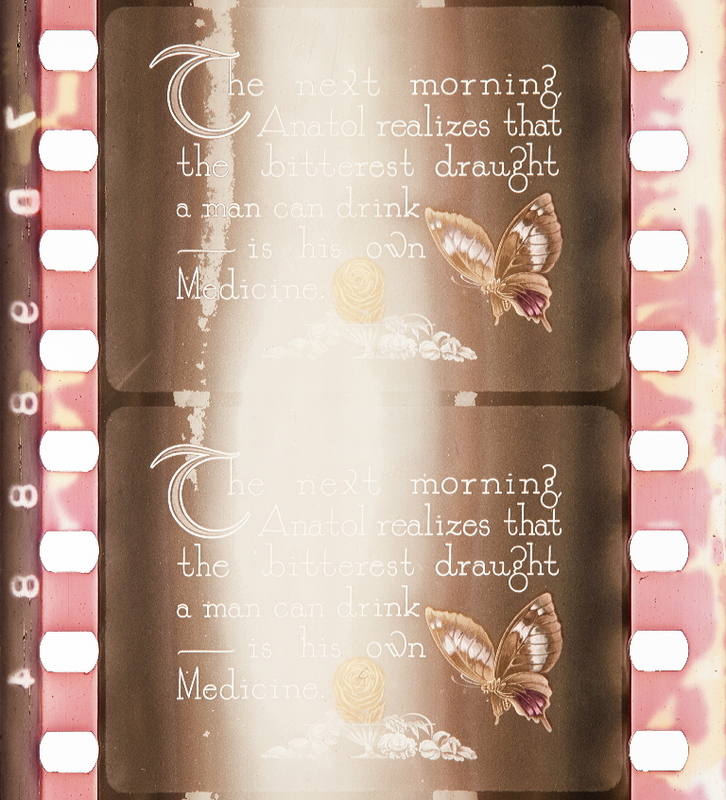 The print to be colored passed into a solution of oxgall and water which softened and wetted the emulsion sufficiently to dissolve and absorb dye from the negative film. Contact time varied depending on the area and amount of dye to be transferred. Time could be changed by changing the position of the keeper roller. 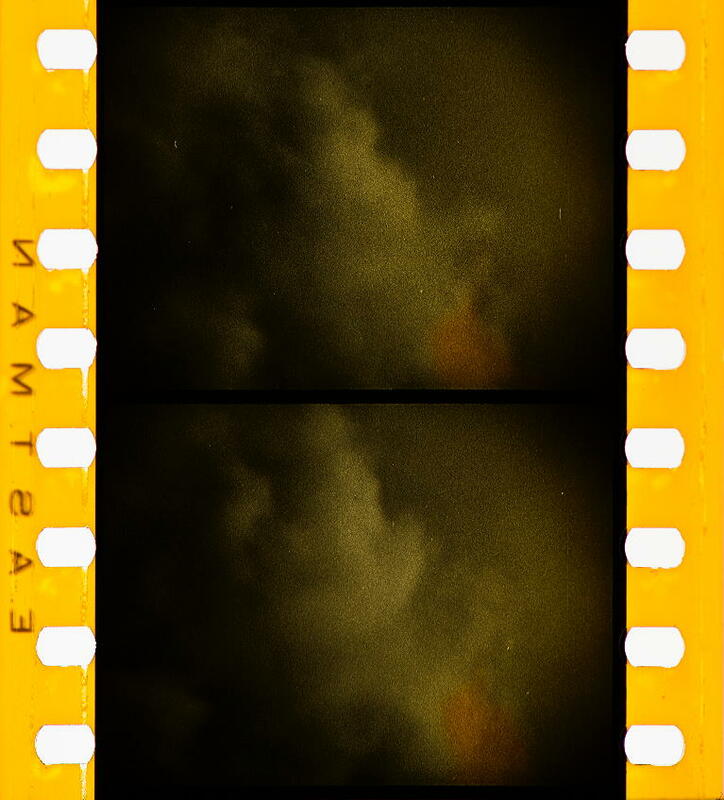 One dyeing of the negative was good for transferring dye of equal density to two release prints. The life of the negative matrix was 40 runs, 14The machines for imbibing the dyes are described in USP 1303836. Each machine had three transferring stations consisting of a large sprocketed drum approximately 12 inches in diameter and two smaller adjustable sprockets. Both the matrix and the release print were stretched onto the large wheel to provide vertical register; horizontal register was provided by micrometer adjustment of the smaller sprockets (Fig. 5). Fig. 5 Handschiegl dye transfer machine. 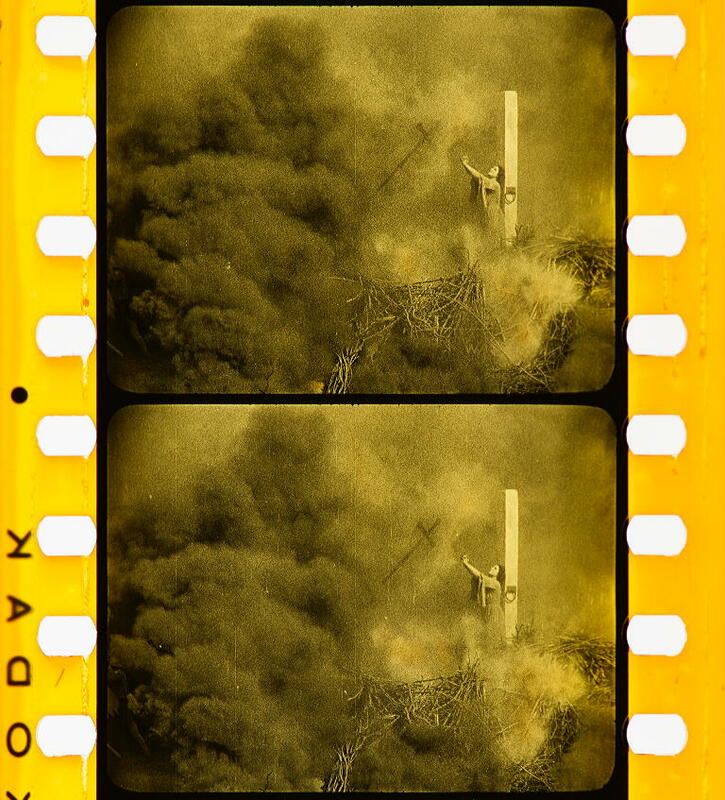 The bleached and dyed negative is brought into contact with the positive on a large sprocket drum for transfer of dye. 10 KELLEY, W. V. D„ “The Handschiegl and Pathéchrome Color Process,” Journal of The Society of Motion Picture Engineers, August, 1931, pp. 230-234. 11 The Autobiography of Cecil B. DeMille, ed. D. HAYNE (Englewood Cliffs, N.J.: Prentice-Hal I, 1959), p. 175. 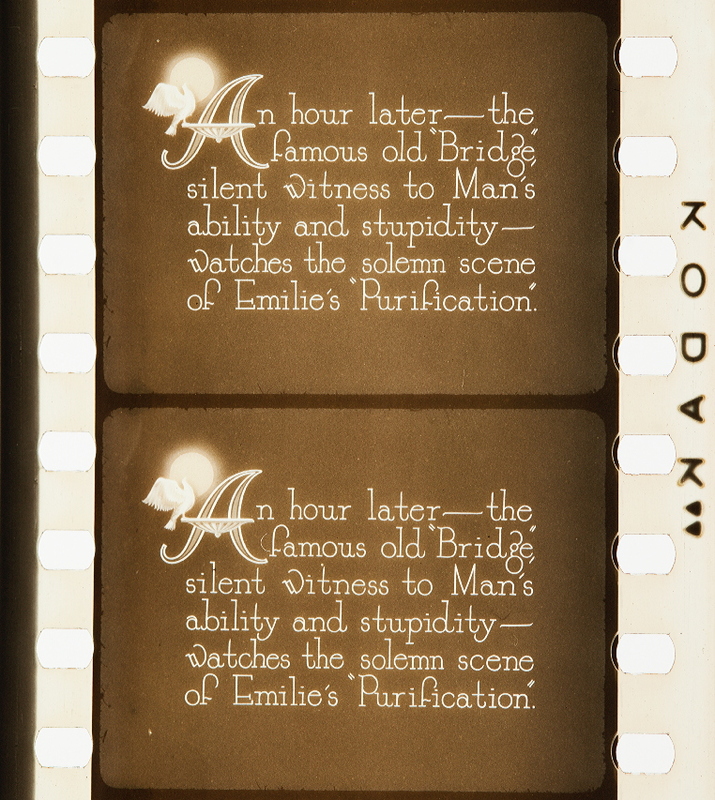 12 KELLEY, W. V. D., “Imbibition Coloring of Motion Picture Films,” Transactions of The Society of Motion Picture Engineers, February, 1927, pp. 238-241. 13 KELLEY, W. V. D., “The Handschiegl and Pathéchrome Color Processes,” loc. cit. “We have been working slowly and cautiously on this process for the past two years,” said Mr. DeMille, “and have studied color photography in all its branches. We have come to the conclusion that color photography, in the sense of absolutely faithful reproduction of natural colors, or any method of coloring where the tints used are of the glaring variety, can never be used universally in motion pictures, for the eye of the spectator would be put to too great a strain, and the variety of the colors would distract the attention from the story values. It would be as though a person looked out of a car window at a highly colored panorama of action and scenery during a two or three hour journey. One cannot look out over fields of brightly colored flowers continuously for even an hour without terrific eye strain. DeMille held to this conviction for many years, and numerous productions of his incorporated the Handschiegl Process — often applying color only to selected areas within a limited number of scenes per picture. “Red irritates one group, another finds blue objectionable and a third set of people balks at yellow. 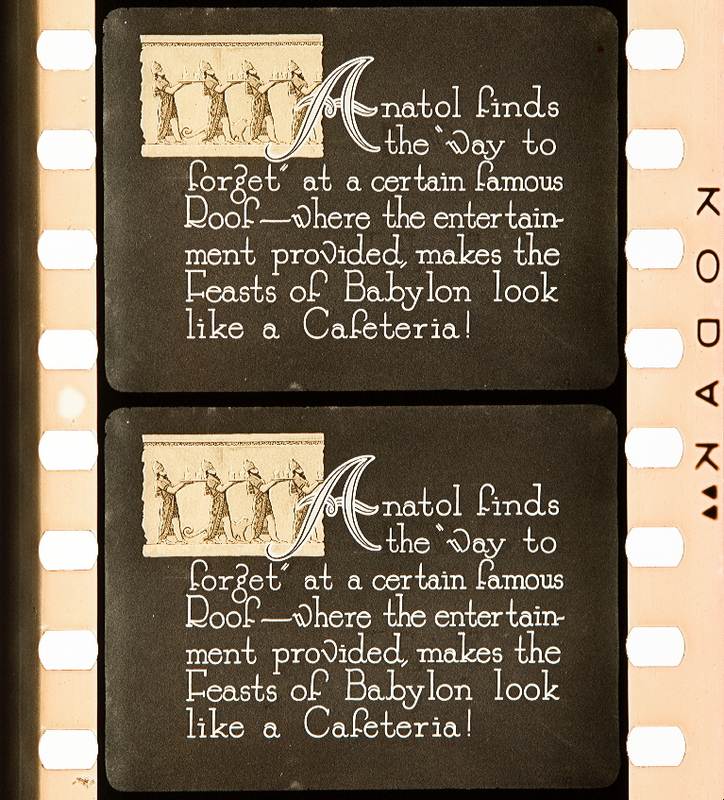 This observation would soon be challenged by Herbert T. Kalmus of the Technicolor Corporation, and a year later DeMille agreed to release The Ten Commandments with “natural color” scenes. 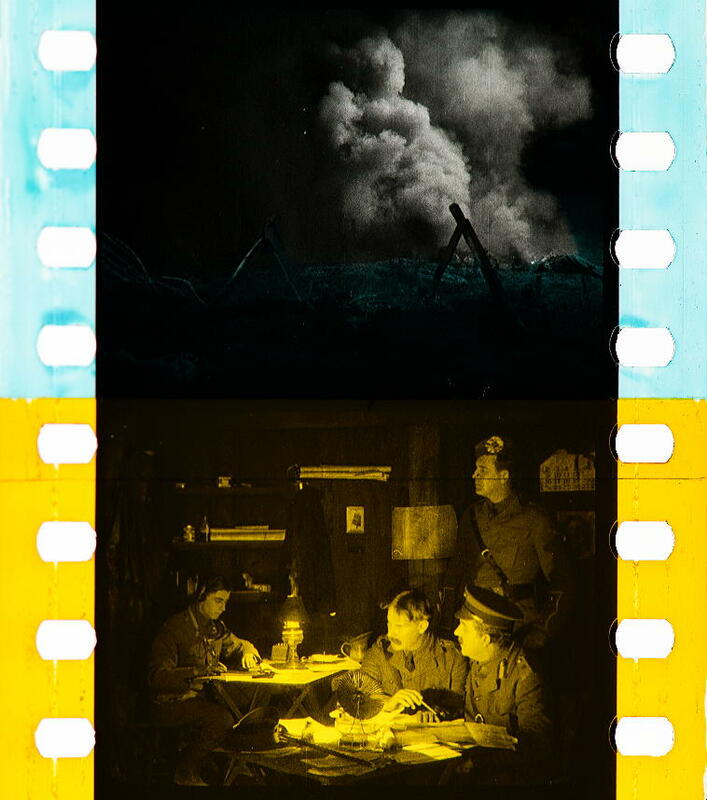 Nevertheless, the subdued, pastel colors of the Handschiegl Process continued to be incorporated in a number of important feature films until 1928. 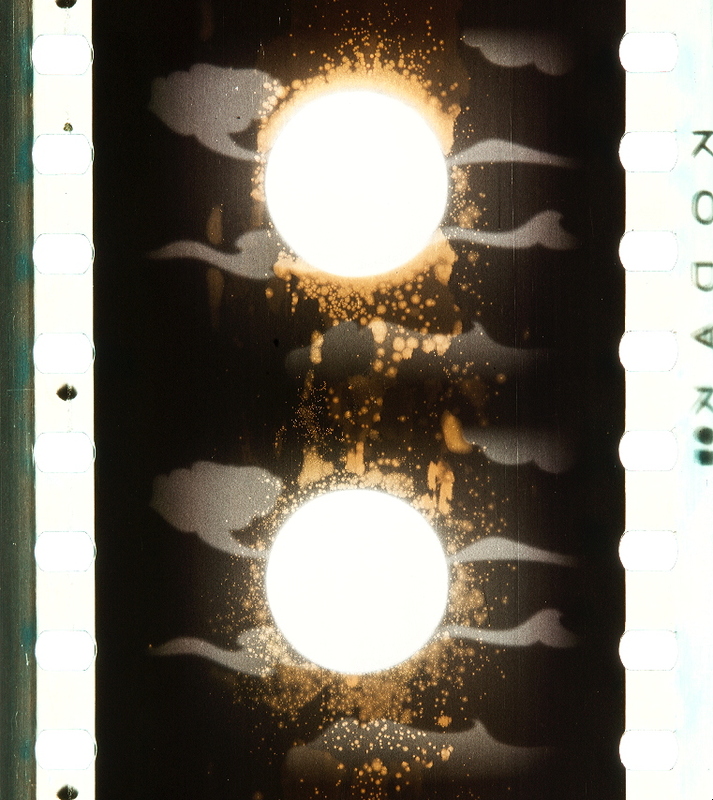 15 Roderick T. Ryan, A Study of the Technology of Color Motion Picture Processes Developed in the United States (Ph.D. dissertation, University of Southern California, September 1966), (Ann Arbor, Mich.: University Microfilms, Inc., 1979), p. 36. 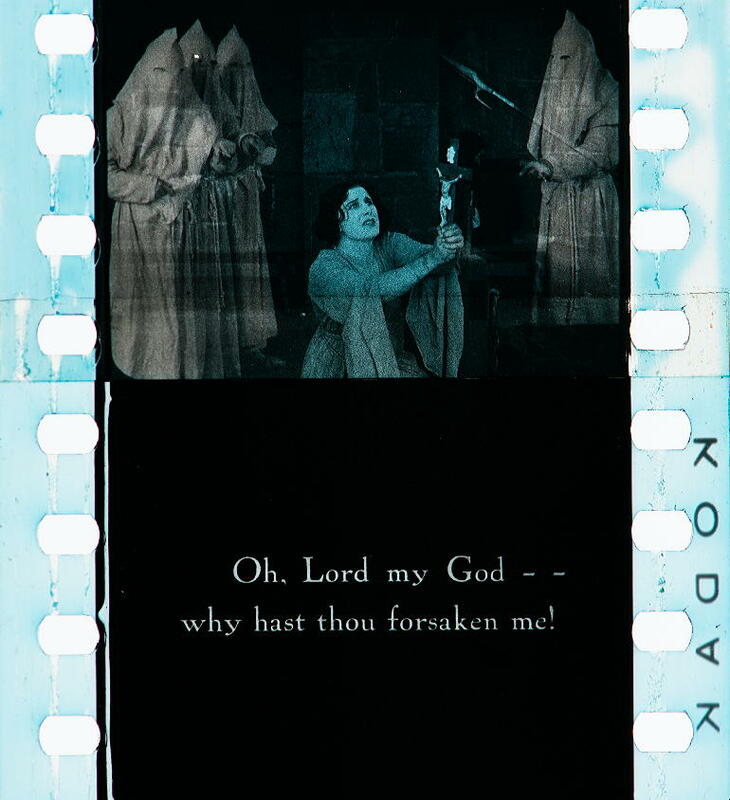 18 Cecil B. DeMille, “The Chances of Color Photography in Moving Pictures,” American Photoplay 17 (January 1923): 15. 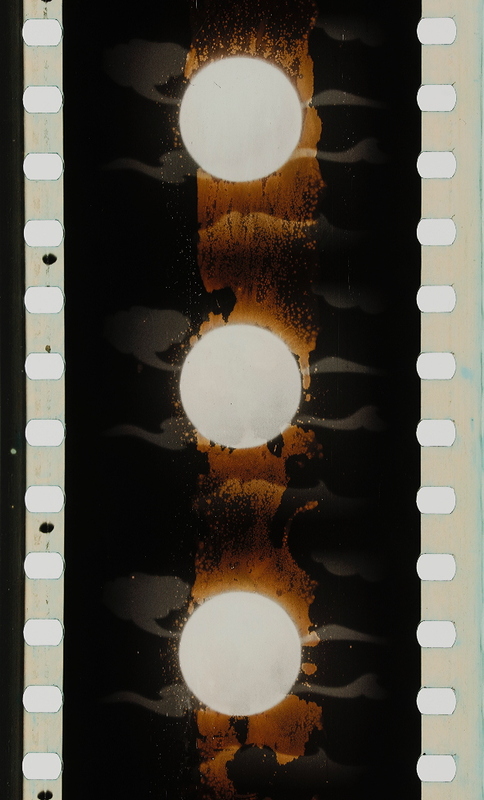 20 William V. D. Kelley, “The Handschiegl and Pathéchrome Color Processes,” Journal of the Society of Motion Picture Engineers 17 (August 1931), p. 230. 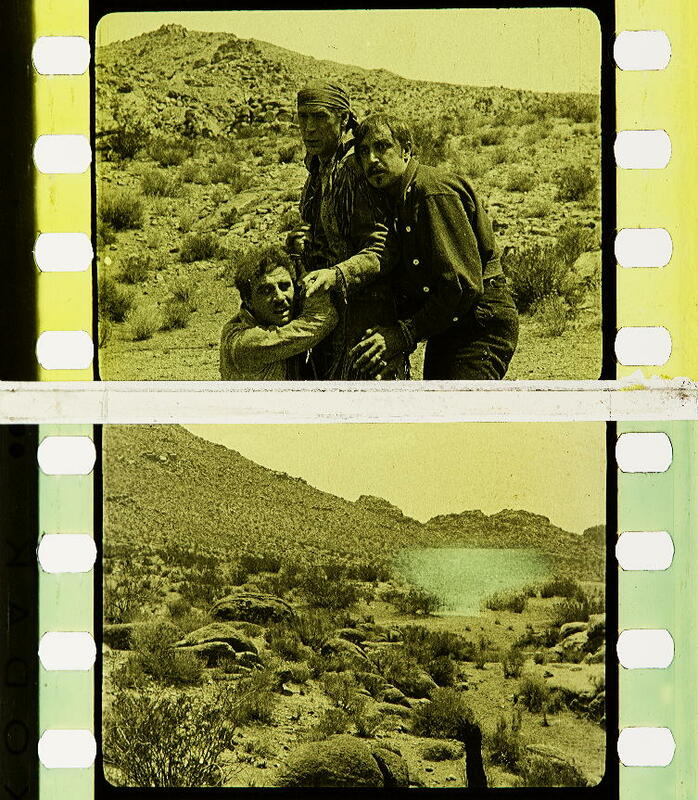 3 Cook, History of Narrative Film, pp. 252-53. 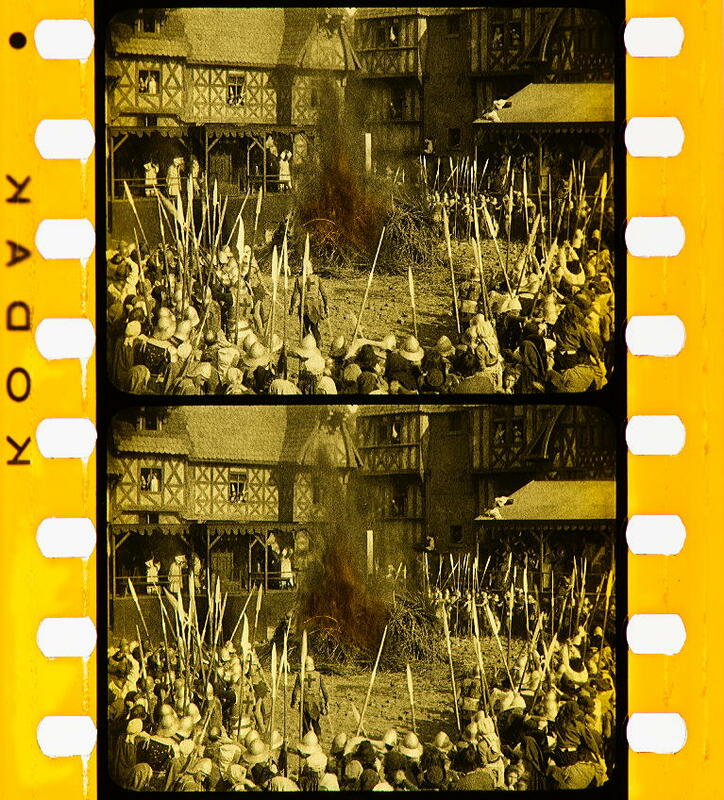 The extent to which D.W. Griffith’s controversial masterpiece The Birth of a Nation (1915) was coloured is far from clear. 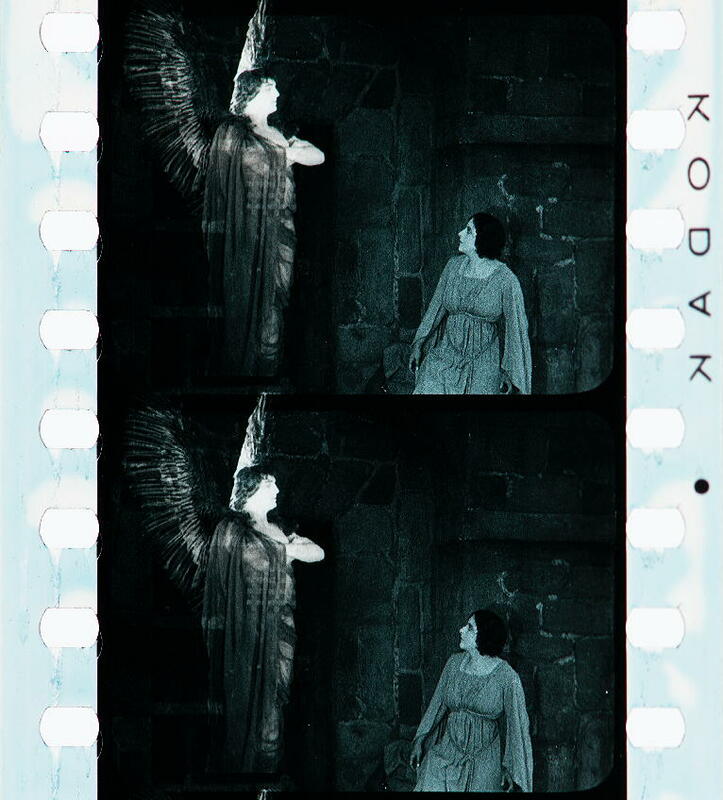 Lillian Gish recalled that some scenes were tinted “to achieve dramatic results and to create mood.” Karl Brown, assistant cameraman on the picture, recalled in an interview (1975) that “no sequences were in black and white, that everything carried some sort of tint to offset the visible electric blue of the projector’s arc.” Lillian Gish with Ann Pinchot, The Movies, Mr. Griffith and Me, London: W H. Allen, 1969, p. 146; John Cuniberti, “The Birth of a Nation“: A Formal Shot-by-Shot Analysis Together with Microfiche.Woodbridge, Conn.: Research Publications, 1979, p. 19, n. 31. 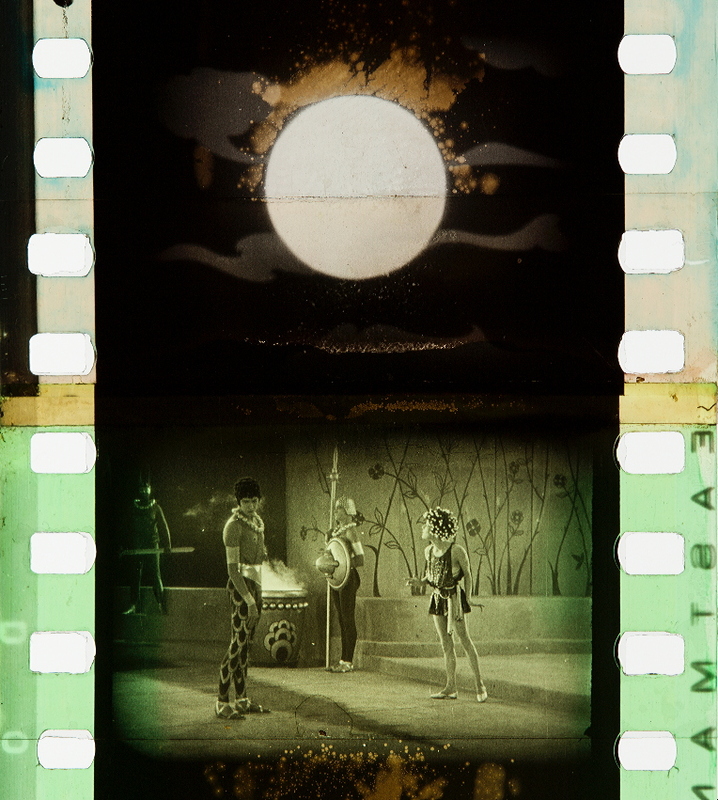 “In a minority of films, color fulfils more subtle functions. Though rare and not necessarily influential, such films constituted a form of “best practice,” and so it is worth looking at a few examples. 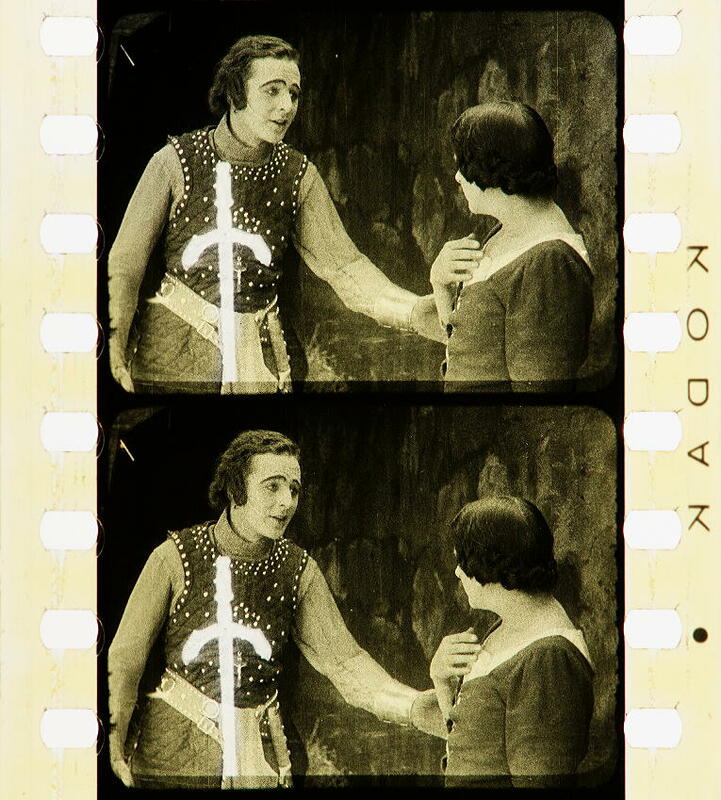 For example, D. W. Griffith’s The White Rose (1923) features a brief red blush. 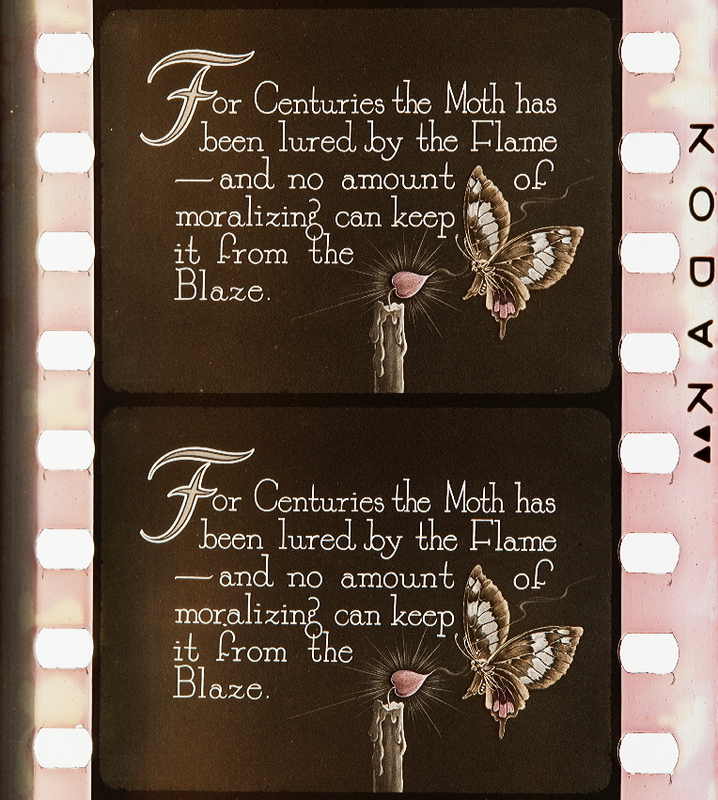 To achieve this effect, Griffith used Handschiegl printing; by doing so, he cleverly subverted the cliché that applied color was for surfaces only. 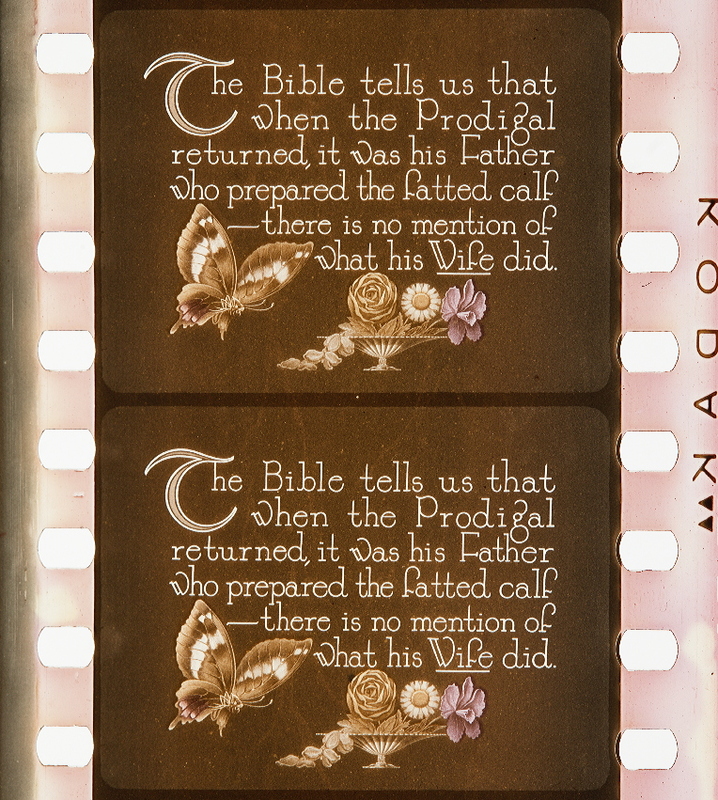 Though printed onto the skin of the film, the red appears to emanate from underneath it. The same trick is used by the aging nymph Celia in Jonathan Swift’s poem The Progress of Beauty, but with less success; every morning Celia tries to “teach her cheeks again to blush,” but colored pigments cannot bring back the essential reds of a youthful face (Swift 1983: 193). 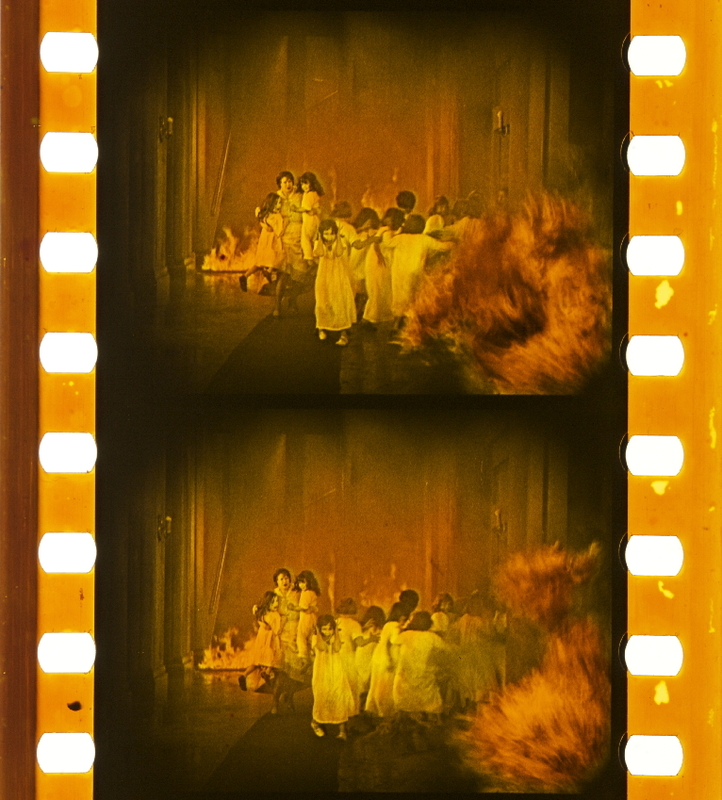 In certain prints of Greed (1924), Eric von Stroheim also used Handschiegl color, integrating it into the film’s narrative. According to Jay Leyda, not only was the protagonist’s fateful stash of gold yellow, so too were “gold teeth, brass beds, gilt frames and canary” (Koszarski 1999: 14). Koszarski, Richard. 1999. “Reconstructing Greed. 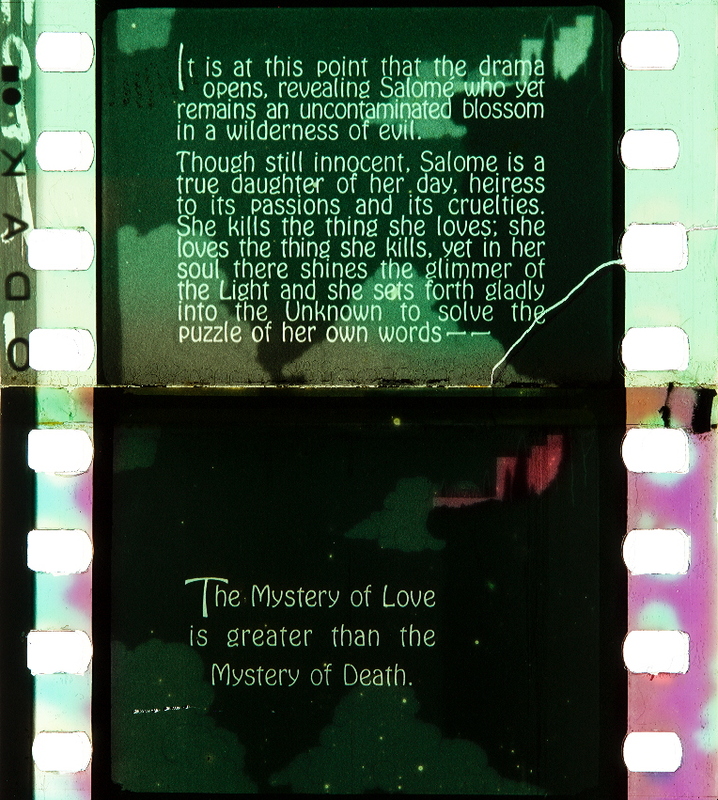 How Long, and What Color?” Film Comment 35 (6): 10–15. Da sich mit ihnen keine Naturfarben wiedergeben lassen, bilden die Techniken der Kolorierungen und Virage streng genommen eine eigene Kategorie. Im Grunde ein Ersatz und eine Behelfslösung, erreichten kolorierte und viragierte Filme jedoch bis in die 20er Jahre hinein eine so große Verbreitung, dass sie sich stärker im kollektiven Gedächtnis verankert haben als die zeitgleiche echte Farbkinematographie. Die Virage-Technik, die ebenfalls bereits kurz nach 1895 ausgeübt wurde, bestand in der monochromen Einfärbung schwarz-weißen Filmmaterials. Je nach Schauplatz und Aufnahmegegenstand wurde eine passende Grundfarbe gewählt, um die Stimmung der Sequenz zu verstärken: z.B. Blau für nächtliche Szenerien, Gelb für Interieurs, Dunkelrot und Violett für Kaminbeleuchtung oder Kerzenschein, grelles Rot für Feuersbrünste und dramaturgische Höhepunkte. 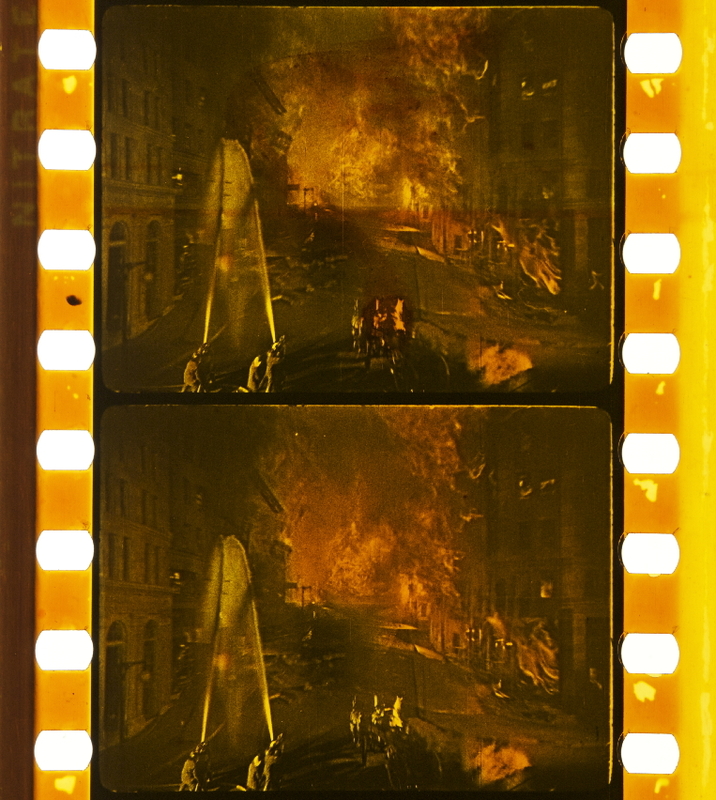 Die im Vergleich zur Kolorierung preiswertere Virage gewann in den 1910er Jahren eine solche Beliebtheit, dass die Mehrheit aller Filme auf viragiertem Material verbreitet wurde. “Peraltro, DeMille non teneva in gran conto i sistemi di colorazione monocromatica e manifestò una certa preferenza per le tinte chiare e pastello, probabilmente affinché non interferissero con gli effetti di luce che queste dovevano accompagnare 21. L’insoddisfazione per la convenzionalità delle soluzioni lo spinse a mettere a punto, in questi stessi anni, un’originale tecnica di colorazione. 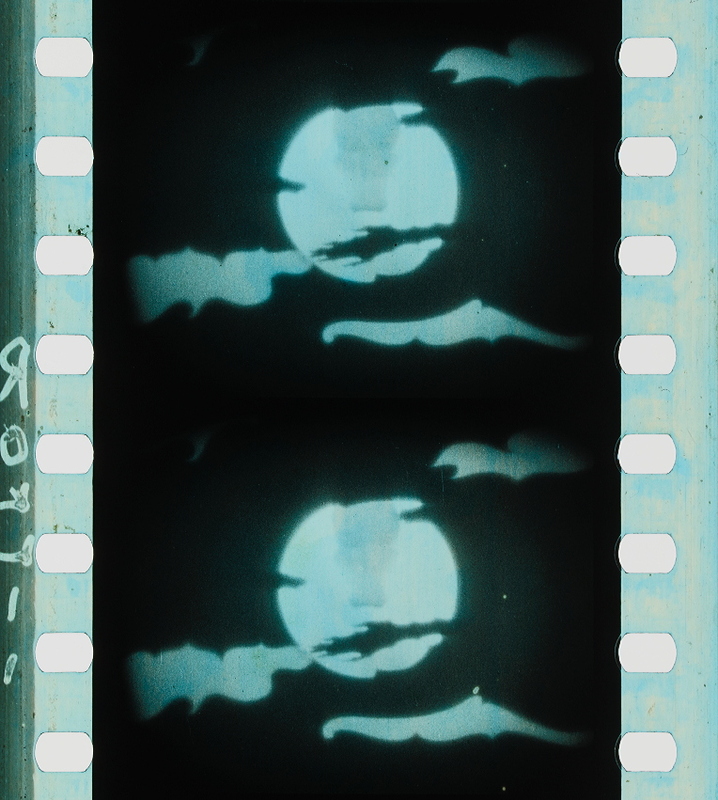 Il sistema fu portato a compimento nel 1916 da un tipografo incisore che cercò di adattare al cinema il principio della litografia22. 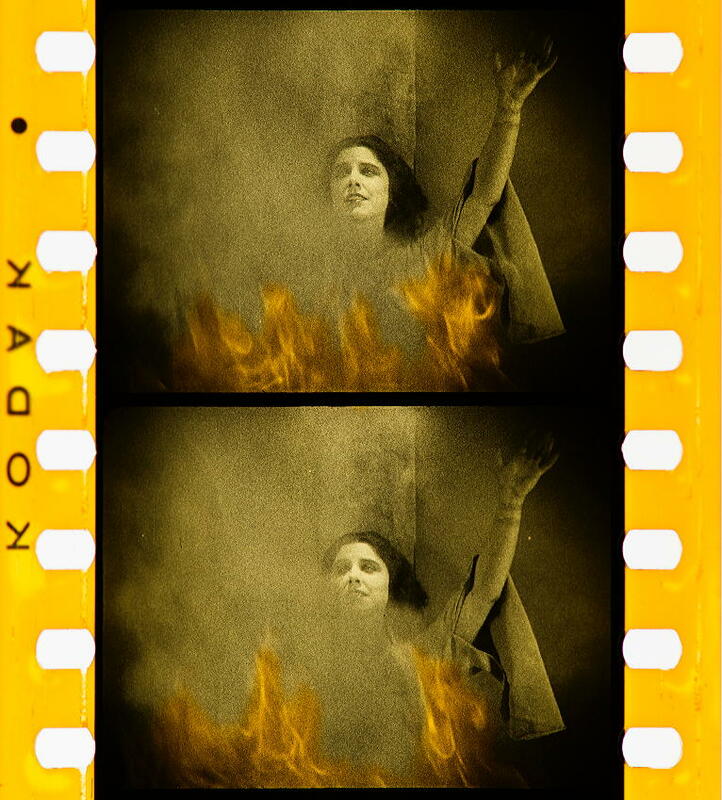 Il processo Handschiegl, dal nome del suo inventore, fu testato dallo stesso DeMille per alcune sequenze di Giovanna d’Arco (Joan the Woman, 1916): nel finale, le fiamme del rogo che avvolgono il corpo di Giovanna furono colorate in modo da produrre un effetto di movimento delle fiamme e del fumo assai realistico, in grado di suscitare più forti sensazioni sugli spettatori23. Nel 1927, in seguito alla morte di Handschiegl, che aveva l’abitudine di supervisionare ogni fase della lavorazione, il processo non fu più utilizzato: la forte personalizzazione ne limitò in modo evidente la diffusione24. 21 DeMille sembra piuttosto considerarli un’aggiunta necessaria: “l’imbibizione e il viraggio della pellicola sono come la cornice del quadro: gli danno una certa decorazione ma non vi aggiungono alcun elemento sostanziale. Spesso giriamo scene ambientate al chiaro di luna e di giorno nelle stesse condizioni. Il bagno in cui la pellicola viene immersa successivamente le dà i toni diurni o notturni” (DeMille 1991, p. 323, trad. riveduta). 22 Sistema noto anche come Wyckoff-DeMille: le tinte, fino a un massimo di tre, sono trasferite sulle aree selezionate di un positivo in bianco e nero per mezzo di matrici. Se l’effetto prodotto ricorda quello del pochoir, il processo tipografico di trasferimento del colore non è troppo dissimile da quello che, su base fotografica, avrebbe adottato la Technicolor a partire dagli anni venti. Per la tecnologia del sistema, cfr. Kelley 1931. 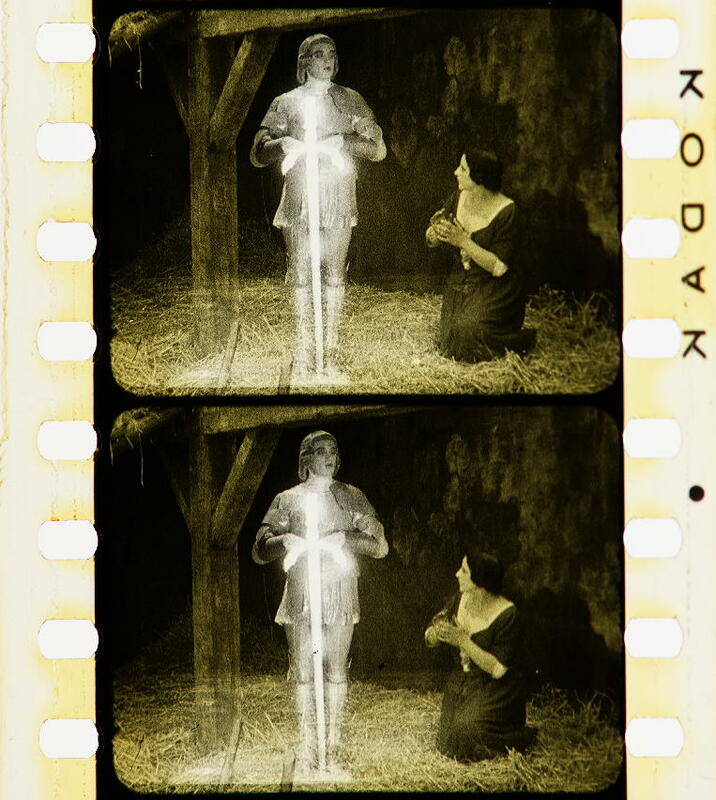 23 Sedici anni prima, lo stesso Méliès aveva tentato un’operazione analoga per Jeanne d’Arc (1900), avvalendosi delle possibilità offertegli dalla colorazione manuale. 24 Risulta infatti che il sistema sia stato impiegato soltanto per singole sequenze di film (cfr. Cherchi Usai 1995, pp. 102–103). 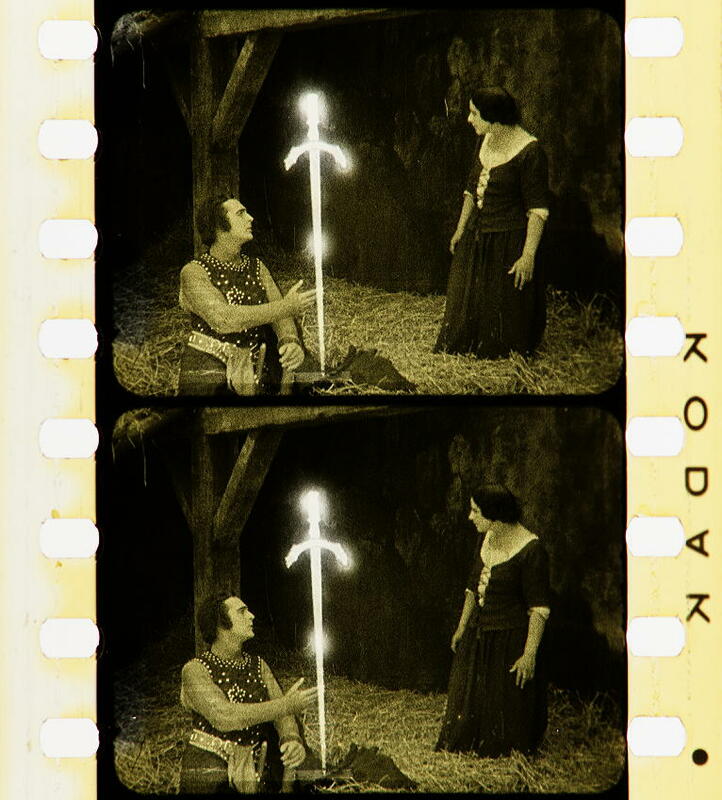 Aumont, Jacques a cura di (1995a), La couleur en cinéma, Mazzotta-Cinémathèque française, Milano-Paris. 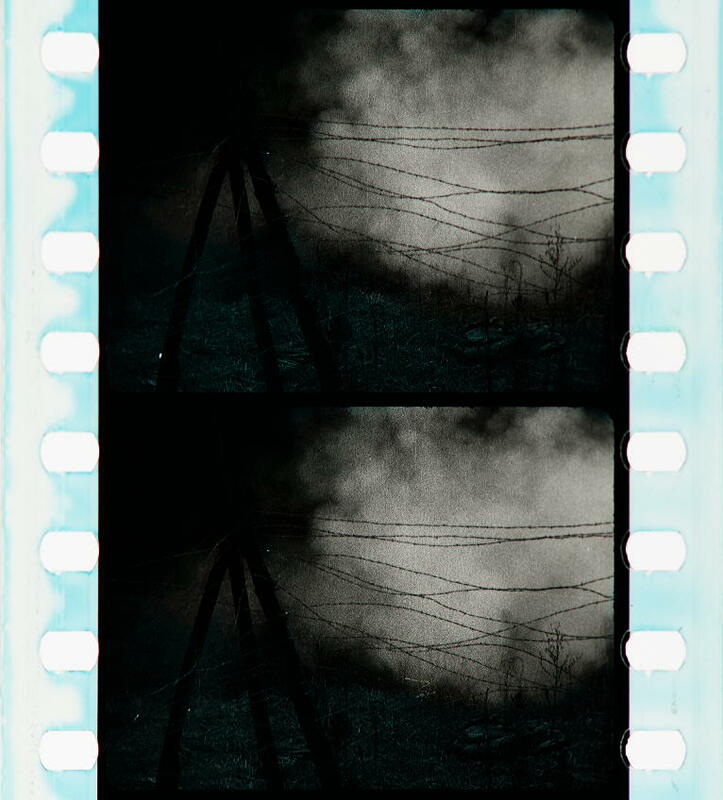 Cherchi Usai, Paolo (1995), Le nitrate mécanique. L’imagination de la couleur comme science exacte (1830-1928), in Aumont, a cura di, 1995a, pp. 95–109. Cherchi Usai, Paolo; Codelli, Lorenzo, a cura di (1991), L’eredità DeMille, Biblioteca dell’immagine, Pordenone. Das Springen der Handlung zwischen verschiedenen Schauplätzen, zum Beispiel zwischen einem Arbeitszimmer des Hausherrn in Sepia und einem Salon des Hausfreundes in Gelborange, war wegen der unterschiedlichen Viragierung leichter nachvollziehbar (Regel 1985, 8). Als Ortsindikator diente die Farbe zur Markierung bestimmter Schauplätze in Sequenzen mit häufigem Wechsel zwischen gleichbleibenden Szenerien. Der primäre Zweck war also die Kontrastierung der Schauplätze durch Farbe; zugleich wurde die jeweilige Örtlichkeit mit der einmal definierten Ortsfarbe wiedererkennbar gemacht. Unbedingte Voraussetzung für diese Art dramaturgischer Farbgebung war jedoch, daß sie beibehalten werden mußte; zumindest solange, wie es im Kontext der Sequenz wichtig war, daß der Wiedererkennungseffekt beim Wechsel auf einen bereits eingeführten Schauplatz garantiert blieb. 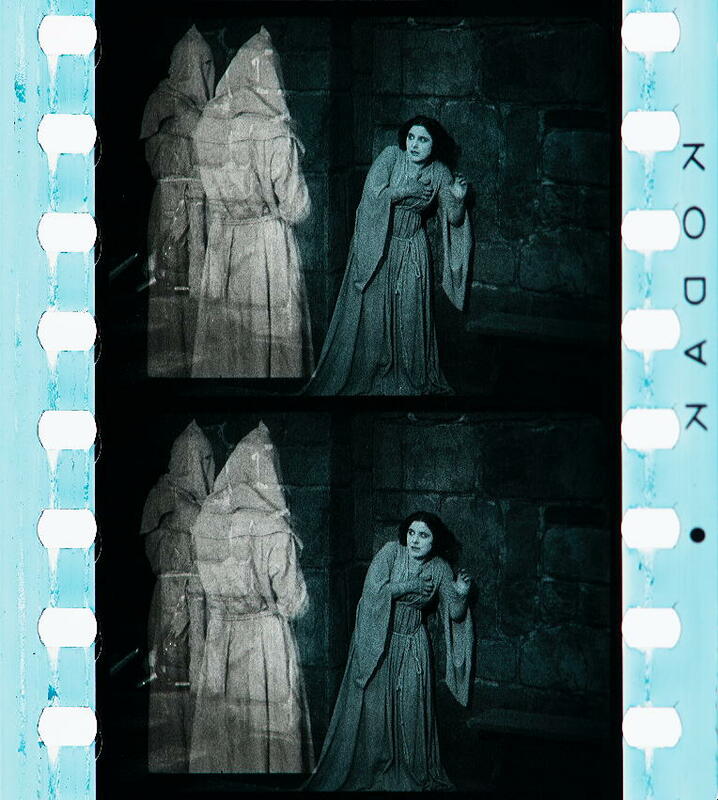 In The Phantom of the Opera (Rupert Julian & Edward Sedgewick, USA 1925) beispielsweise dient Violett als Standardfarbe für die Innenräume des Opernhauses (für die Bühne und die Kulissen, den Zuschauersaal und das Foyer) und wird damit zur meist verwendeten Farbe der ersten Filmhälfte. In ortsbezogenen Kontrast gesetzt ist sie hier mit Gelb, in welches die Szenen im Büro der Direktion der Oper, in und vor der Garderobe der Sängerin Christine Daaé sowie zwei kurze Einschöbe, die im Haus ihres Geliebten Raoul bzw. im Büro des Polizeipräfekten spielen, getaucht sind. 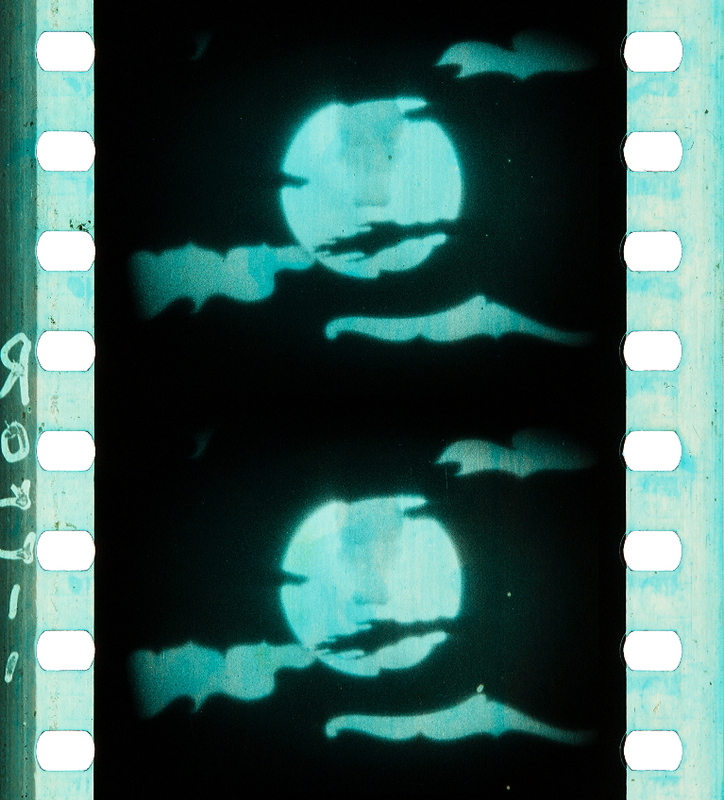 Weiterhin manifestiert sich ein ortsbezogener Kontrast zu Blau, der Standardfarbe für “Nacht”, mit der in diesem Film – in dem es so gut wie keine Szenen gibt, die bei Tag spielen – das “Außen” versinnbildlicht und in Gegensatz zum “Innen” (Violett, Gelb) im Opernhaus oder – in der zweiten Filmhälfte – (Grün) in den Katakomben gesetzt wird. BLAU: Auf dem Dach der Oper, Nacht. VIOLETT: Foyer, Gänge in der Oper. Die offensichtliche farbige Ortsbestimmung korrespondiert in beiden Szenen mit einer eröffnenden Totalen, einerseits auf das Dach der Oper, von dem aus man den Blick über Paris erahnen kann, andererseits auf das große Foyer, in dem sich zahllose Tanzende bewegen; ein alter Kunstgriff der Montage, um dem Zuschauer eine Orientierung innerhalb bzw. überhaupt eine Identifizierung des Schauplatzes zu ermöglichen. In diesem Fall also geht die gängige Assoziation (und nichtsdestotrotz weiterhin immanente Bedeutung) der Farbe Blau als “Nacht” über in die Bedeutung “Außen”. Tatsächlich gibt es in The Phantom of the Opera nur eine Tageslichtszene im Freien; nämlich als am Tag nach der “Kronleuchterkatastrophe” auf der Straße die Zeitung verkauft wird, die darüber berichtet. Interessanterweise ist diese kurze Szene in Gelb gehalten, das bisher nur “neutralen” Innenräumen vorbehalten war. Inwieweit in diesem Zusammenhang der Farbe Blau der zeitliche Gegensatz in Form des “Tag – Nacht” zugunsten des räumlichen Verhältnisses von “Innen – Außen” zurückgetreten ist, verdeutlicht noch einmal, wie wichtig zuweilen die Ortsbestimmung ist, daß sie gegenüber der Zeitebenenbestimmung beispielsweise (s. Punkt 2,2) Vorrang hat. Die letzte noch verbleibende Möglichkeit der Farbgebung mit indexikalischer Struktur, die Zuordnung einer bestimmten Farbe zu einer bestimmten Filmfigur im Sinne eines Leitmotivs, ist ein relativ selten nachzuweisender Fall. Als Musterbeispiel hierfür kann jedoch wiederum The Phantom of the Opera gelten, in welchem sich diese Vorgehensweise sehr auffällig manifestiert. Die nachfolgende Einstellung zeigt den Schemen des Phantoms als Schatten an einer Wand, ebenfalls in Grün. Im nachfolgenden Dialog sind die Zwischentitel unterschiedlich viragiert, um dem Zuschauer die Zuordnung der entsprechenden Dialogpassage zur jeweils sprechenden Figur zu erleichtern. Die Dialogsätze des Phantoms in Grün (was das Phantom – verborgen hinter einer Wand – zu Christine sagt) stehen in Kontrast zur Antwort Christines (in Gelb), die in ihrer Garderobe auf die Stimme aus der Wand lauscht. Auffällig hierbei ist, daß die klassische Zeichenstruktur der Dialogzuweisung im Stummfilm trotz der farblichen Unterschiedlichkeit der Zwischentitel dennoch beibehalten ist; folglich ist die Szene nicht bereits auf eine beabsichtigte farbliche Unterscheidung hin montiert worden. 1. Der Zwischentitel wurde durch Anführungszeichen (“”) als Dialog ausgewiesen – im Gegensatz zu erläuternden Inserts. 2. Der Dialog-Zwischentitel wurde zwischen zwei gleiche Einstellungen der den Mund bewegenden Figur montiert. 3. Zumindest der erste Zwischentitel ist adressiert. (“‘Christine,…(Text)’”). Hierdurch ist der Adressat des Dialogsatzes identifiziert und dem Zuschauer als nicht identisch mit dem Sprecher ausgewiesen. Dem denkbaren Einwand, es könne sich hier ebensogut um eine ortsbezogene Farbgebung handeln, da sich die beiden Figuren Christine und Phantom an verschiedenen Orten aufhalten (eben diesseits und jenseits der Wand), läßt sich entgegenhalten, daß die Systematik von Grün als Leitfarbe des Phantoms in der ersten Filmhälfte konsequent durchgehalten ist: In der Szene beispielsweise, als das Phantom den großen Kronleuchter im Zuschauersaal absägt, wird die ortsbezogene Farbgebung zugunsten der personenbezogenen aufgegeben. Schauplätze, die nach der ortsbezogen definierten Farbe Violett sein müßten (bei der Flucht des Phantoms über die Lichtböden etwa) sind mit einem Male ebenfalls Grün.